Although persevering one who can say how many there are copies of the Statue of Liberty, nowadays! 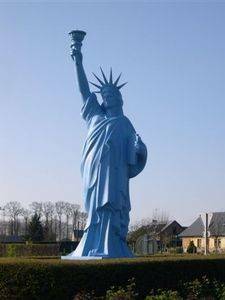 This statue is one of the most copied in the world. 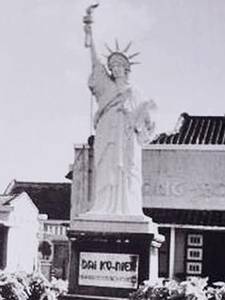 The most interesting predate the construction of the real statue, and dates from the time of Bartholdi, ie of the late nineteenth century. There are nowadays widely, of all sizes, from all subjects. The list below is not exhaustive and does not pretend to be, but it gives an idea of research opportunities to detect them all. 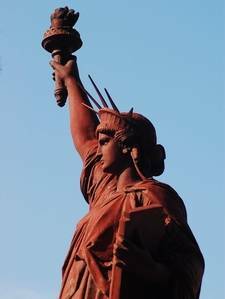 Note that the name "Statue of Liberty" is not trademarked, so anyone can create and name a work and without it will block anyone. 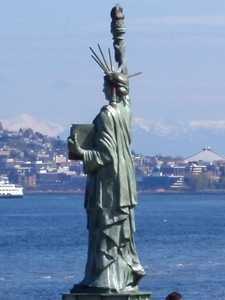 That is why there is all over the World Statues of Liberty that does not look to that which this site speaks. They are not listed here, otherwise the list would be endless. 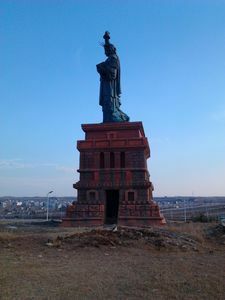 By way of example, include the Statue of Liberty in Hungary, on top of the ancient fortress overlooking the capital. 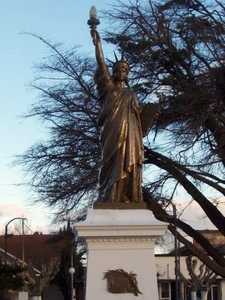 There is also a female statue, but she waved both arms to hold large protective sheet. 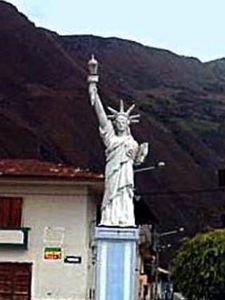 The Statue of Liberty found in Colombia represents a woman standing upright, sword in hand. So nothing to do with the New Yorker statue, but it had to be said here before the list of the statues that are intended to be the most perfect possible aftershocks. In the US, the replicas are many, of course. You should know that in 1950 a businessman, a certain Whitaker, a native of Kansas City, melted 200 copies it distributed everywhere on the American territories. He used it for the Boy Scouts, who adhered to the project. This is called nowadays the operation Strengthening the arm of Liberty. 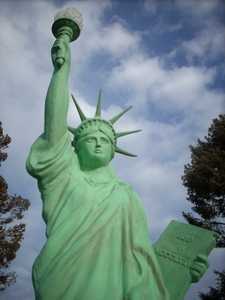 Once Statue of Liberty advertising, as there are many in the world. It is quite unsuccessful, it must be said. Her stern face expresses more aggressiveness as serenity, her outstretched arm is too short, the tablet too far away from her body, and the folds of her gown fell badly. Looks like she took a little weight too ... 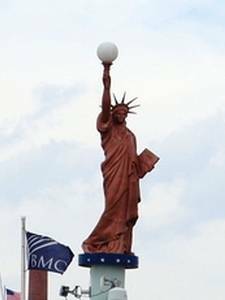 It is perched on a promotional stand at the entrance of Primo coffee, outside the New York Bar and Grill at the Marion Shopping Centre. This bar is themed New York, both inside and out. 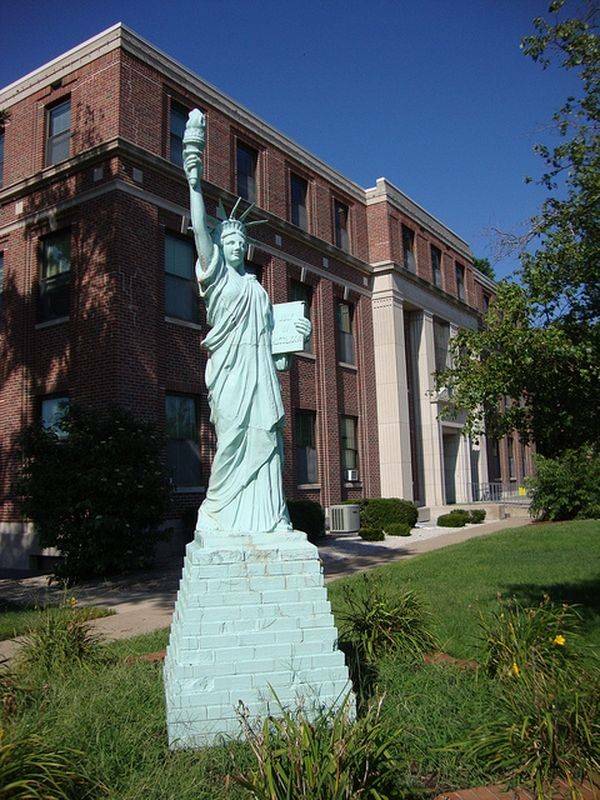 Very nice replica of the Statue of Liberty, this copy is plastic bright green which gives it a real aspect oxidized copper. 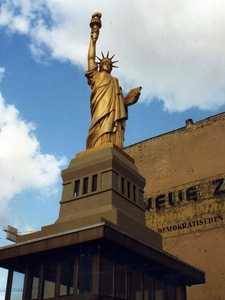 Hard to say where exactly this statue, except that it is in Berlin, and is rather recent. You still have to emphasize the fact that it is stylized, ie it has not as detailed as other replicas. For example, the torch is a simple cylinder. Unfortunately she lost two rays of her crown. 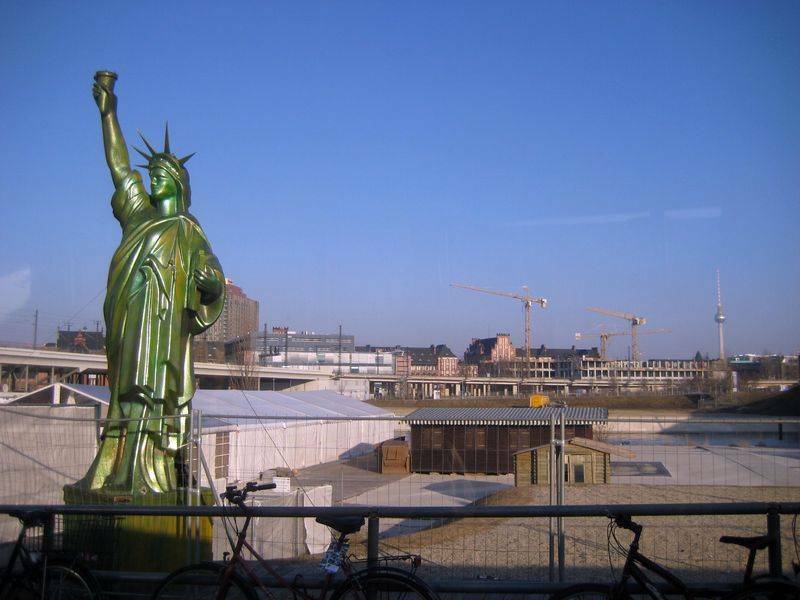 This beautiful statue of liberty no longer exists, it has been a time to Checkpoint Charlie in Berlin, where she was still in 1996. Checkpoint Charlie was the passage between Eastern Europe and 'Western Europe in the time of the Cold War. 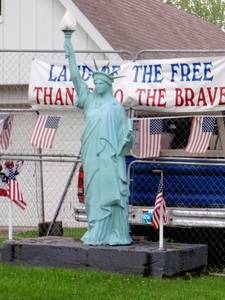 The presence of this statue was a symbolic value even more than elsewhere. From a technical perspective, this copy is really well made, it perfectly copies the folds of the gown, wearing the tablet, and even the torch is very well imitated. The base, it is simpler but it worked enough to recall the original base, neo-classical style. 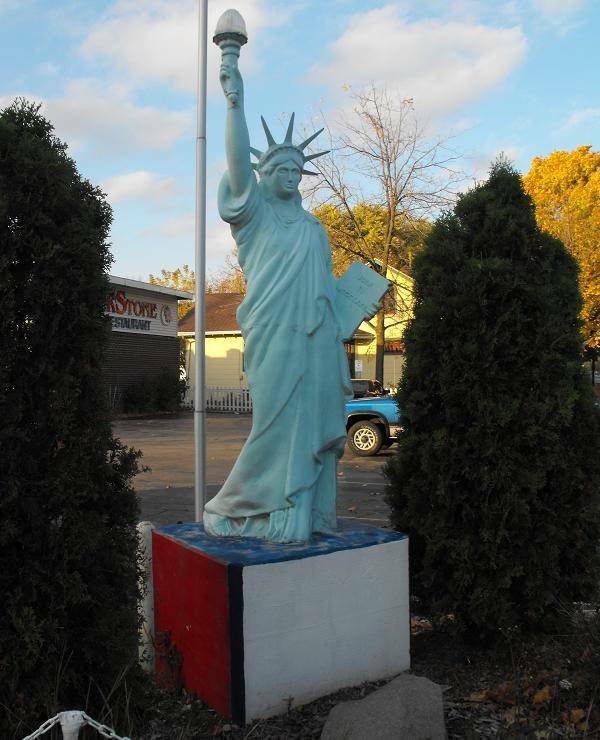 This statue of nearly 10 feet high is located in a parking lot used car. 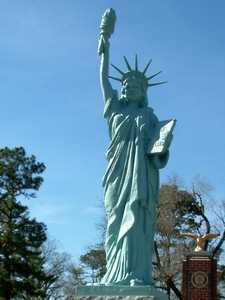 The statue can be seen at any time, although it is private land access is free. 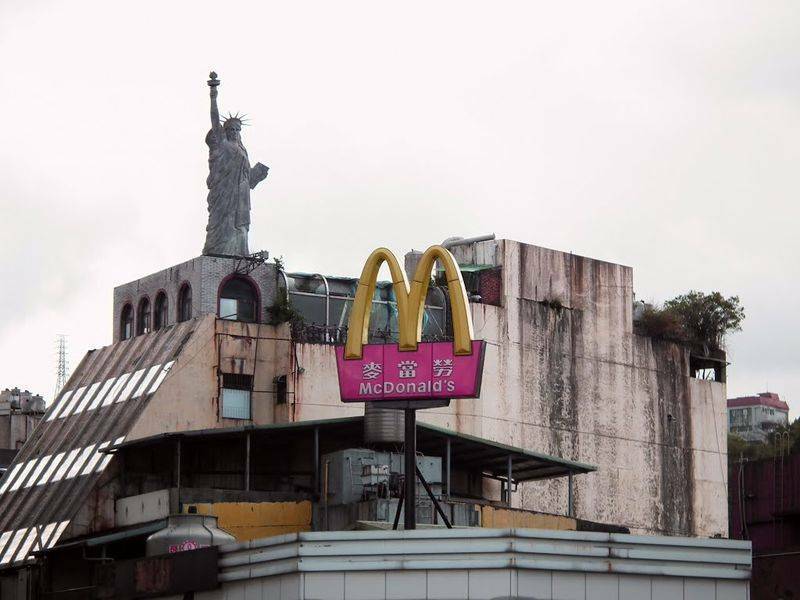 To find your way, right after, there McDonald. This is in Soltau, in Lower Saxony, lies Heide Park, the largest amusement park in Germany in size. 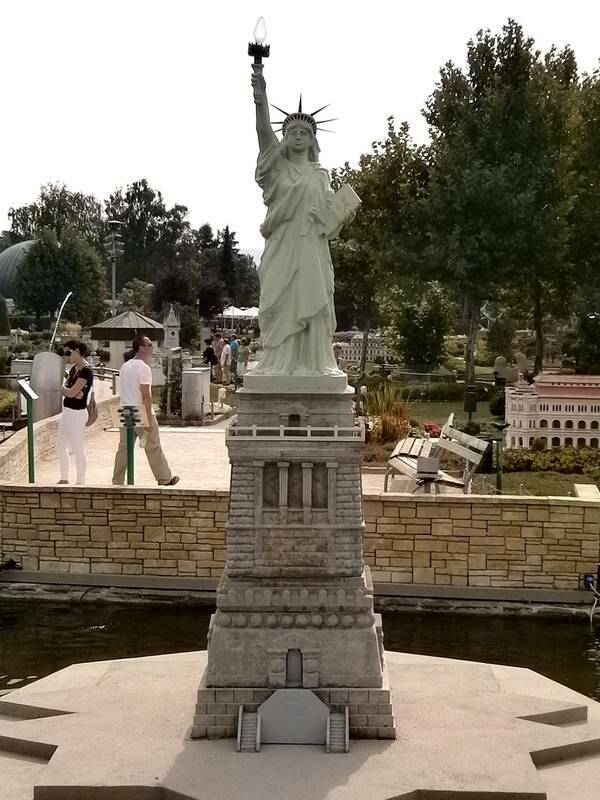 In the center there is an artificial lake and its banks, a huge statue of Liberty, which was brought here by crane. It was mounted in several times. 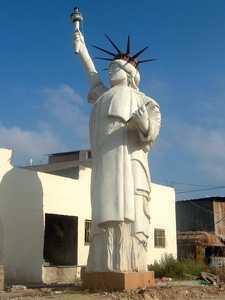 Its size is half that of the original statue is 23m high, making it the largest replica built to date. 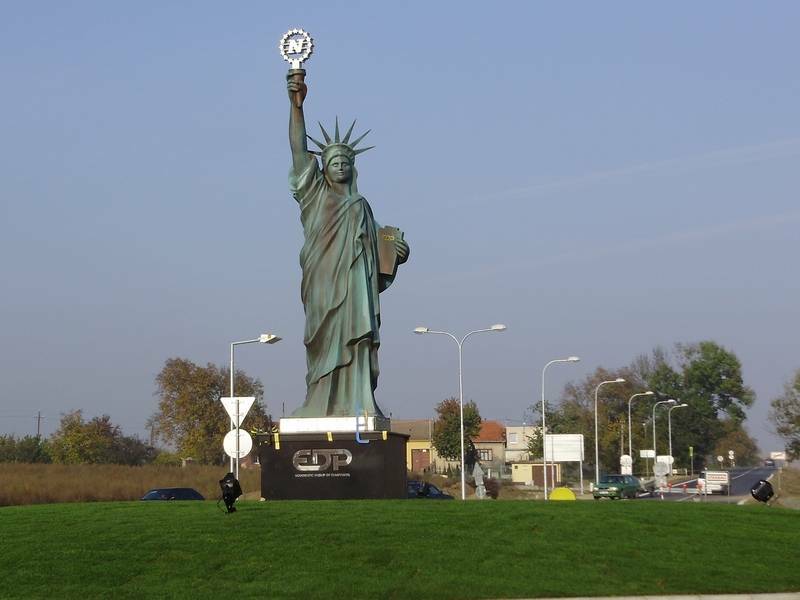 Mounted on a special pedestal, reaching the total size of 35m. It is concrete projected on a polyester shell, all on a metal frame. 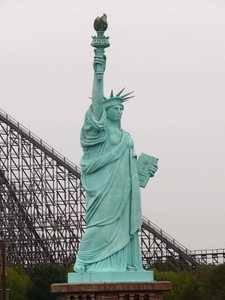 When it opened in 1986 the amusement park received a telegram from Ronald Reagan, the US president in office at that time, on the Announcement of the feat that made the erection of such a statue Europe. All still weighs a total of 28 tonnes. 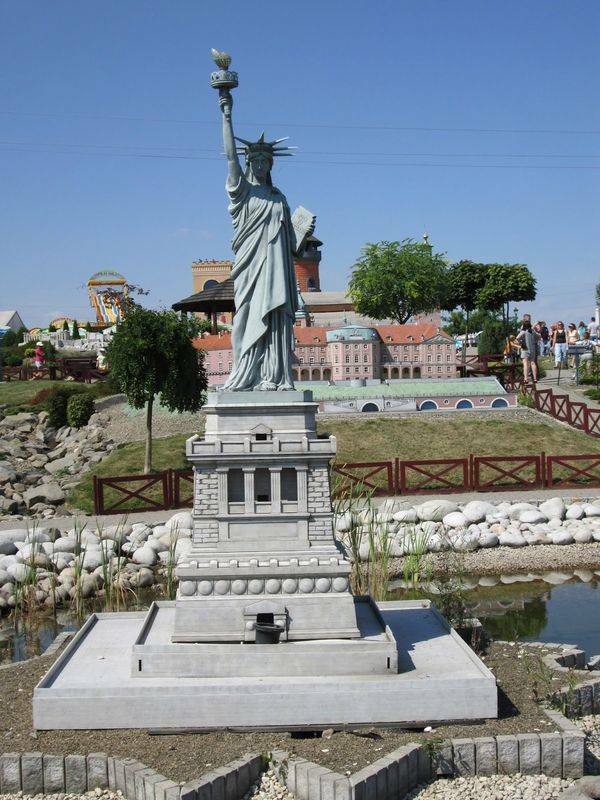 In Austria, there is a Replica of the famous Statue of Liberty in the Minimundus park, which presents the monuments of the World in reduced form. In Vienna there is another amusement park, the "Vienna's Prater Amusement Park". He found there a little game, the "Sea Cruiser" for children, a remote-controlled boat steering play. They are racing around a small Statue of Liberty, poorly maintained enough it must be said. She is about 3 feet high. 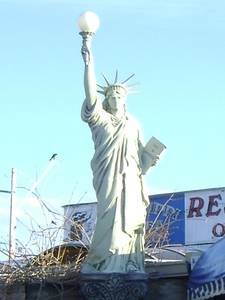 Visitors can see a very large statue of Liberty in Adelaide, outside a shopping center. 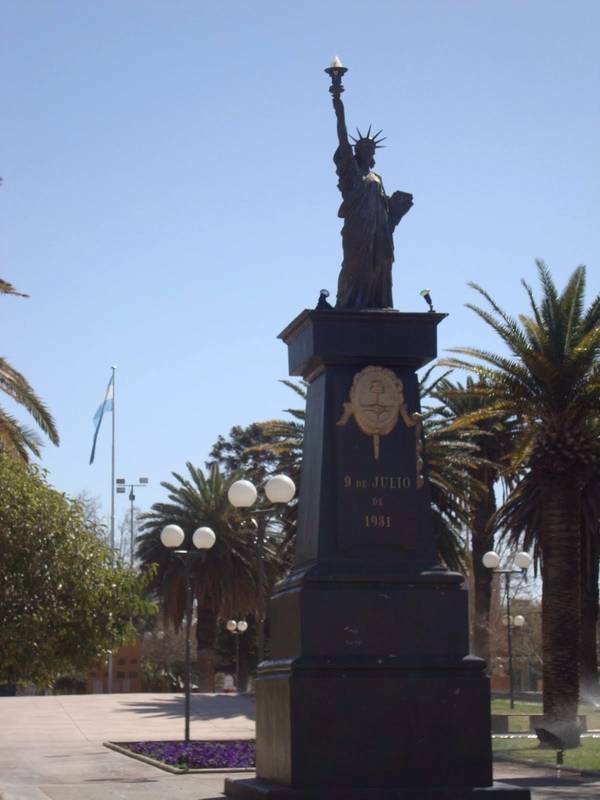 In Argentina there is a copy near Buenos Aires, on the town square Barrancas de Belgrano. 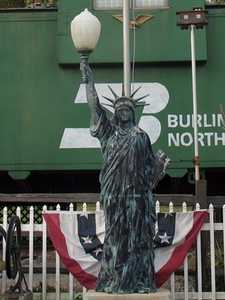 This statue is made of iron, it was purchased by the town in 1910. It was probably melted in the same mold as that of Paris. General Piran is a town in the province of Buenos Aires in the South. In Ocean aboard, she had 2,896 inhabitants in 2001. 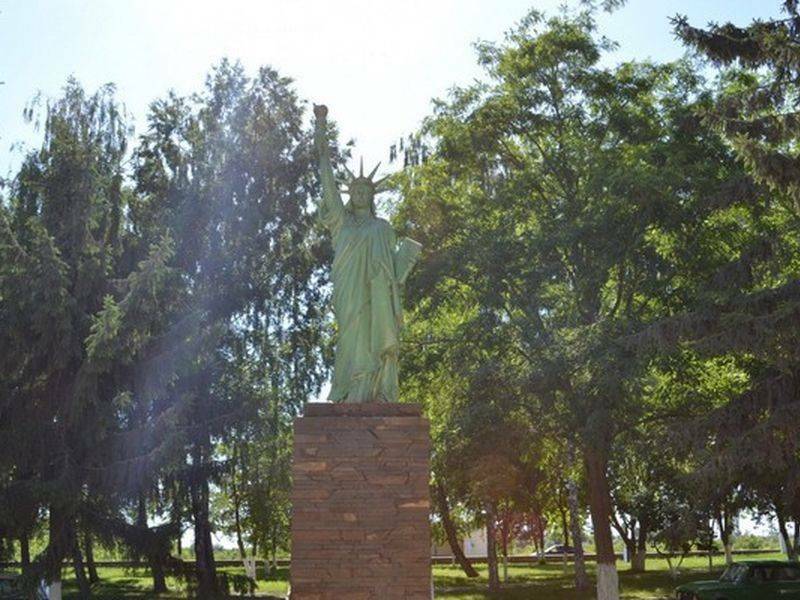 It is one of the few places in Argentina where there is a statue of Liberty. It is especially well done, probably in bronze. It seems to be a true copy, with the exception of her torch, replaced here by public lighting. It has a narrow and high pedestal all white look great. 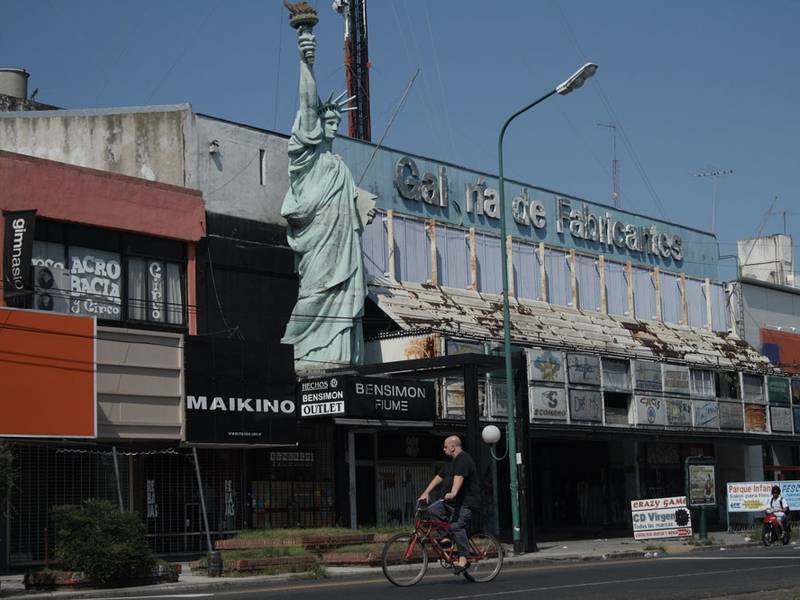 General Rodriguez is a suburb of Buenos Aires, in the extreme west of the city. 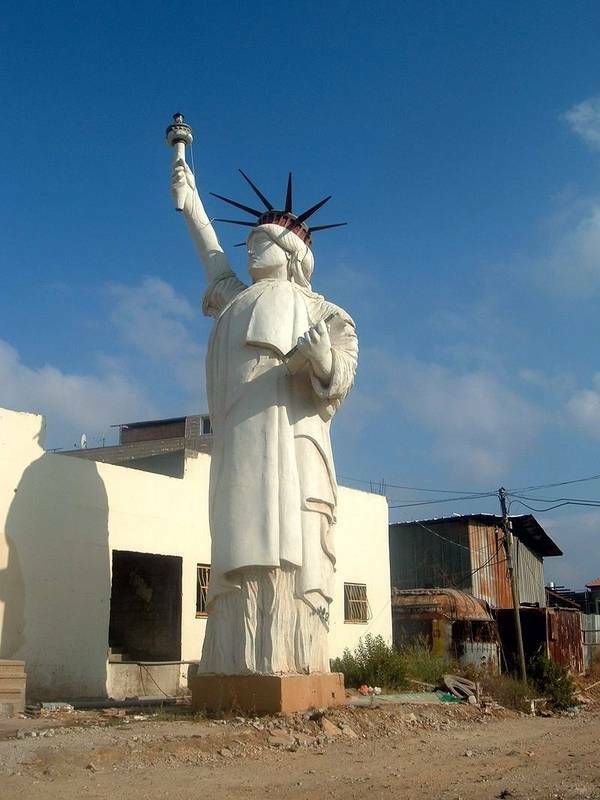 We find this curious massive statue of approximately 6 meters high, relatively well done. It is perched on a small base of simple square shape. It is not known its origin and role. All we can know is that it is on private land, which seems to be in an industrial area. Munro is a neighborhood in Buenos Aires. It is here, in a street rather poor, we can see this rather impressive statue in front of a trade. This is a true copy, which is rare. The statue is not in very good condition, alas. It has no base as it is already high. City of the province of Buenos Aires, Olavarria is a regional capital of 111 320 inhabitants (in 2010). 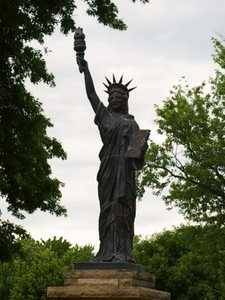 In one of the city parks stands the replica of the Statue of Liberty, stone pedestal on a rather bombastic but respecting the proportion of the statue. The set is a little too gray and dull, but the environment compensates the overall aesthetics of the monument. He is accompanied by two masts. 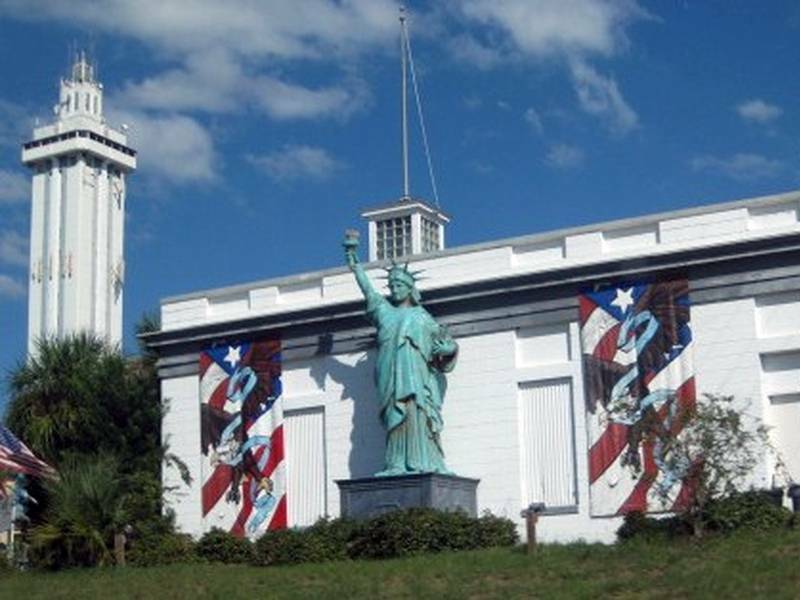 In Argentina, the real curiosity is in San Juan where a statue that was destined to the city of San Juan ... Puerto Rico! 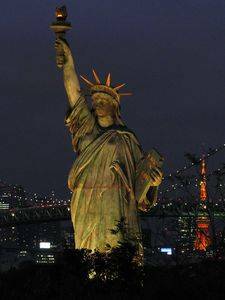 Since no time knows why or how it landed in the wrong country, but it is always she is still there! Fontaine-Valmont is a village in Belgium, in Wallonia. 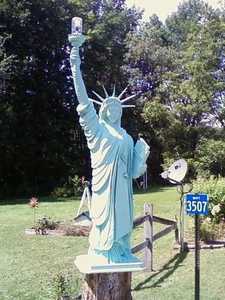 It hosts a campground that has a miniature replica of the Statue of Liberty. So this is a private title to reply but accessible to the general public and it is for this reason that it is on this site. In Belarus, the city of Dneprodzerzhinsk (yes ...) conceived a grandiose monument, taking a lot of floor space. 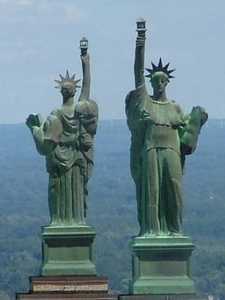 It involves the Statue of Liberty and Prometheus, côteet by side on top of a partial globe which forms a monument of nearly 15m wide. It is a work rather invasive. 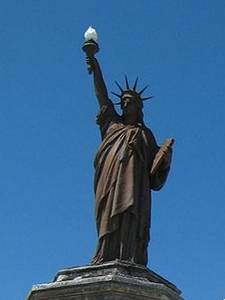 The Statue of Liberty is not well made, unfortunately: The tablet is worn too low, and it has only 5 spoke to the crown which has to count 7, normally. We feel that the artist wanted to get more symbol than making an exact copy. 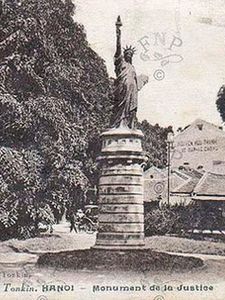 In Brazil there is a replica of nickel, in Bangu, in Rio de Janeiro, made by Bartholdi himself, in 1899. It was intended to celebrate the 10th anniversary of the independence of Brazil. 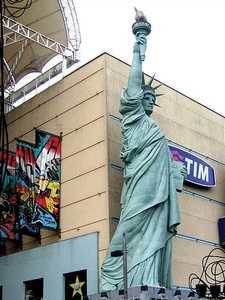 In Brazil there is also a replica, still in Rio, at the entrance of the New York City Center Mall. It is exactly in Barra da Tijuca. 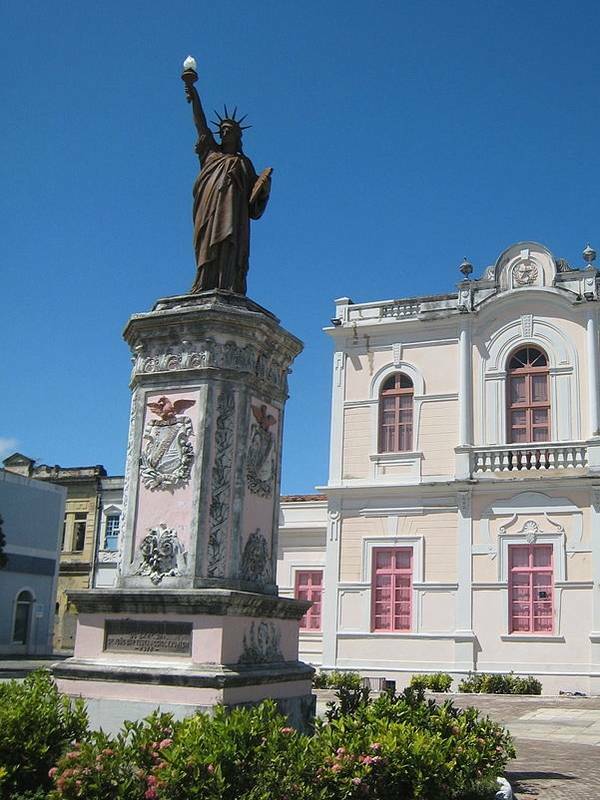 We find another statue of Liberty in Brazil to Macéio before the old building of the provincial consul. In Curitiba stands another statue floating drape very nice indeed ... but not compliant. 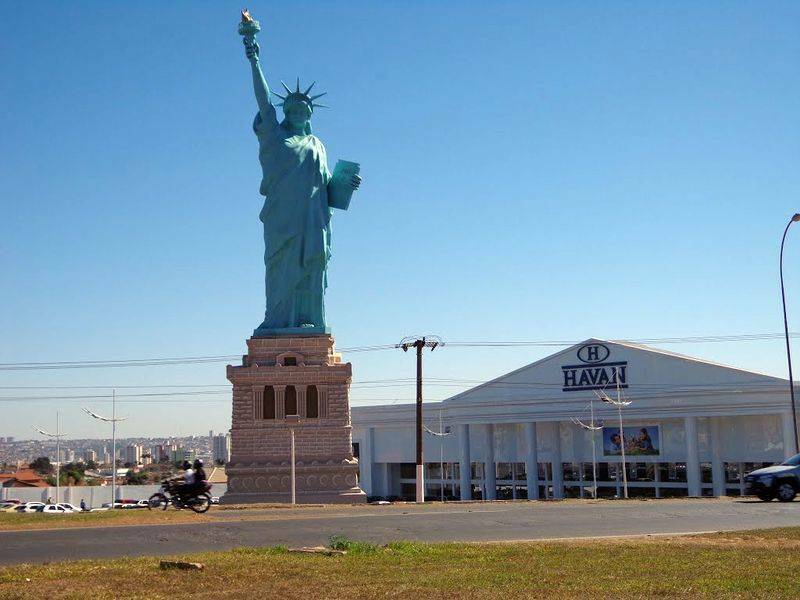 This copy of the Statue of Liberty, very imposing, in front of the store "Havan" Santa Catarina, Brazil. It is controversial, some people finding it too big, too showy. I must say it is rather large (at least 6 meters high). It is not consistent, ie it does not look exactly like the original. It has, for example, the radii of the crown and too vertical too short. Her face is too hard, its crown is too high, and she wears her too low shelf. 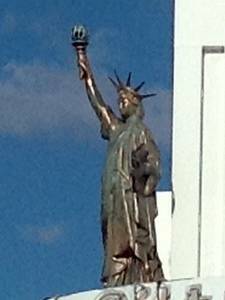 Her arm extended is not free from defects: The position of the fingers on the handle of the torch is incorrect, the torch itself is not identical to that of the New York statue, and the toga was not enough folds, it is too smooth. 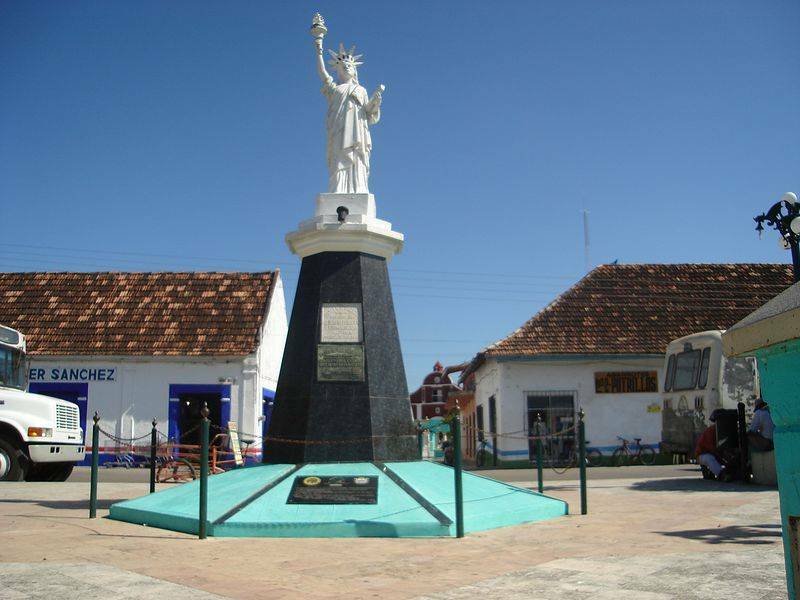 In Santo Antonio do Carmo, on the Atlantic coast of Brazil, is a park in the center which requested the municipality to local artists to provide a draft statue commemorating the heroes of June 25, 1822. The winning design was that of Mr Alberto Cachoeirano Rabello, who received the sum of fifty thousand reis to build this monument. 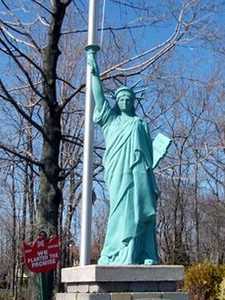 He decided to make a replica of the Statue Liberty dela which was inaugurated on October 12, 1930. This statue is not consistent, it has many fault compared to the original. Its base is particularly high and narrow. 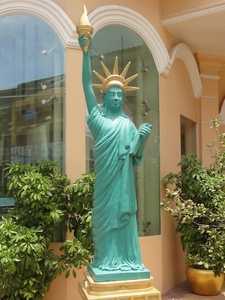 With its 6 feet tall this copy of the Statue of Liberty stands proudly outside the residence of Alphonso da Rosora, garden ornaments designer. It is at 90 Jackson Lane, just off of Highway 17 in Arnprior, Ontario (Canada). 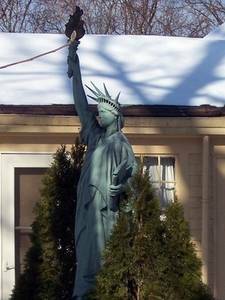 Its garden is full of various decorations, including this statue that exceeds other. It is easy to watch, but be careful because there are no nearby place to park. She was previously at 1099 Carp Road in Stittsville. This statue is original in its base, of Greco-Roman style, while the base of the statue is true neoclassical. THE statue itself is very well made, with folds of the franc toga, but it is an original work: The tablet is held vertically and too open face to the public, the crown has too thick rays and the toga of the actual statue does not go back on her left shoulder that much. And as most of the time, there is no trace of the broken chains of slavery on this replica. 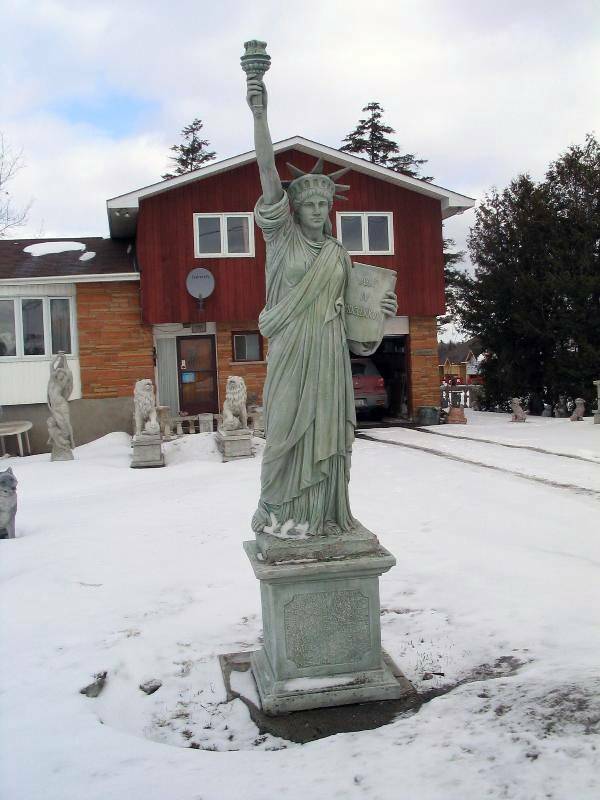 Blainville is a city in Canada, it also has a replica of the Statue of Liberty. We must get to the park where the ice freezes in the winter, which allows for ice skating. It is well known locally. In the park there is a small building adjacent to the statue very well reproduced. It is open access, simply go there to see it. This Canadian replica of the statue is in the city of Coquitlam is an advertising sign located in front of the Best Western hotel. Coquitlam is in British Columbia. It is visible from the motorway, when you go to Vancouver. It is not extraordinary, the folds of her gown are fairly marked, especially those of her outstretched arm, and the tablet is a little too far from the body. One positive all the same, her face quite close to that of the original statue, (just a little too chubby) and the golden color of the windows of the crown, very well done, unlike many statues that have hair and all painted in gold crown, which weighed down the whole. The base, it is one of the worst we can find: a large block of concrete without charm. This replica is probably made of resin in a mold which offers copies not really consistent. It is her face that shocks most, too small, dominated by her hair and especially its crown too high and too thick spokes. Apart from that, the rest is not bad that way. She even has broken the chains of slavery to her feet, which is very rare for a replica. It is placed on a small stone pedestal in the same style as the original base, but much smaller and simpler. It is located along the road just in front of the Best Western Liberty Inn at 5521 Dr. Dennis McCarthy, Lebec, Canada. Take the exit I-5 exit 219, north of the "Petro truck stop." 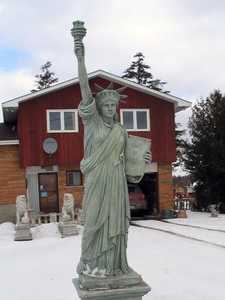 It is in the city of Montebello, Canada, that we can admire the replica of the statue. Sitting on a wooden pedestal homemade, it is about the size of an adult and holding in her right hand a lamp for illuminating the bar entrance adorns it. For the reality is that it is a commercial object to attract customers. The bar is the "Central Bar" Montebello. 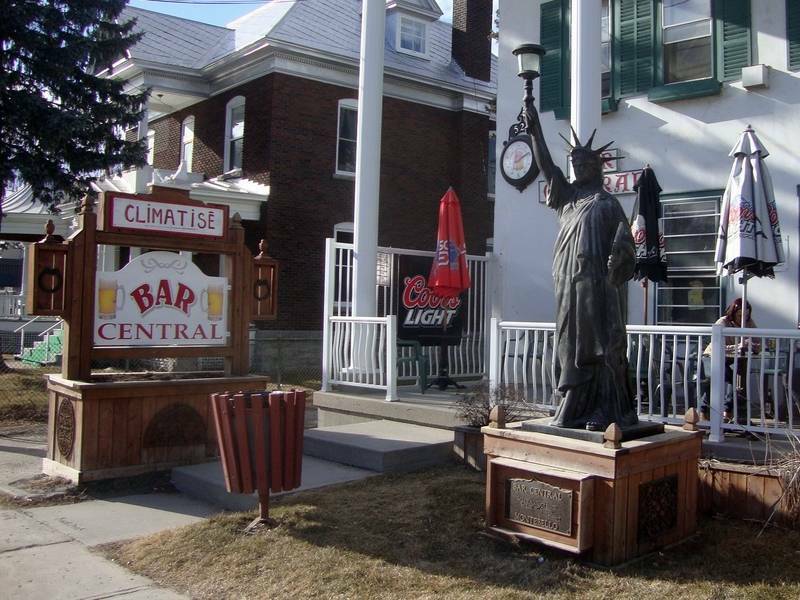 An anecdote: the base has a plate on which is marked "The Statue of Liberty enlightening" Le Monde "on" the Outaouais "
This small statue is pretty well done, but it is not visible because it is located in Ottawa, in the backyard of the restaurant "Chez Mario" on the east side of the main avenue. It is fiberglass and is mounted on a small base. 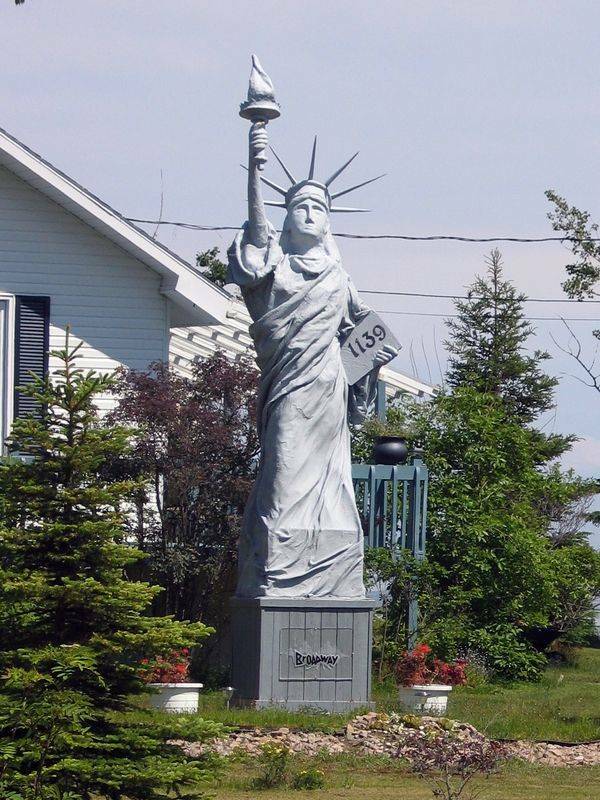 Pointe-Lebel is a city in Canada which also has a replica of the statue. This is a homemade, or at least an amateur work for the little resemblance to the original. But the effort is considerable, it has a very large size. This is a private project, it is in the courtyard of a local taxidermist. It can be seen from the outside. 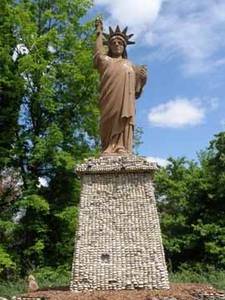 It was at St Jean de Richelieu that the visitor can see the statue on the side of the road in a park. She's very pretty. 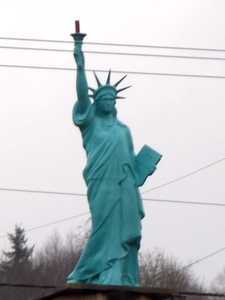 Its green color is dark, far more than the original statue. 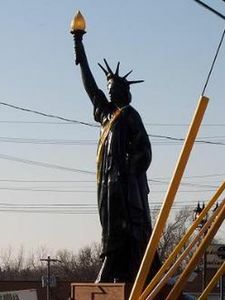 The second statue of liberty listed in China is located in Canton. It is located on the roof of a memorial. 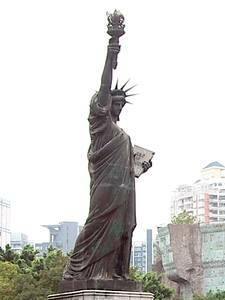 Another statue-like "Liberty Enlightening the World" is located in the town of Huaxi, China. 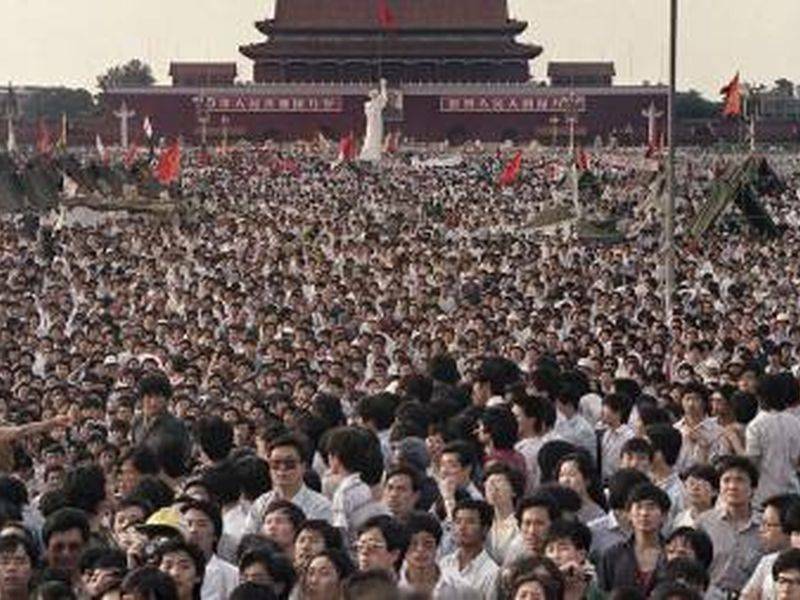 This city is often cited as the richest in China. There are in the city center a kind of replica of the US Capitol, with its peak this statue strongly evoke the Statue of Liberty. But it's probably one of the replicas is faithful the least successful, with its too high crown, its disproportionate rays and its light. It is difficult to observe, very high. 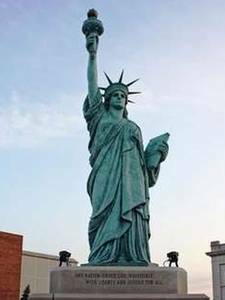 More surprising for this economic enemy of the United States the single political party, the statue is present in some parts of the country. It is true that the country is large and there are not many. The Shenzhen is at the heart of an amusement park. 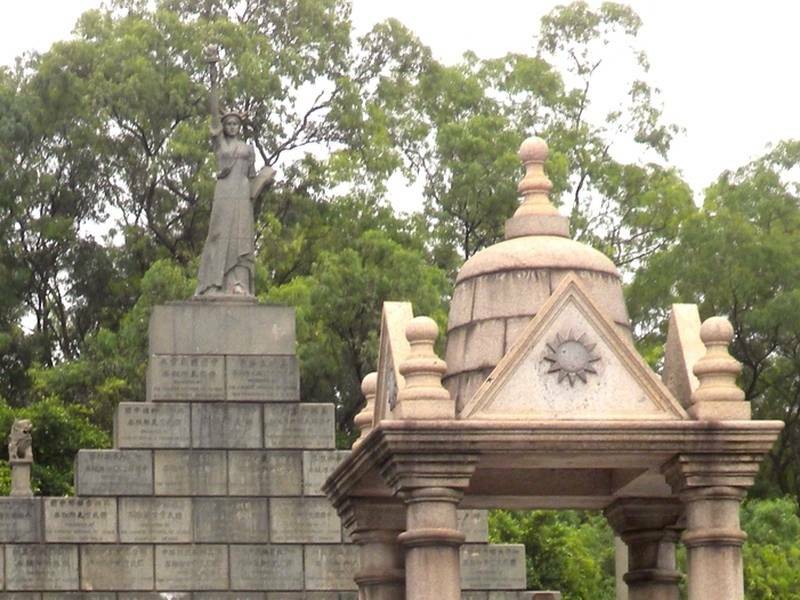 It is in a city park that is Shapingba this memorial monument dotted with replicas of world heritage. It's a strange feeling to be on the banks of this lake. 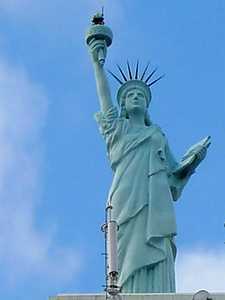 The copy of the Statue of Liberty in it is seez well made, but it is too thick hair, and her arm is not stretched vertically, as is that of the original statue. The fact that it is in the middle of the water gives it a very original character. 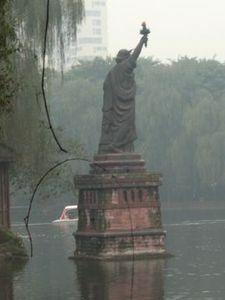 Another copy of the Statue of Liberty in China. 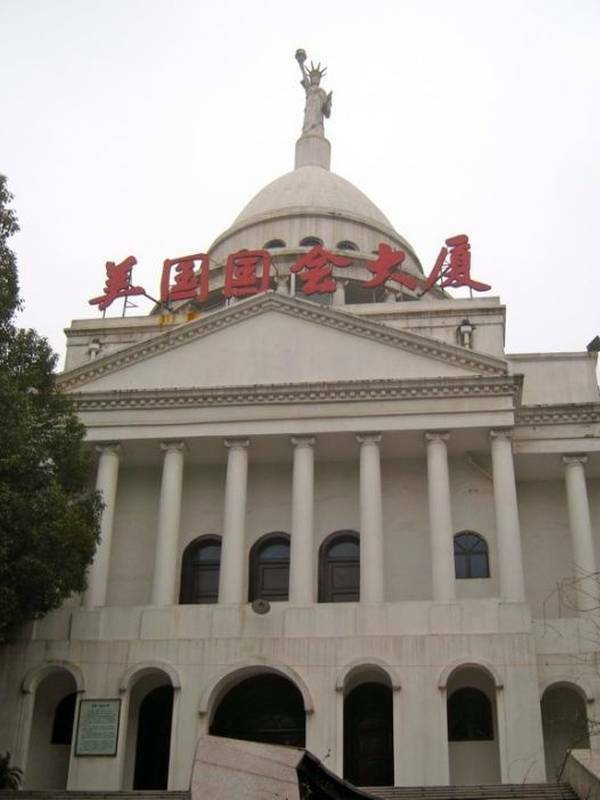 It is located in Shenyang, in a relatively new district. 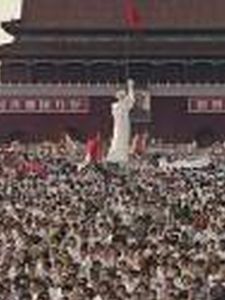 It is not well done and very similar to the statue which was made hastily during the student riots of 1989, which led to the occupation of Tien An Men. This may be the same, but I can not be sure. Always it is that it increases its shelf too low, her outstretched arm is too squeletique and her toga falls badly. Also missing 2-ray on her crown. 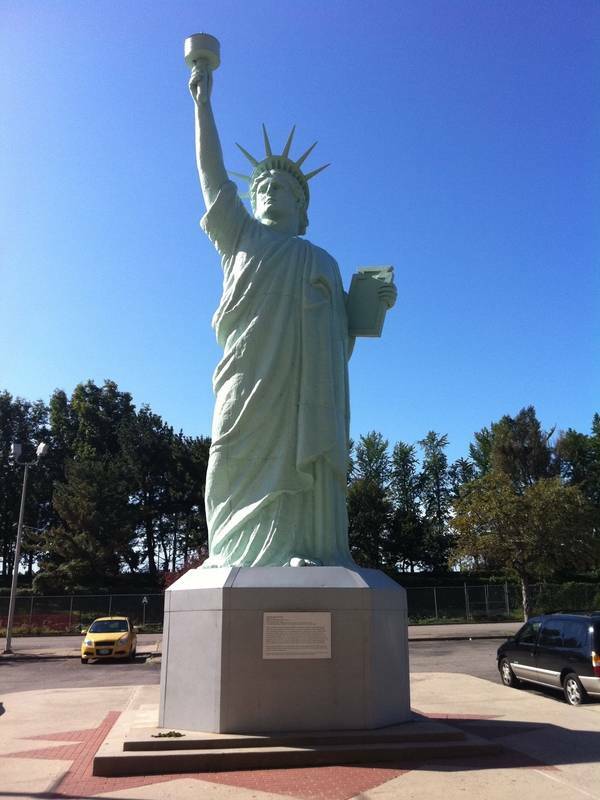 So that's probably the farthest replica of the original statue. 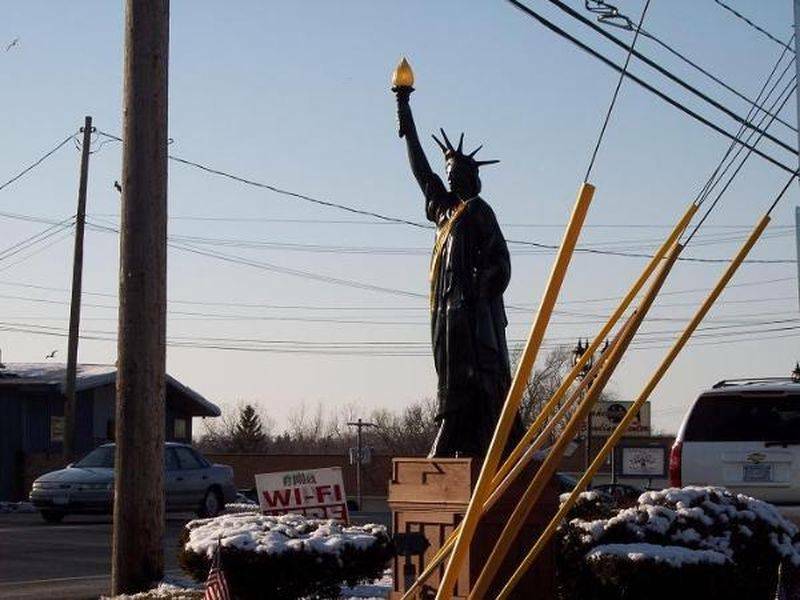 She was accepted as a replica of the Statue of Liberty by her posture, her torch and the rays of her crown, but we must say that this is all as it has resemblance. And we should say "he" because it is a male statue, like her nakedness does not leave any doubt. 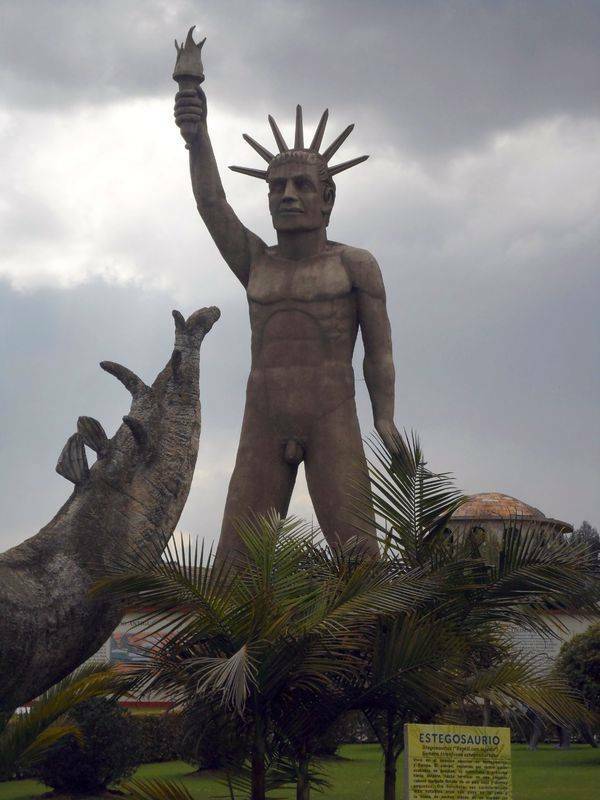 This statue is in the Jaime Duque Park, which is on the outskirts of Bogota. This park has several copies of famous monuments and a zoo party. 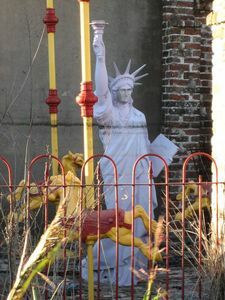 Whether this statue is considered a work that has nothing to do with the Statue of Liberty or if, instead, it is a free print by a local artist. 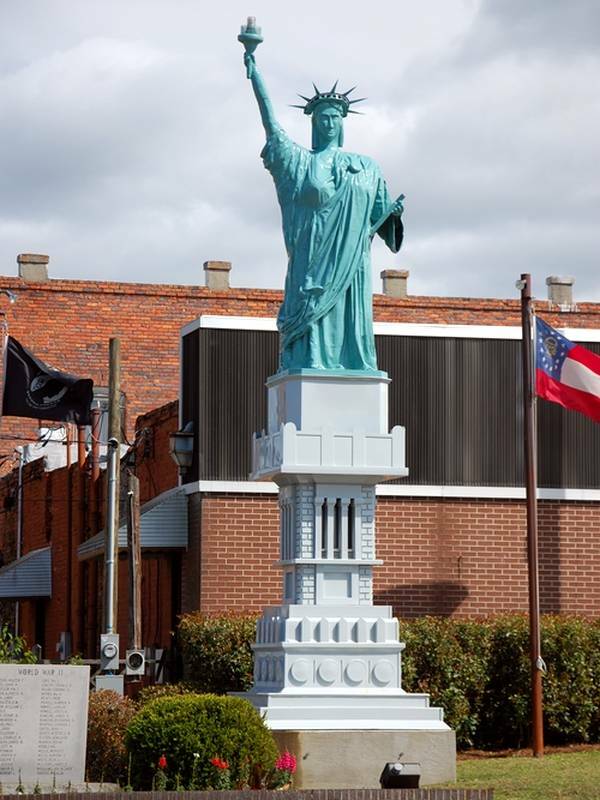 It still looks more like a reproduction of a local rite, so having nothing to do with Miss Liberty. This replica is in Denmark, at least it was at the time of taking this photo. It is a work of the artist Jens Galschiot, entitled "Freedom to pollute". Observant visitors will have noticed the fuméesortant torch. It was made in 2002 fiberglass. It measures 6m high and was put on sale at the time. The artist is in the city of Odense is there that was this statue. In Spain, Dali made an illegal copy. 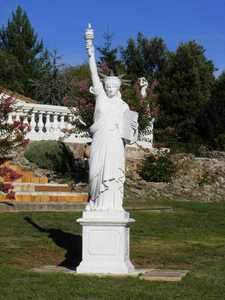 It is on display in her home village at the entrance of Cadaques, on the Mediterranean coast, near the French border. Its originality? She has both arms, each hand holding a torch. That of Cadaques is a copy because her original work is in France, the castle Vascoeuil. 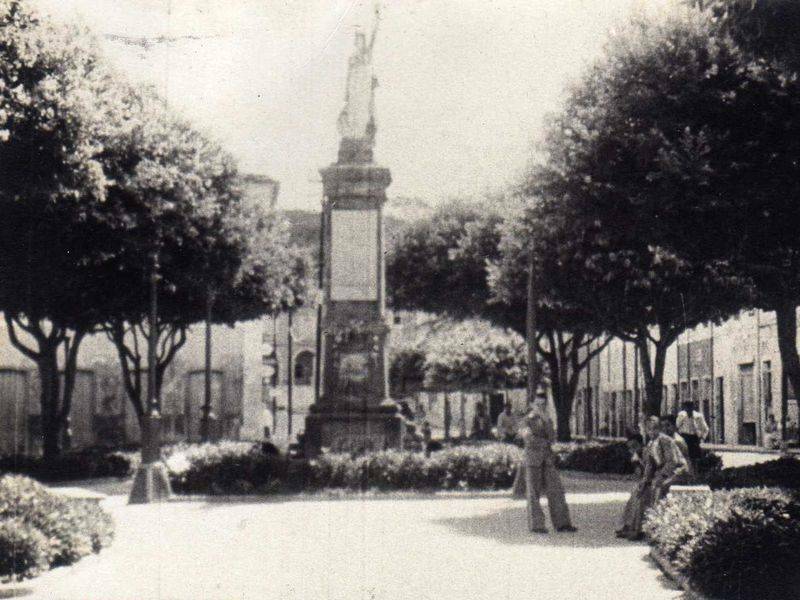 It also has to be a Ceneiro Statue of Liberty erected in honor of veterans of the first Carlist war. This statue was removed for political reasons during the period of the Franco dictatorship, before returning to its place in 1976. 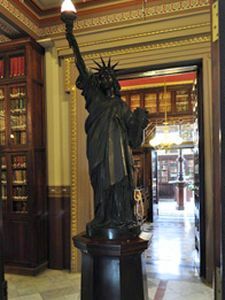 Barcelona has a replica of the Statue of Liberty, it is the library Rossend Arús. 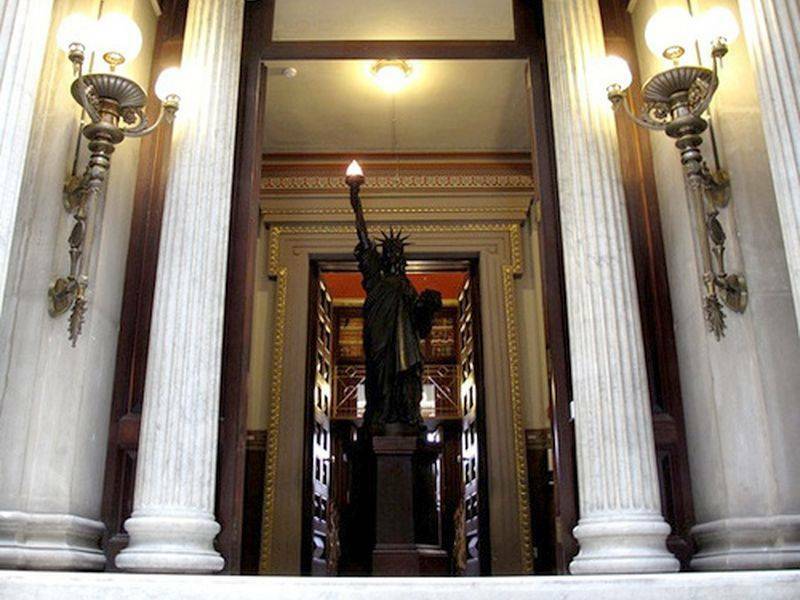 Placed on a pretty high pedestal for the fact that it is inside the building, this replica is 2 meters high and guard the entrance of this library since 1984 specializing in labor movements, anarchists and Freemasons. 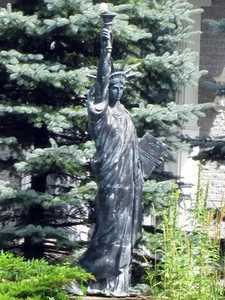 The statue itself is very well made, it has a nice patina. It serves as a fixture. 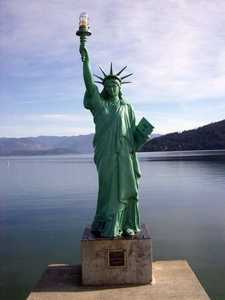 The North American continent is very rich in copies of the statue of Liberty. 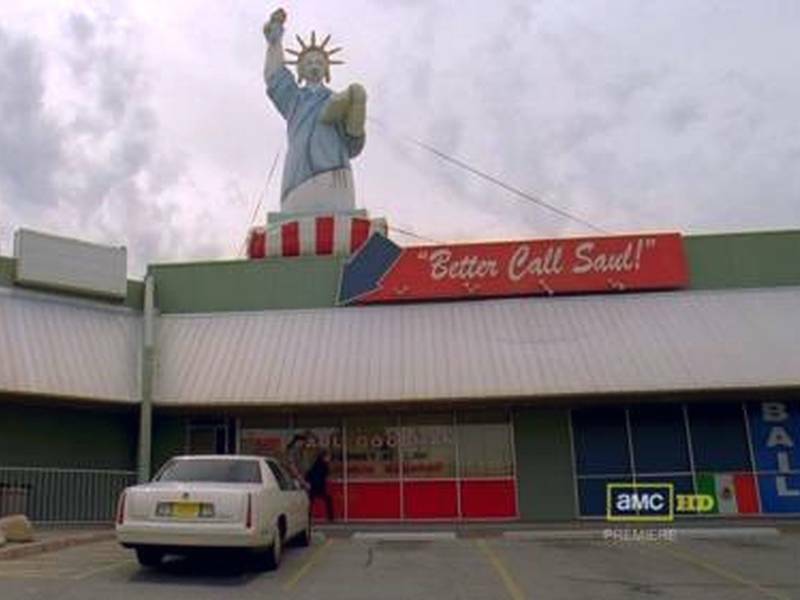 No wonder that, since the original is in New York. 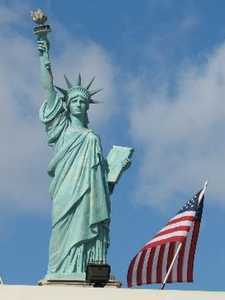 In the United States we must distinguish the classics, which are found everywhere, from those of the American Boy Scouts, who launched the operation in 1950 Strengthening the arm of Liberty. It was to deliver 200 statues identical everywhere in the US. As all identical, they are treated on the link above. 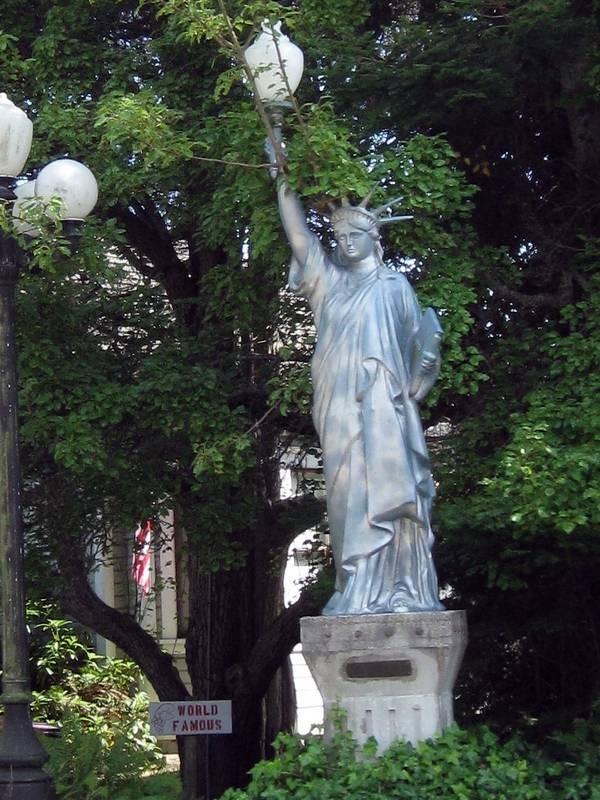 Recent metallic statue, rather successful, in front of City Hall. It dates from 1920, and serves as a monument to the dead of the First World War. This replica is a disproportionate stand, which rises very high. It is located next to the headquarters of the Boy Scouts. It has a curiosity: It is a real flame that burns in the flame ... 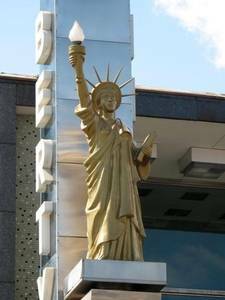 Initially she decorated the building of the "Liberty National Life Insurance Company." In Arizona, more precisely in the city of Glendale, the "New Yorker Restaurant" offers typical dishes. 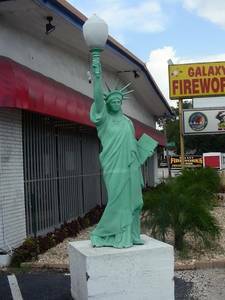 To increase its customer base, it displays high originated on the East Coast with this beautiful statue, relatively compliant. The crown of the rays are too broad and bend to the ground, and the tablet is held too much on the side, but otherwise it is fairly well done. Her face, too, is not especially like. 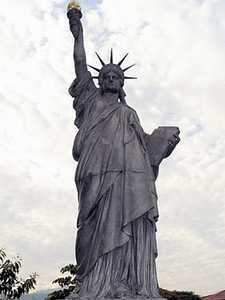 Its main interest is its base, faithful reproduction of it on which the original statue. It is rare that the base is reproduced identically, the work of the artist lie mainly in the statue itself. It has a size similar to that of a human, a little larger perhaps, and the whole is made of metal. 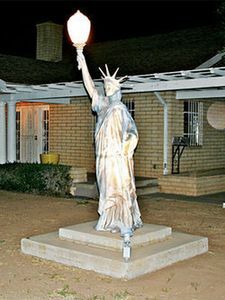 Strange vision than this statue, in Phoenix, Arizona. It is located on the grounds of an individual and serves as luxury luminaire. The house is on 7th Avenue, just north of McDowell Road. It is rather well made, with the exception of rays of the crown, too vertical, and the more it is valued on an original flat base. 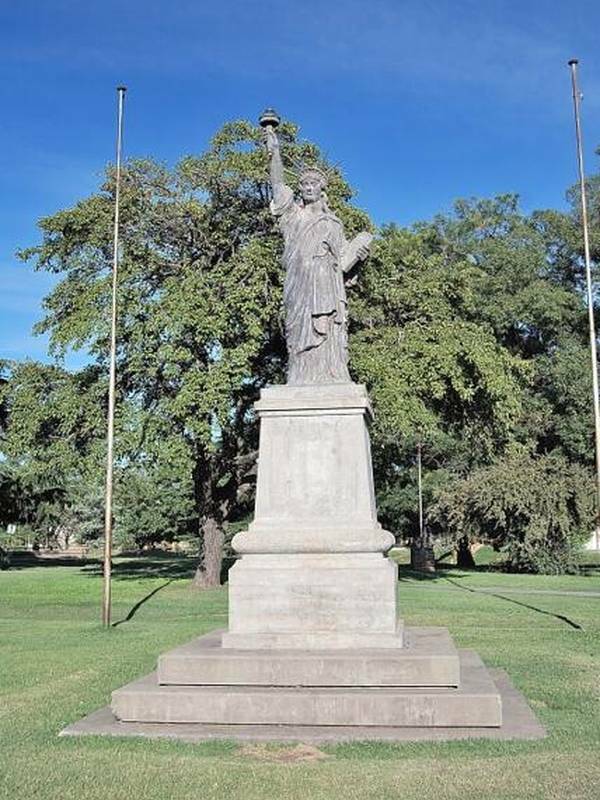 The statue of San Marcos is probably one of those furthest from the original. 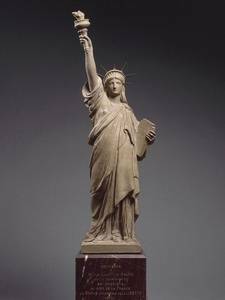 She has the right to quote for the will to make a replica of the New Yorker statue is obvious, but the artist deliberately distanced himself with the work of Bartholdi. 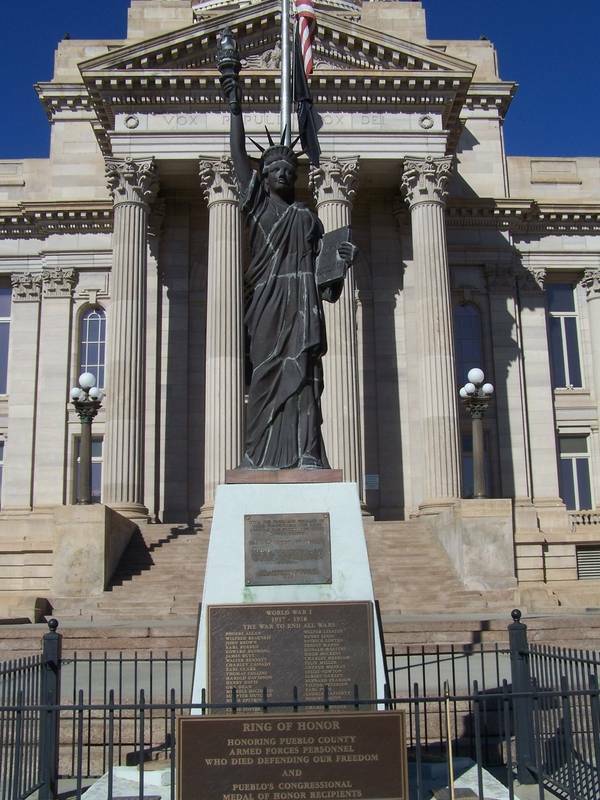 First the statue depicts a man and not a woman. Her arm is not stretched, it does not shelf door, her hand right arm down. 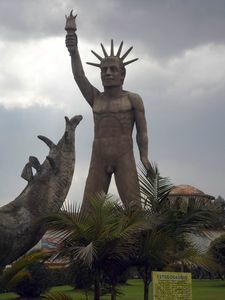 So it is a rather original statue that stands there. It is before the "Liberty Storage Yards Contractors" in San Marcos (California) at 817 East Mission Road, San Marcos, CA. 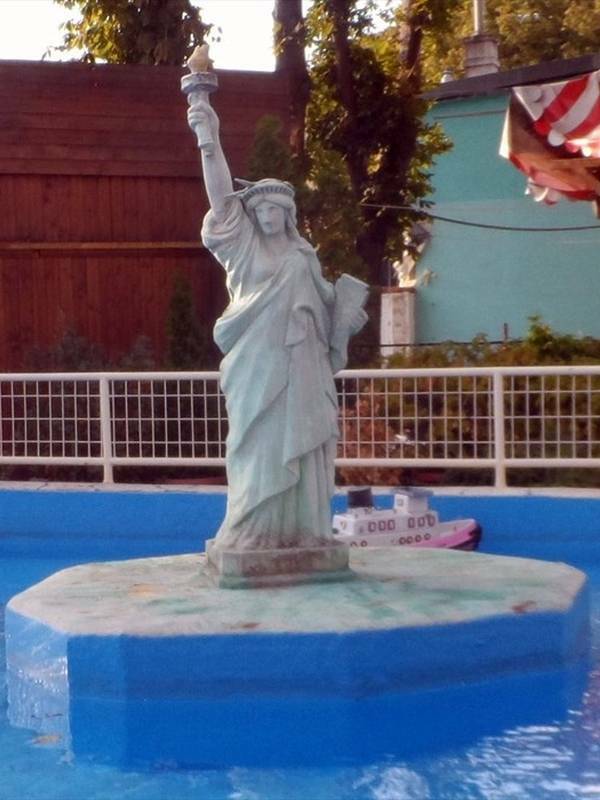 This copy has a special feature: It serves as a fountain, which is extremely rare for a statue of Liberty. 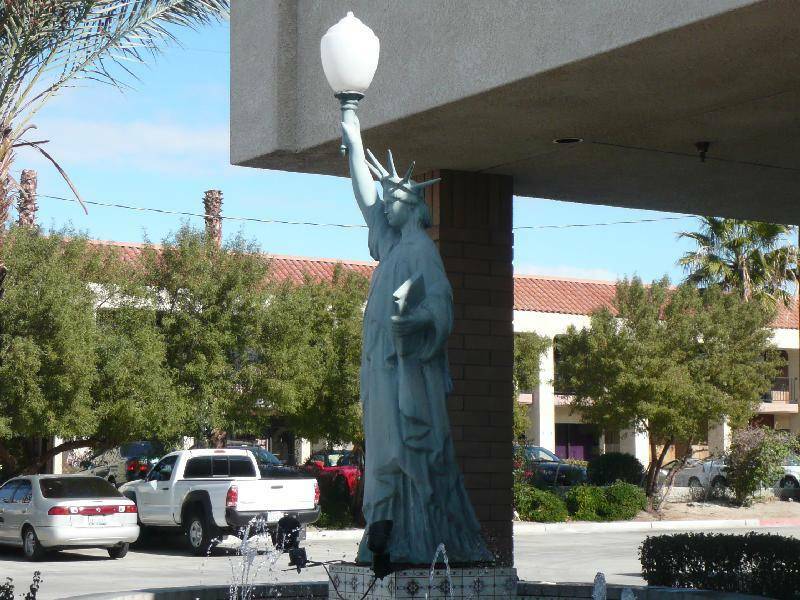 It is located in California, Cathedral City, just south of Dinah Store on Date Palm Drive. 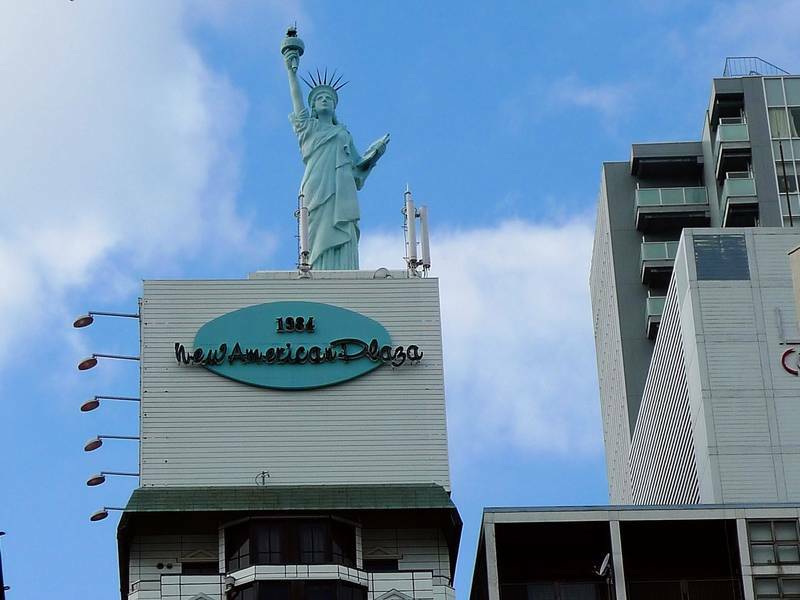 The Dinah Store, it is a furniture store. This statue is not uncommon, it is molded plastic, but has several shortcomings, including the rays of the crown too high, the tablet held too far from the body and the folds of the gown too little identical to the original statue. The torch was replaced as often, by a fixture: This one is particularly large. She is standing on a small tiled pedestal in the center of a small water jet pool. This copy of the Statue of Liberty is one of the most beautiful that I have ever contemplate. It is not without flaws, but the quality of reproduction, attention to detail, efforts to make a statue worthy of the name make it a candidate for the finest reproduction of this site. 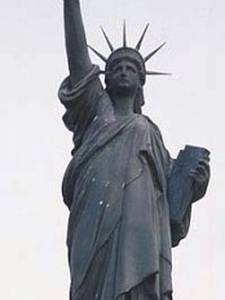 Among the drawbacks are her face, too, her lower body, too narrow, the rays of the crown, identical with each other while on the original statue, they have different sizes, and the position of fingers on the handle of the torch. There is also the form of the flames of the torch, which is not quite true to the original, especially the position of the left arm, much too low. Poor's downright disabled! But what is most important is still the quality of the work done on this statue. 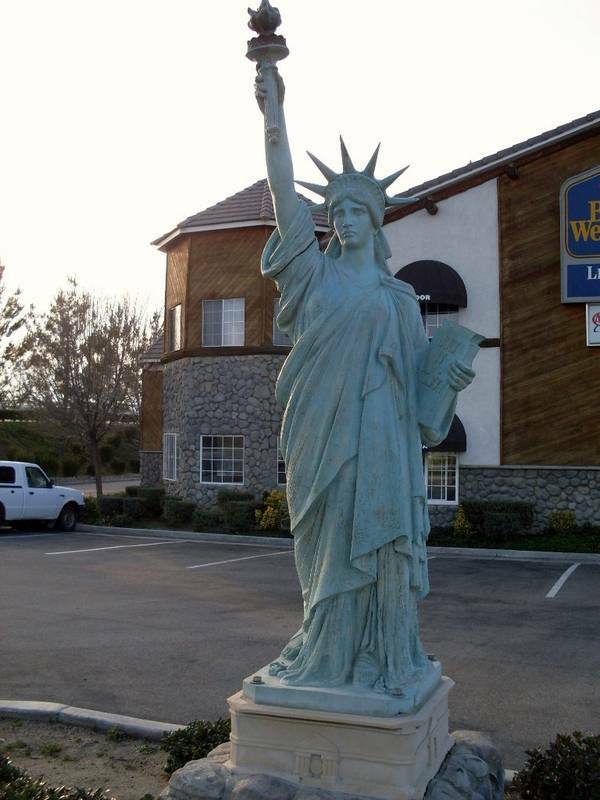 The visitor can see near the Highway 41 to Hokhurst, California, in the parking lot of the Best Western. 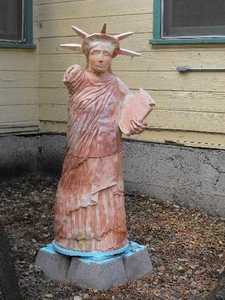 This terracotta statue is located in California, at the entrance of art studio Sacramento Waldorf School. It was constructed by section so that each piece can be baked, all that can not be. We have no idea why she has no right arm, maybe it's because it was not built yet, or that it was not satisfactory. Note that the crown has only 5 instead of 7 branches. 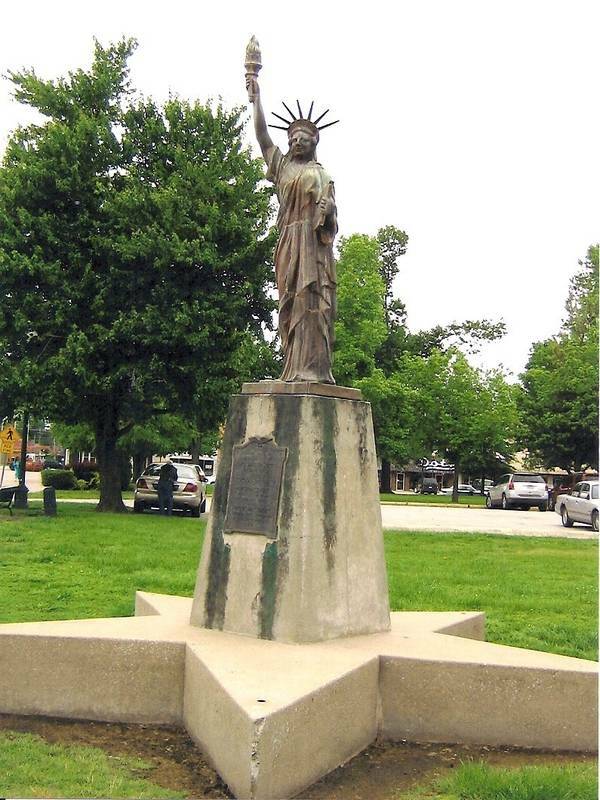 The Statue of Liberty is located in Evans, California, it serves as a memorial to veterans of the city. The set is quite harmonious, with the inevitable American flag, monuments and some flowers to decorate the whole. 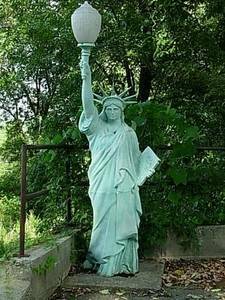 The base of the statue is rather simple but original, in the sense that we rarely find such a pedestal for the Statue of Liberty. The statue itself is very well done, the proportions are good, the folds of the gown are frank, successful crown. 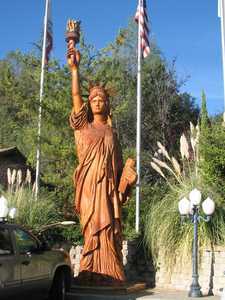 Superb reproduction of the Statue of Liberty, the statue is located at the entrance of the model home of the company New Horizon, San Jose (California). It is remarkable for several elements: Its golden color firstly perfectly uniform, it spark day. Accuracy then, some elements have been reproduced to perfection, which is quite rare: Torch, tablet, ring, etc. Negative points concern the drape, too simplistic and lack of broken chains of slavery, which is fairly standard. This is a light, the globe of the torch lights up at night. 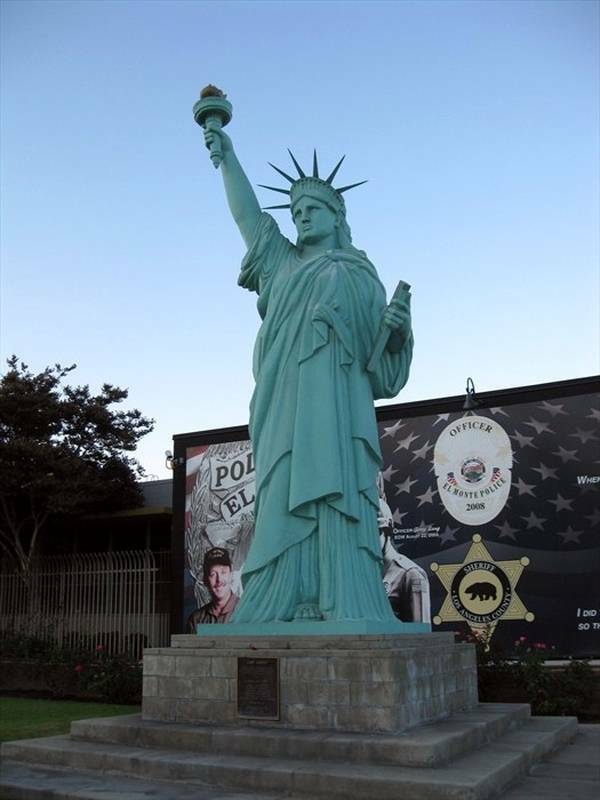 This replica of the Statue of Liberty is at the entrance of Pier 35, the 35th pontoon port. 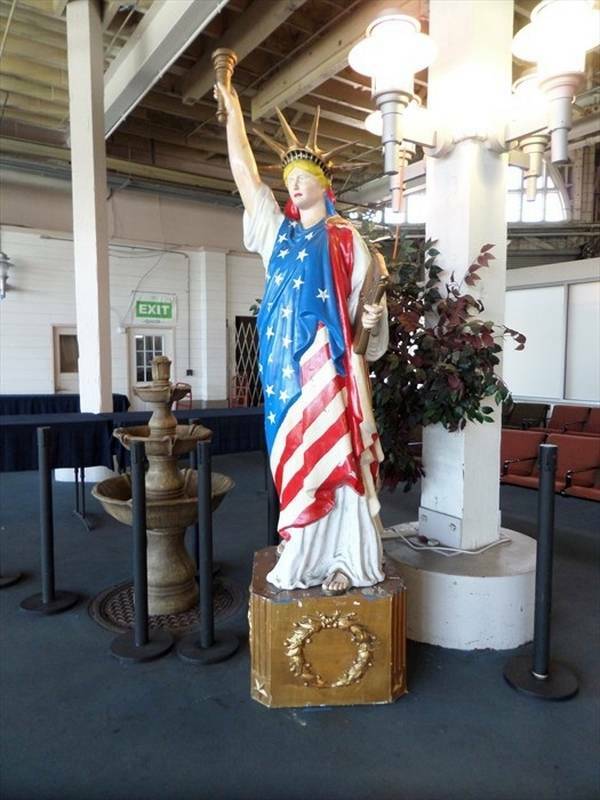 It's a pontoon used as a terminal for cruise ships, so the statue welcomes visitors departing or arriving from San Francisco. It was carved from a log. Another block of wood serves as its base. It is characterized by its violent colors, her blond hair, and her outfit in the colors of the American flag. This statue is a purely commercial replica. 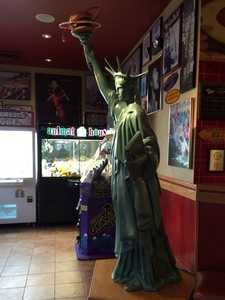 Installed in the restaurant "Red Robins" in Foothill Ranch (California), it measures 10 feet high. Its main feature? She is holding a hamburger in hand. We forgive him, it is primarily an advertising sign. 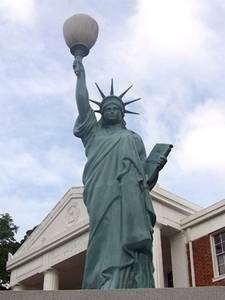 Very nice photo of a rather basic but ok statue in its reproduction, if not the strange red torch appears to be a lamppost. It is a replica of decreased base, but relatively faithful in style to the original statue. 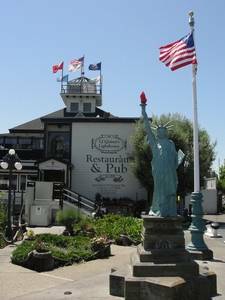 It is in front of the restaurant Quinn's Lighthouse Restaurant and Pub, at the pier Cove Marina, 1951 Embarcadero, Oakland. Small green statue, as usual. 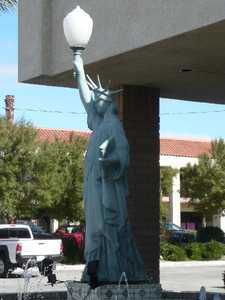 It is in front of the town hall of El Monte, California. Replica advertising if any, this statue will stand up erect in her hand a hamburger instead of the traditional torch. 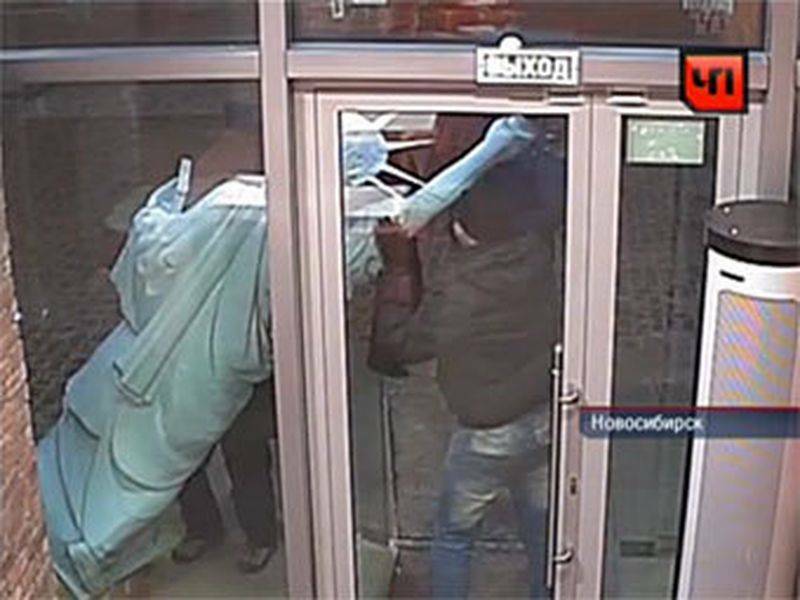 It is a will of the one who ordered it to turn into a woman Miss Liberty sandwich ... an expression that suits him perfectly! 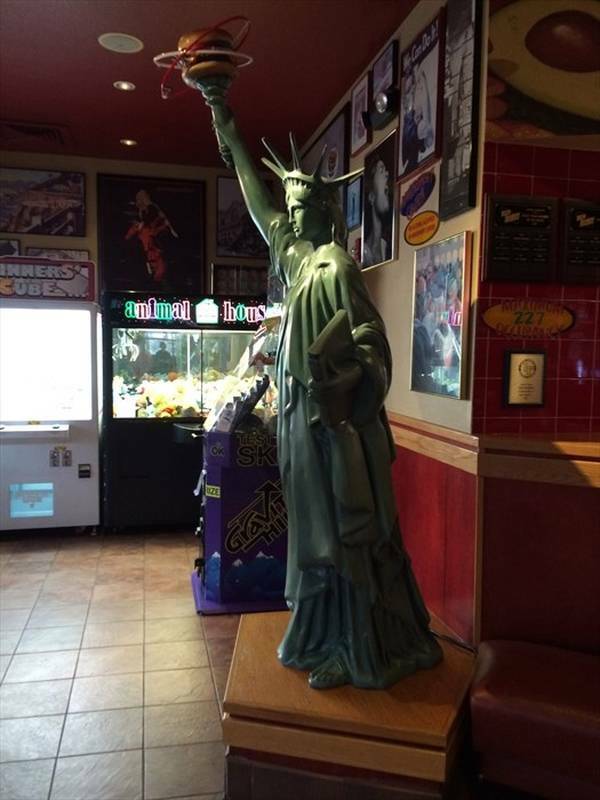 It is inside the Red Robin Restaurant in Boulder, Colorado. It is near Cripple Creek, Colorado, lies the strange replica of the statue. It is on private property and her vision seems completely incongruous in this landscape. 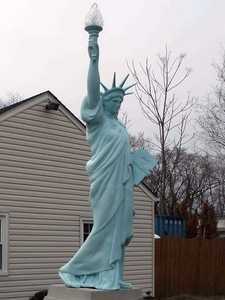 It is erected on a simple pedestal, which seems to be wooden, but the statue itself seems to be plastic color. Her torch was transformed into luminaire. This replica well done and kept quite has the characteristic of being black. She is on a trapezoidal pedestal and has no less than 4 commemorative plaques: one for the dead during the First World War, one for the second, to those of the Korean War and the last for the dead of the war in Viet -Nam. There is a fifth plate for 4 persons Pueblo who received the Medal of Honor. 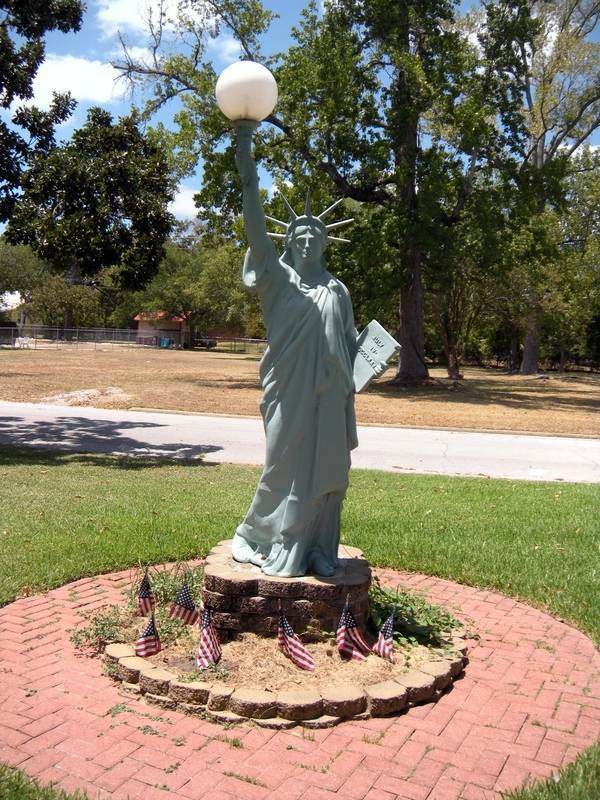 Florida, North Port, is a beautiful replica of the Statue of Liberty. It is located on the parking of "Old World Restaurant", a famous restaurant there, home to many local activities. 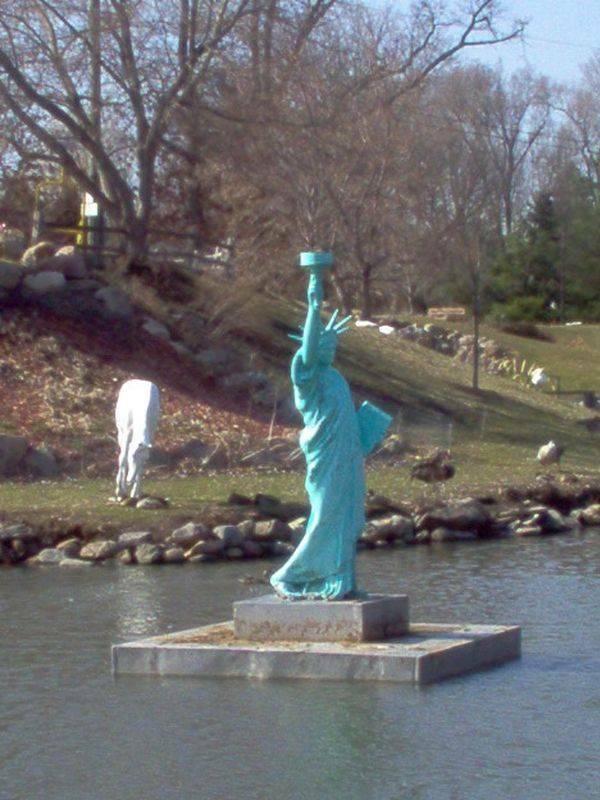 This statue is particularly successful, it's rare enough to report. Her face, if it is not entirely consistent, is well drawn, the lines are clearly drawn. The folds of the gown are frank, wearing the torch is correct. She inevitable light bulb, placed at the center of a globe. It is perched on a very original pedestal, a highly decorated piece of unexpected style. 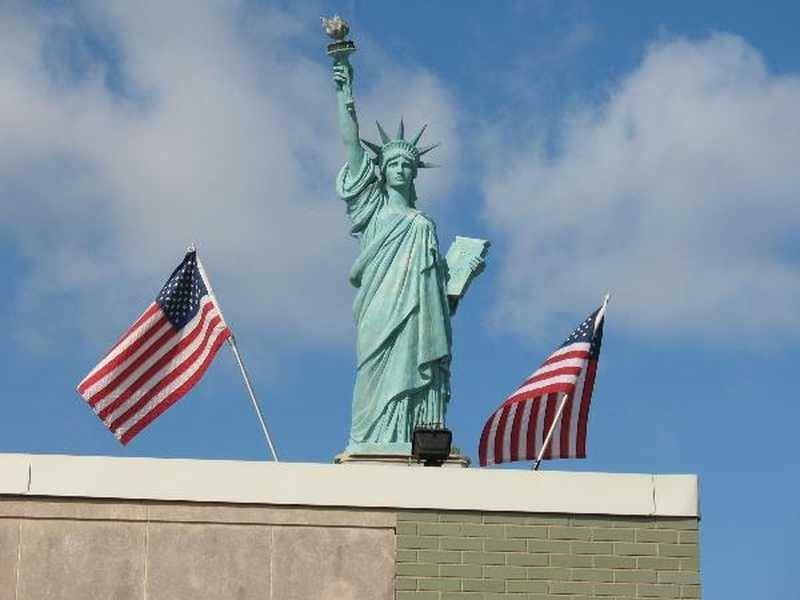 A Seminole, Florida, the American Legion has placed a replica of the fairly small statue on a pontoon, a kind of balcony designed to elevate the information panel. 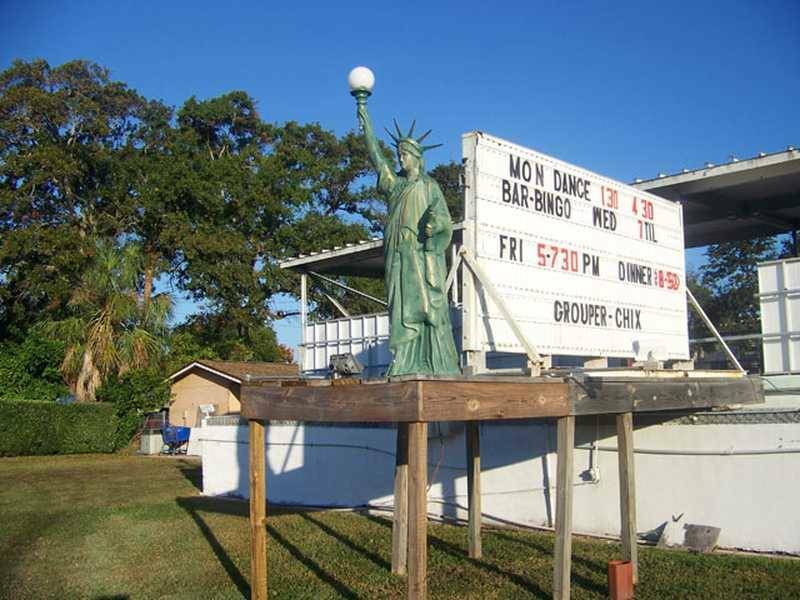 It is at the following address: American Legion, Post 252, Seminole, FL. 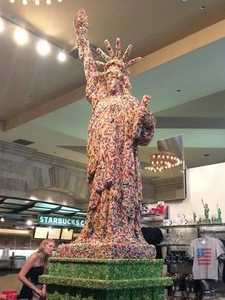 This statue is quite successful, though looking more closely it have some flaws. But the overall impression is correct. This statue is not very successful, it must be said. Made from any polymer, it is rude, her toga does not fall like the original, it takes the tablet too far forward and its rays are too vertical. Moreover the hand holding the torch was not at all the right position, and the flame, replaced by a simple bulb is ridiculous ... 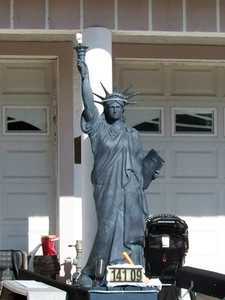 The statue can be seen in front of a residence in Madeira Beach, Florida. It is at 14109 North Bayshore Drive. A few years ago what is there. 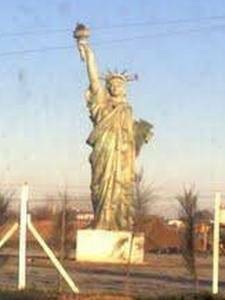 It is only the head of the Statue of Liberty. She is standing at the entrance of a large Miami Beach hotel, prominently. It seems to be a quality replica, with fine lines, and made with good materials. 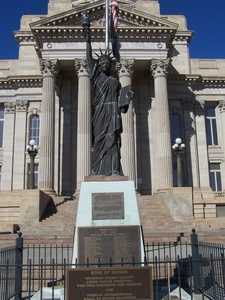 The statue of Minneola is located on the west side of the "House of Presidents" (House of Presidents), along Highway 27. 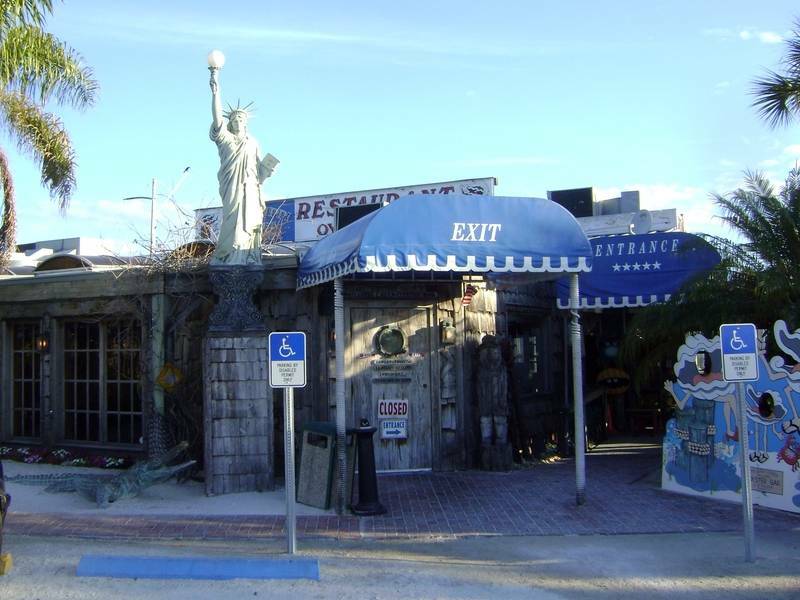 This is a Florida tourist attraction with among other replicas of the White House . 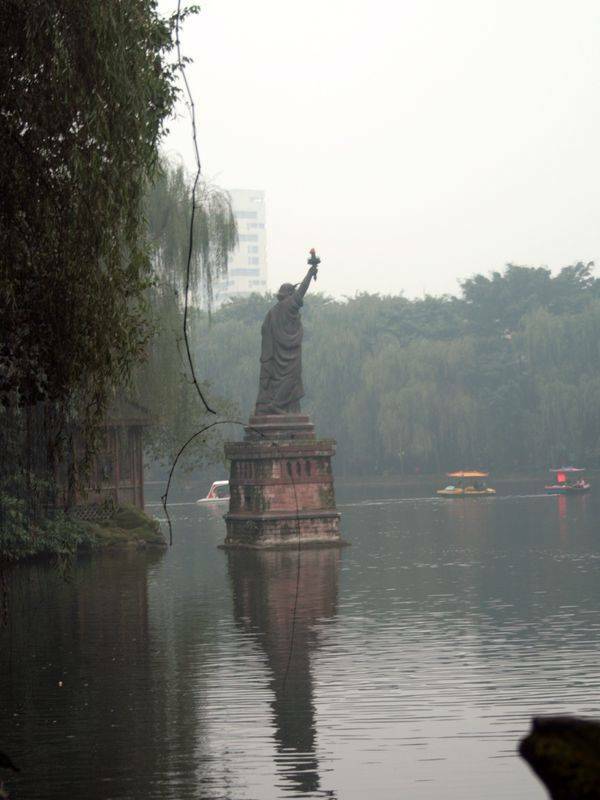 The statue itself is not extraordinary, but it is just waiting for such a location. 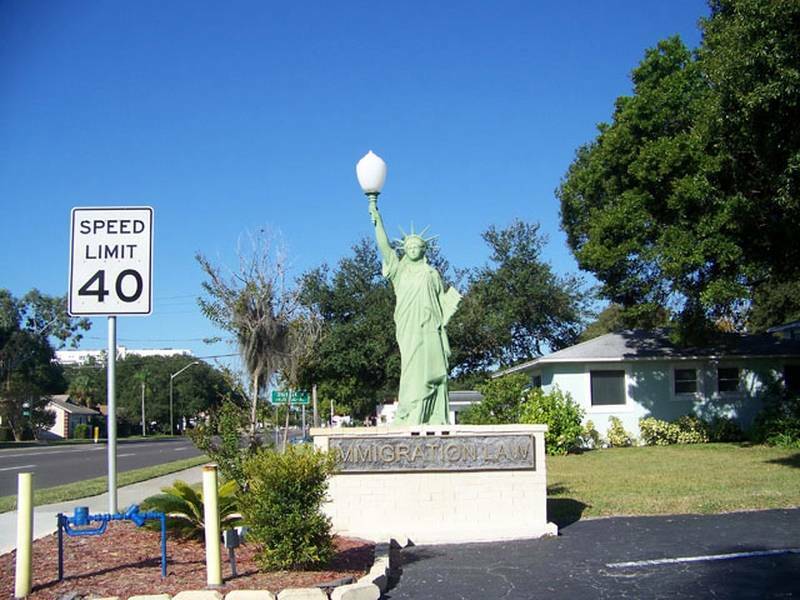 This replica of the Statue of Liberty is on the sign of the center Attilio DeCosmo, which, as everyone does not know is on the corner of 49th Street and 68th Avenue, in Pinellas Park, Florida. This copy is commercial, it is not meant to be studied from every angle, and fortunately because obviously it is quite simple, just worked. Its originality? It is having a torch entremellées make two rods, one red and one yellow. 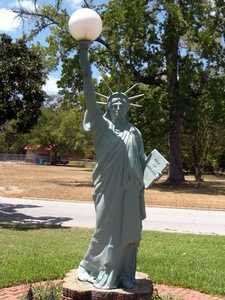 It was in Florida that found this beautiful replica of the Statue of Liberty. She's on top of a carousel in the amusement park "Fun Spot America" in Orlando. It was in this city that we find most amusement parks in the state, that of serving as Disney locomotive other. The carousel is a creation of "Chance Ride Manufacturing". 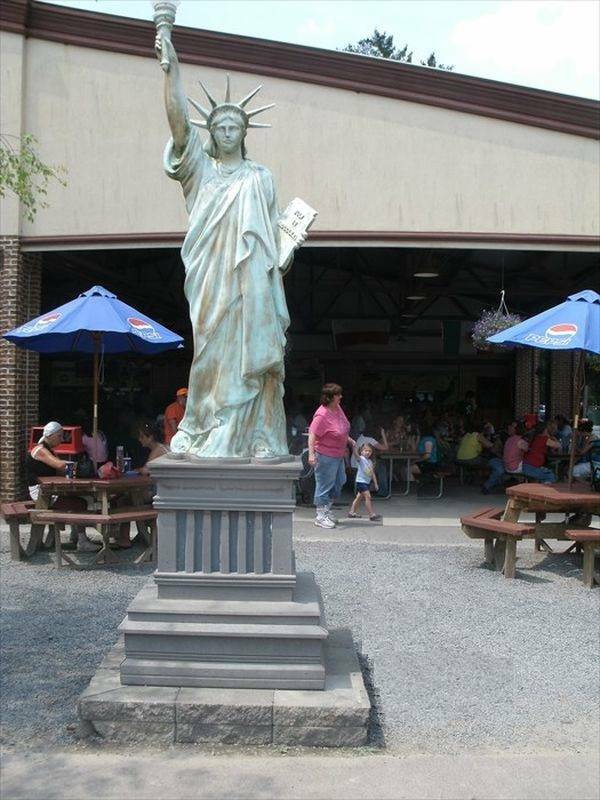 The statue rotates with the carousel, so it believes it has a beautiful view of the park! 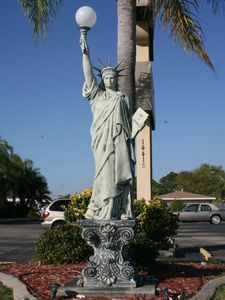 This copy of the statue is located in Sarasota, Florida. This is an advertising sign for the garage Eric at 2650 Stickney Point Road, Sarasota. This small statue is cast as her white overall appearance proves it. But it was painted in American colors, which makes it a little nicer. It must be said that her face is not very successful. 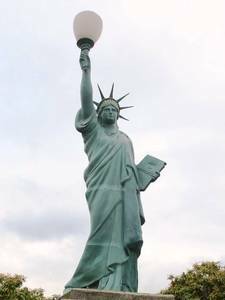 Apart from that, there is not much to say about it, the torch is a little unusual, but the crown is faithful to the New York statue, and that's rare. Statue traditional advertising, it measures about 2.50m tall and meets quite well the proportions of the original statue. 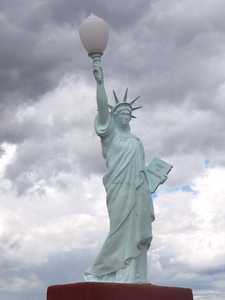 She holds a torch transformed into luminous globe, which is fairly standard in the reproductions. 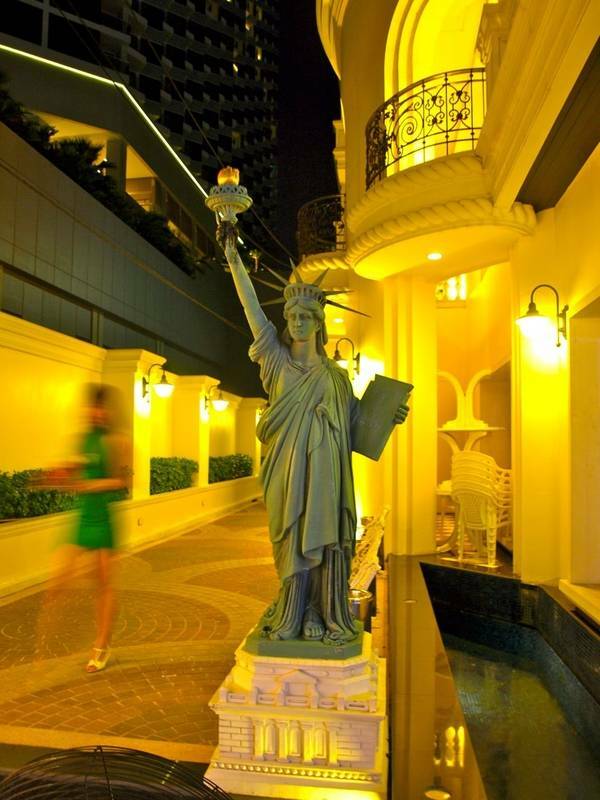 It is on a very high pedestal that rises at the restaurant roof level which it touts. It is at Phillipi Creek Oyster Bar at Phillipi Creek. It is an oyster bar. 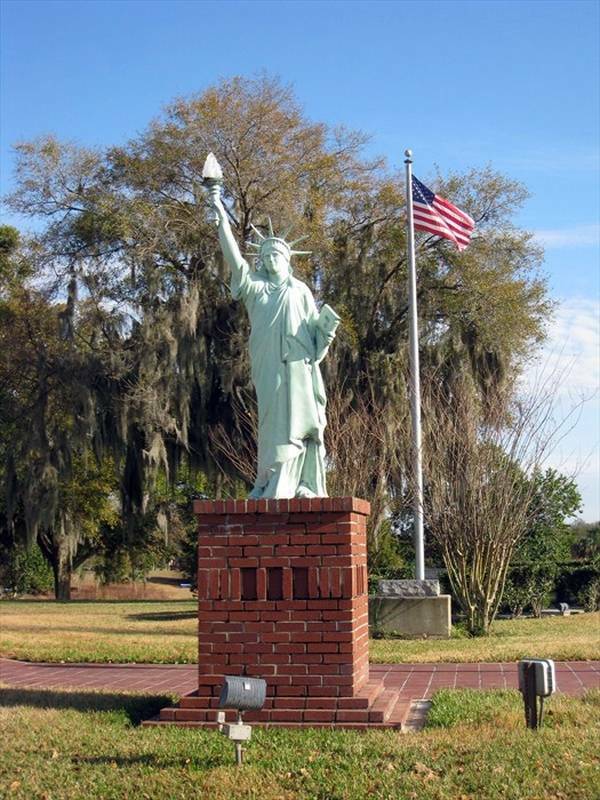 In the city of Tampa visitors can see the reproduction of the Statue of Liberty on the sidewalk. If it is not particularly successful she is not particularly missed, which makes ordinary. Its huge luminous globe frankly all waste, but not as much as this hideous concrete base painted hastily in white. Too bad because the statue itself is well reproduced. 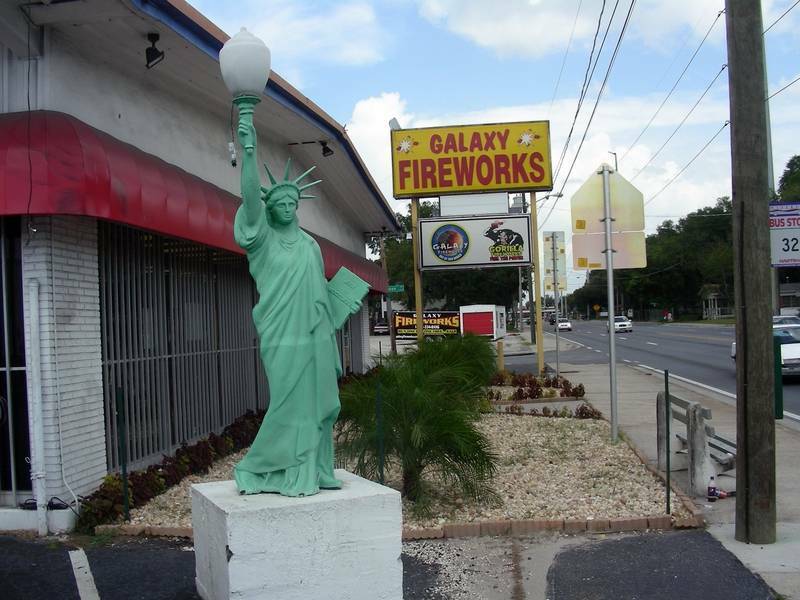 It is located in the city of Tampa, at the parking entrance of the store "Galaxy Fireworks" at the 200th block of Martin Luther King Boulevard. This rather crude replica of the Statue of Liberty is located at 2929 5th Avenue in North, in St. Petersburg, Florida. It adorns the entrance to the offices of lawyers Arturo Rios. If the base is simple but successful, the statue is less, by the poor quality of its finishes. It takes too much light for her. 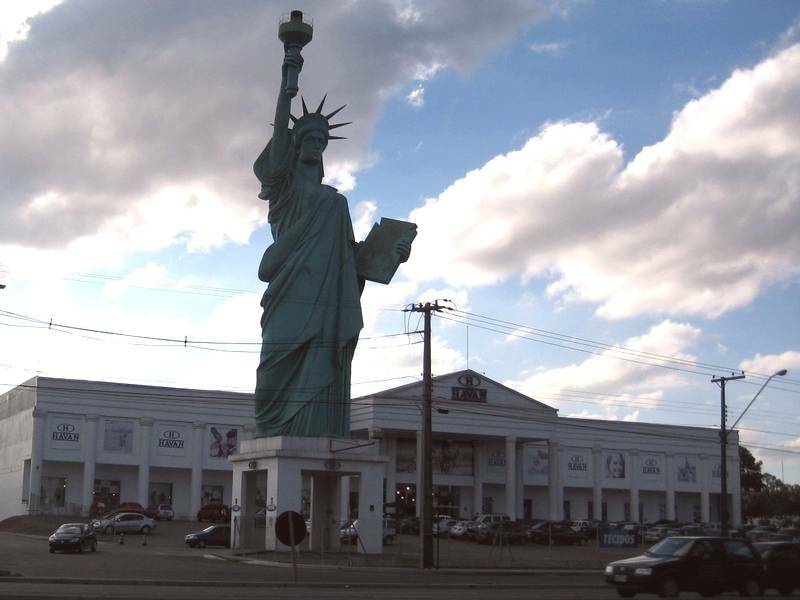 This replica of the Statue of Liberty has an advertising purpose, it is on the roof of a shopping center. 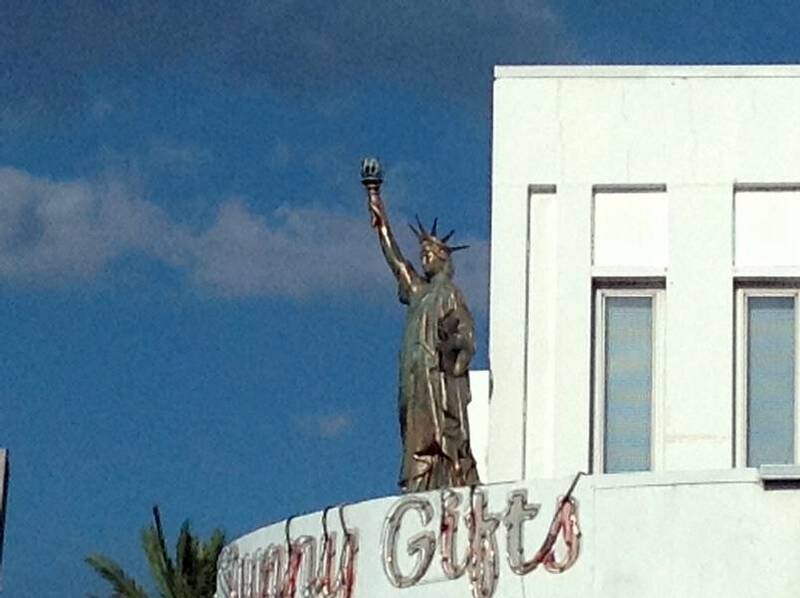 Just below, there is a shop, "Sunny Gifts," which is the entrance to the shopping center "Liberty Resort Management". 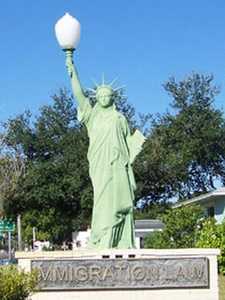 It lies at the intersection of Gulf Boulevard and 107th Avenue in Treasure Island, Florida. 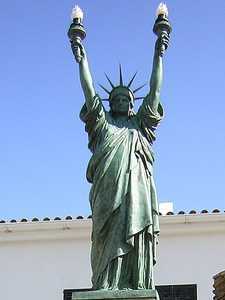 This reproduction of the Statue of Liberty is quite simple, it is quite loyal what the stroke is a bit too large. The port of the tablet is correct, as well as 7-rays of the crown, and yet it is not easy to reproduce without errors. It is located in the town of Blue Ridge, Georgia (USA), ahead of former Fannin County building. 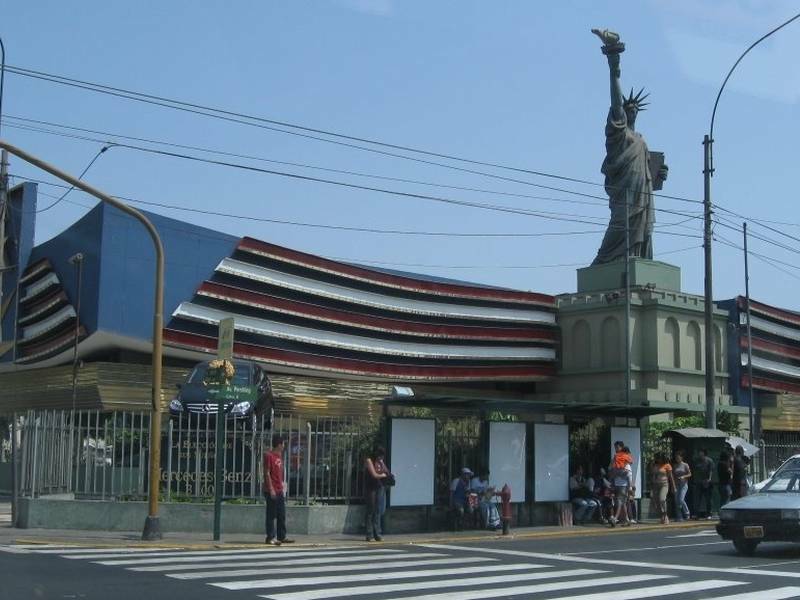 The city has the Square of Liberty, necessarily decorated with a pretty stylized statue. 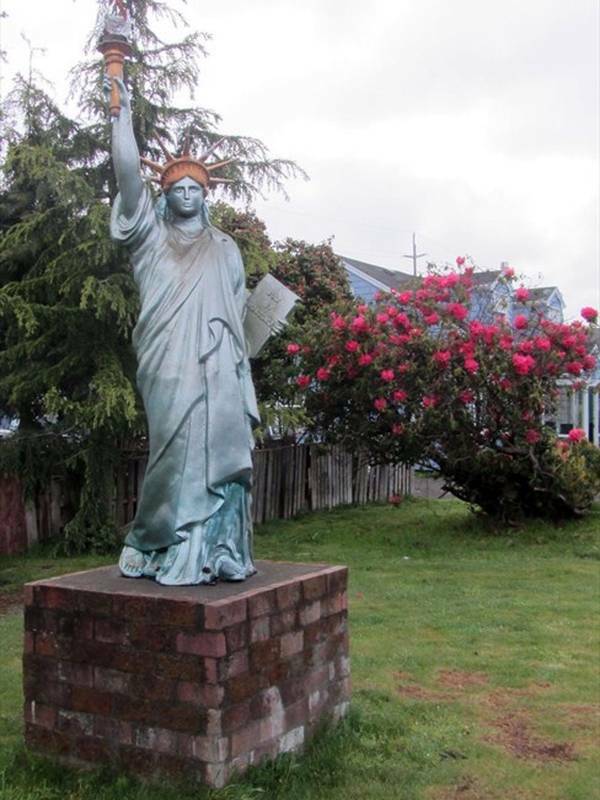 In 1986 the Lion's Club McRae decided to erect a statue of Liberty in their city. 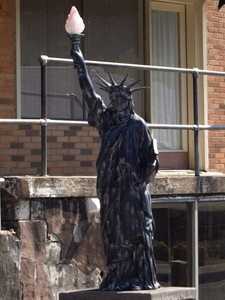 Members raised funds, but the harvest was too skinny to hope melt an original statue. 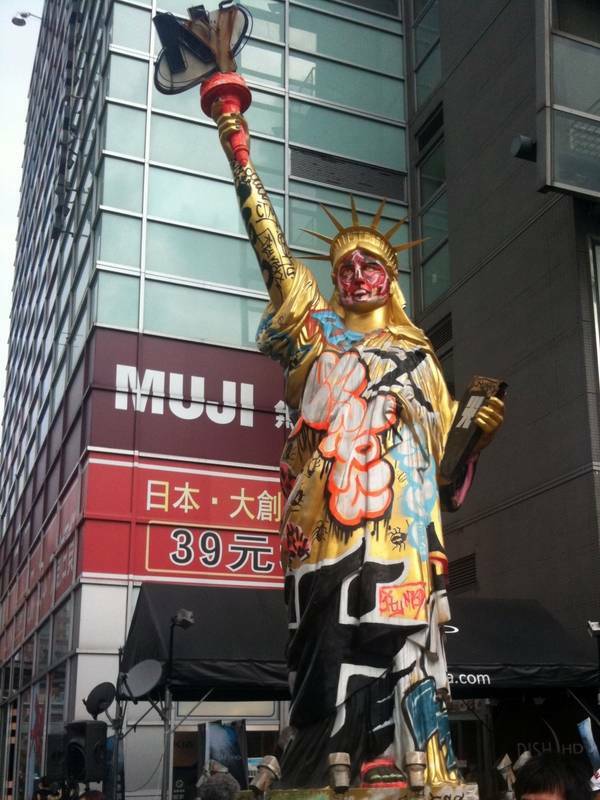 By cons, they obtained a lot of material to make the statue, so they decided to do it themselves. The result is not very consistent with the original, leaving the aesthetic to be desired. 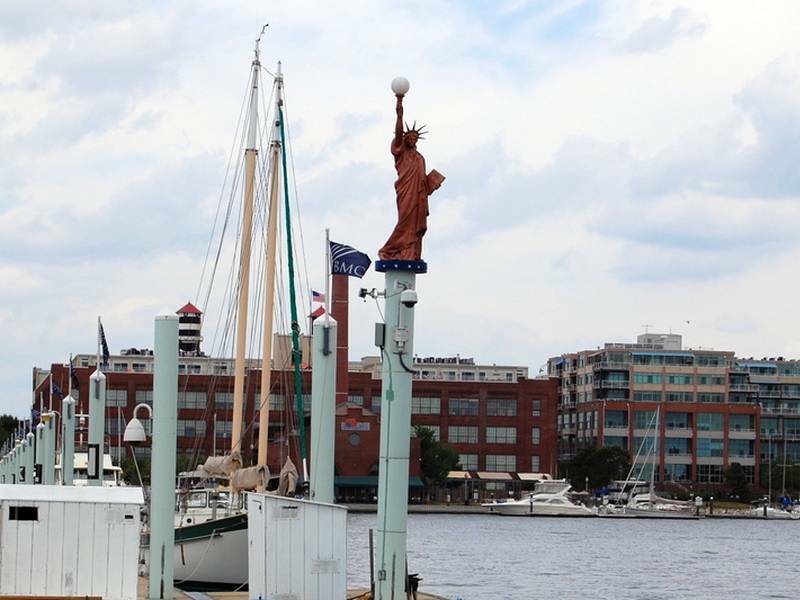 But the will of a handful of volunteers has succeeded: Deliver a Miss Liberty in their city. Anecdotally, they also made a "Liberty Bell." For that, they recuperated the old bell of the fire station and the split open a large sledgehammer. Successful operation, the bell now looks like that of Philadelphia. 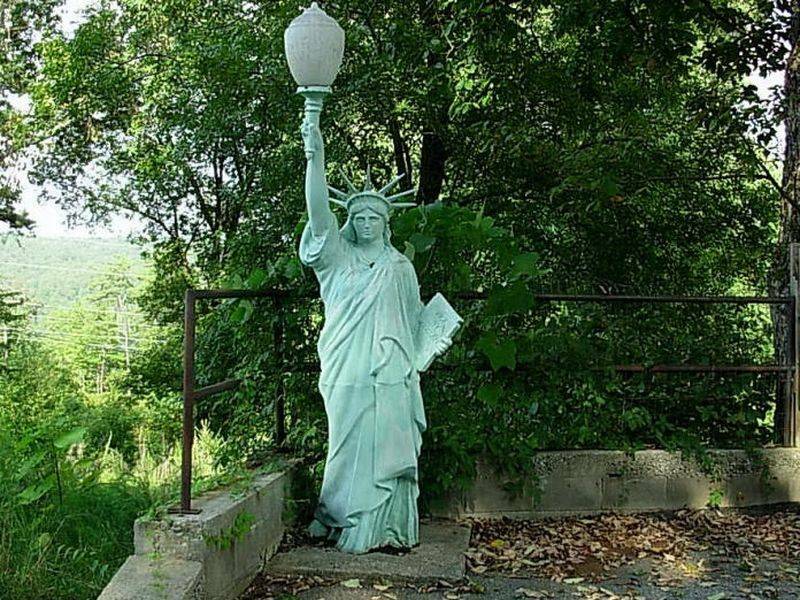 If the location of this reproduction of the Statue of Liberty is paradise, which changes a little eternal American inner cities, this statue is just ridiculous because of its small size and its huge illuminated globe. Its small size is justified by the fact that she underwent surgery at the hip: It was cut in half and resoldered after removal of the hips. So, she proportion. Tallulah Gorge is near Clayton, Georgia, and this statue is on the terrace of a restaurant overlooking the valley. 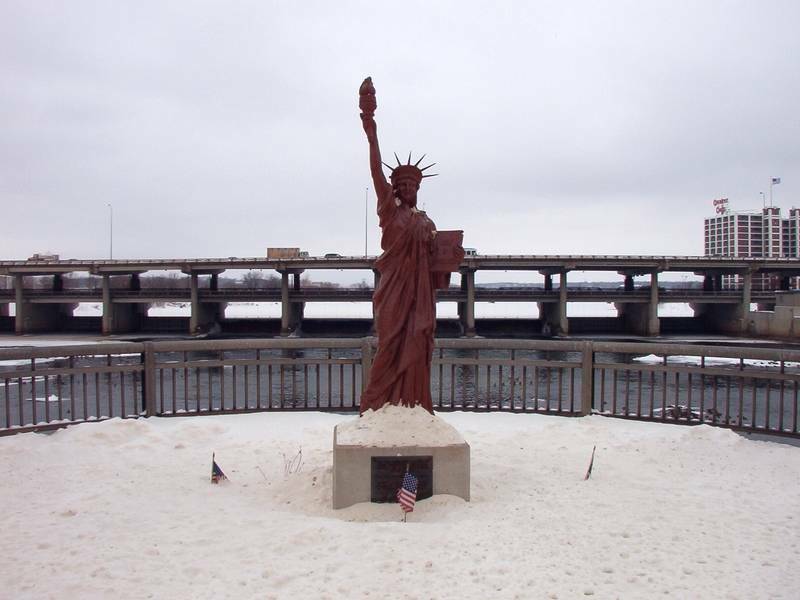 The city of Cedar Rapids, Iowa, is a winter city, very north of the United States. 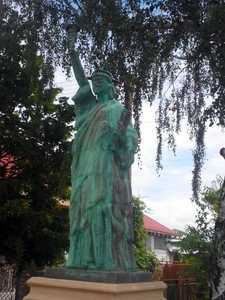 It has a replica of the Statue of Liberty for quite some years. It is located at the intersection of 1st Avenue and the local river, the (or) Cedar. Note that during the month of June 2008, the Cedar overflowed. The level was so high that the statue was under water! This copy is at Veterans Memorial Park near "Blackhawk County War Memorial" in Waterloo, Iowa. It is in the middle of the sidewalk, on a very high pedestal, beige stone. 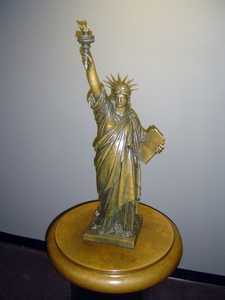 The copper plate, just below, indicates that this is one of the many replicas made by the Boy Scouts in 1950 for that. It is clearly visible from everywhere, including the road crossing the river. 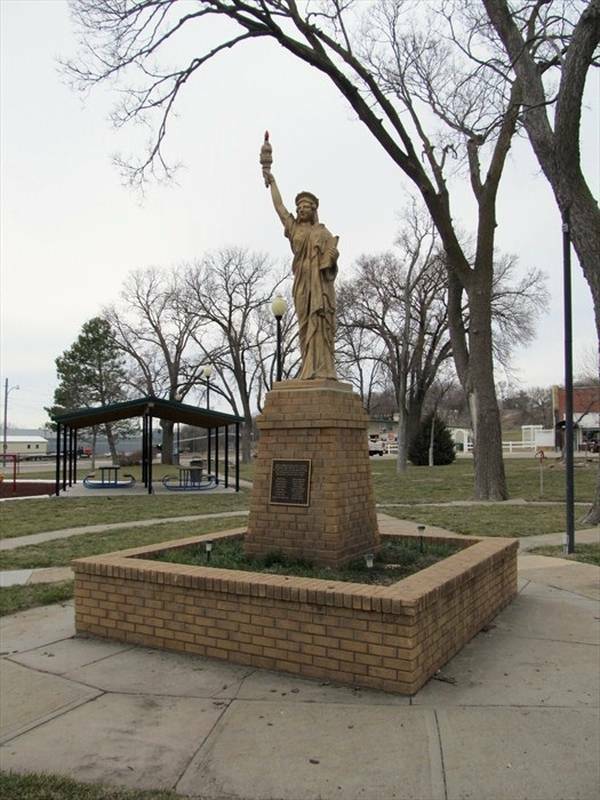 The Statue of Liberty is located in West Point City Park. It looks like those that have been put in place across the United States in the 50s, for the Boy Scouts. 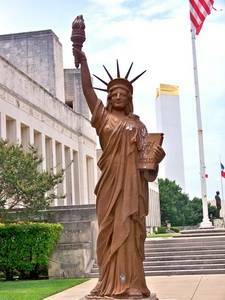 She's probably in bronze, and is perched on an impressive stand, almost too big for the size of the statue. 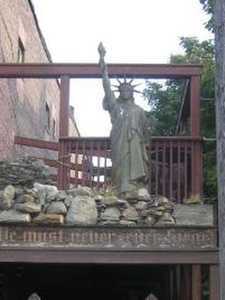 This base is exposed stone and many architectural details suggest a replica of the real bedrock of Miss Liberty in New York. Near the statue is found in the park, a war memorial. This statue is recent, it is made of resin. It is located on Lake Pend Oreille, a large lake in Idaho, as this state has many. 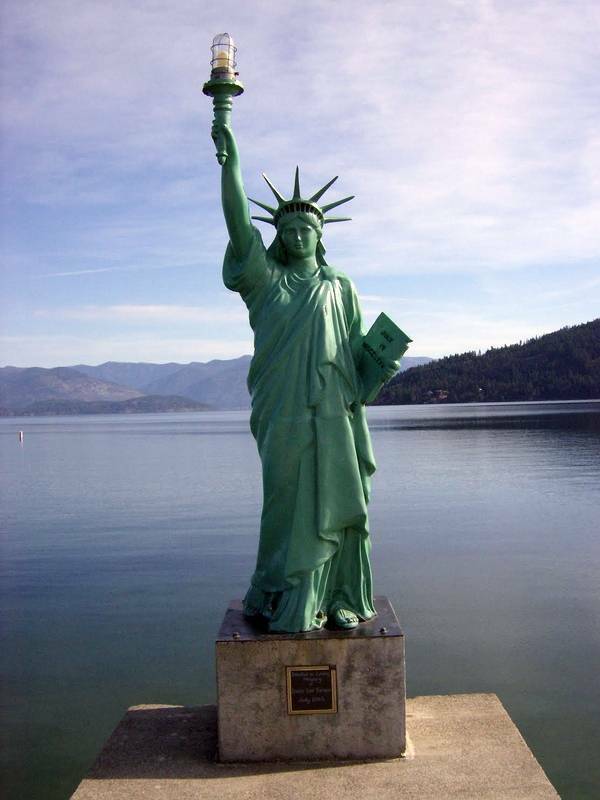 It is surrounded by mountains, so even if you can relate it to a city, it is rather known as the Statue of Liberty Lake Pend Oreille. It is at the end of a long narrow pontoon concrete advance twenty meters into the lake. This fairly simple replica of the statue on the roof of a familly company Melrose Park, Illinois. The two American flags surrounding it proves patriotism owners. Artistically this statue is not very interesting, it has some defect such as the position of the fingers on the torch, crown the rays that leave too much up in the air and folds of the gown in the arm, too broad. 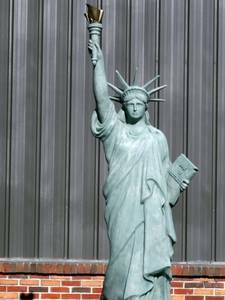 This reproduction of the Statue of Liberty is original by the impressive size of her crown, which really gives the impression that this is a hat, or even a sombero. Furthermore the size of the statue is relatively small in its proportions. 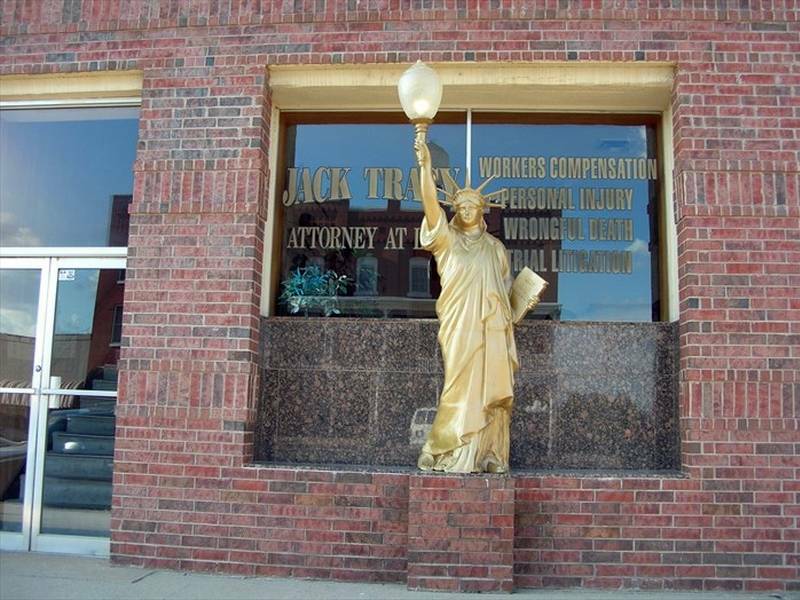 It is located at 2392 North Milwaukee Milwaukee Avenue in the bank "Liberty Bank for Savings". It serves as an advertising sign on a building of the 60 in the middle of a neighborhood where no other building is modern. This replica is quite interesting because it is relatively faithful to the original, except for the course lamppost. It is made of copper and is at the center of a small personal memorial. To its right there is the American Eagle (who does not one, actually) and Liberty Bell, the original is in Philadelphia. It is not easy to find because it belongs to a private, who put on her land. The address is on Glasford Road, 7 miles south of the city of Hanna City. 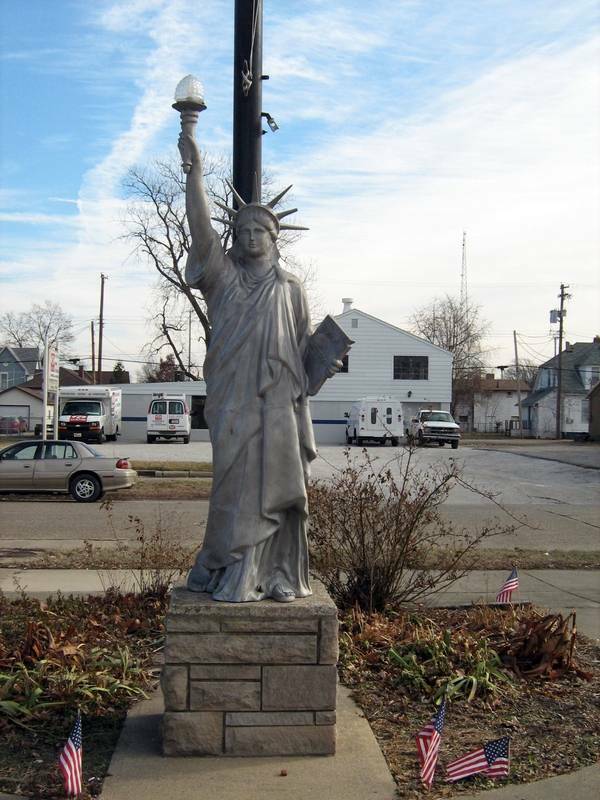 This modest replica of the statue is the 1035 South Clark Boulevard in the city of Clarkville, Indiana. It serves as an advertising sign in a small center of economic activity. There is nothing to say special, except that it is not bad at all reproduced. It is located on Highway Dale at number 231. Dale is a city of Indiana. It is quite interesting but has some design flaws, as its port of the tablet, too open on the front. The crown, by cons, is fairly well reproduced. It is laid on a simple plain concrete base. It can be freely seen from the outside, although it is a private property. 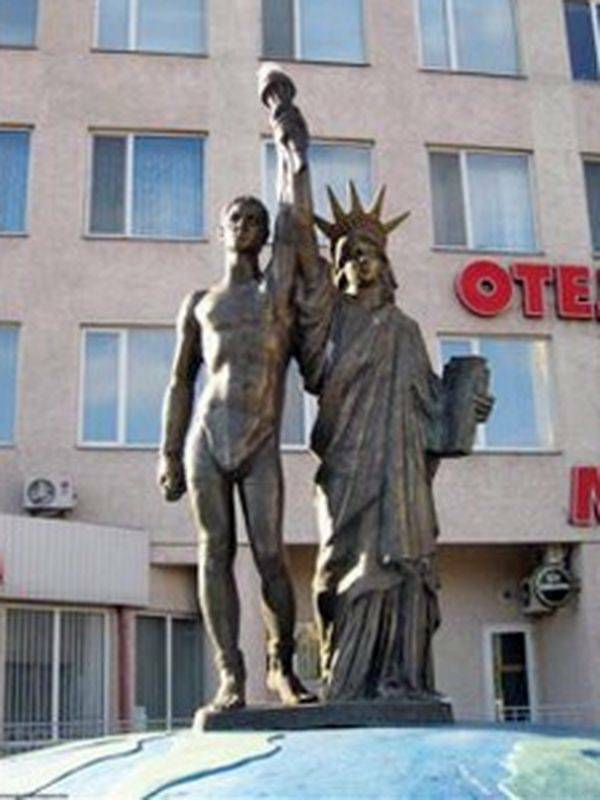 Do not confuse this with the statue of the campaign "Strengthening Freedom arm", which dates from 1950 and was to install 200 replicas all over the country. 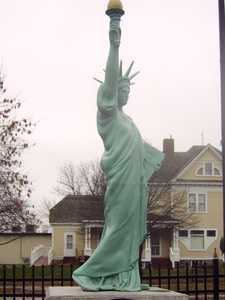 This statue will, in Plymouth, did not belong, despite its similar traits. 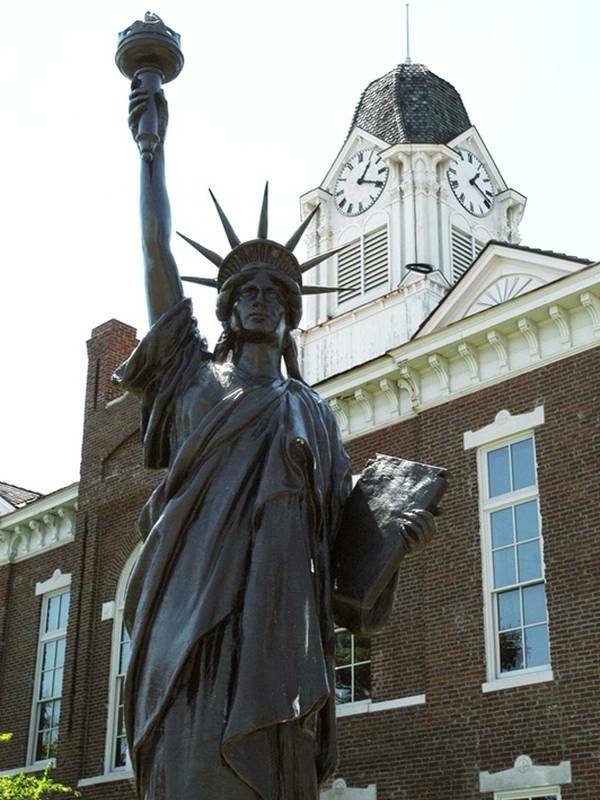 It is located in front of the courthouse in Plymouth, Indiana, and serves as a memorial to the September 11 attacks. 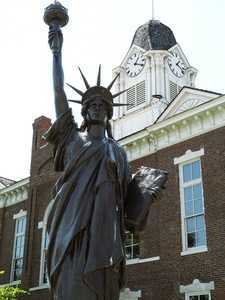 This human-sized reproduction of the Statue of Liberty is in Terre Haute, Indiana. 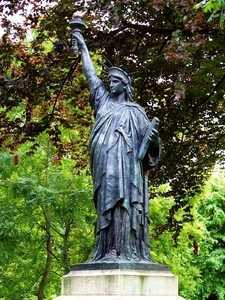 It serves as a memorial to those who defended liberty, but it is a small memorial, much like a secular oratory. It has no inscription plate. From a practical point of view, her torch is public lighting. It is located in front of the VFW Post 972. 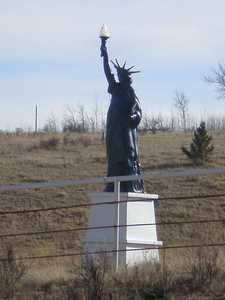 This replica is in Glen Elder, a Kansas town. Specifically it is downtown, in a very nice public park. It was mounted like a little brick monument. 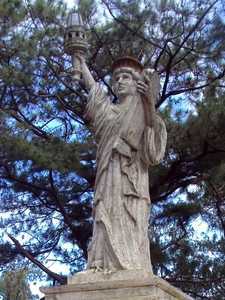 The statue, it is in white stone. This is a gift that was made by Emily Slavin to the municipality in 1950. 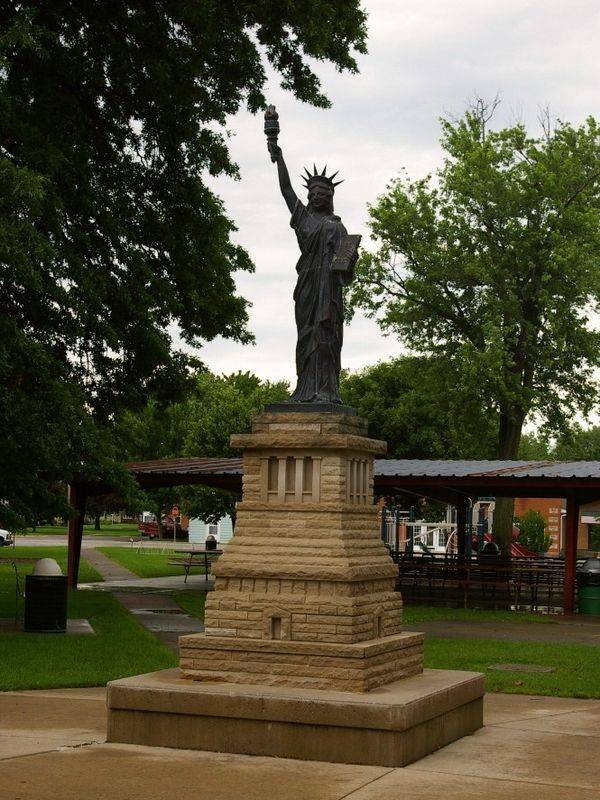 The pedestal and the small monument on which it is currently located was financed thanks to the fundraising done in the city by "Glen Elder American Legion Post 143 "and the" Glen Elder American Legion Post 143 Ladies' Auxiliary". 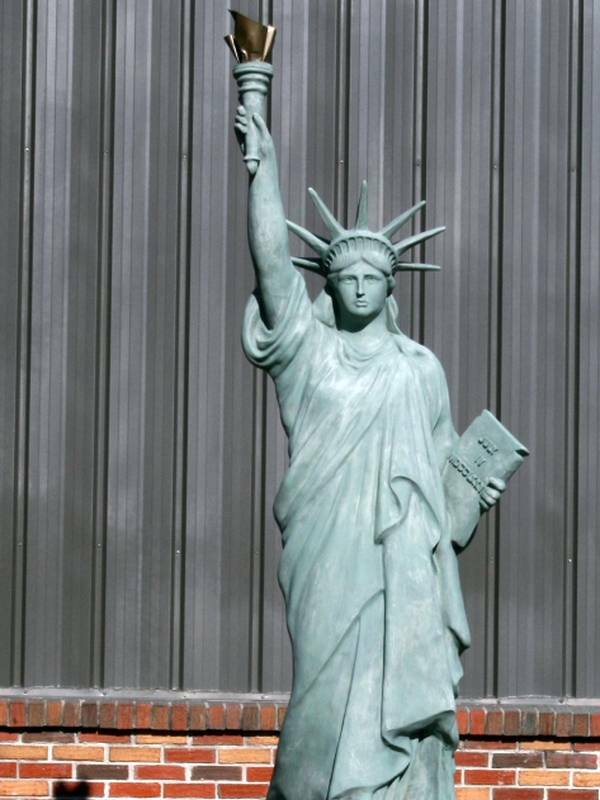 This copy of the Statue of Liberty is not very large but is relatively consistent with the original, at least in comparison to other less successful replicas. It is made of polymer, the details of the gown to be minor. How are folded fingers on the handle of the toche is original, it is just if it will not fall from her hands! This statue serves as a memorial, it is located along US 60, just before you get to the old school of Olive Hill, now the "Olive Hill Historical Society." 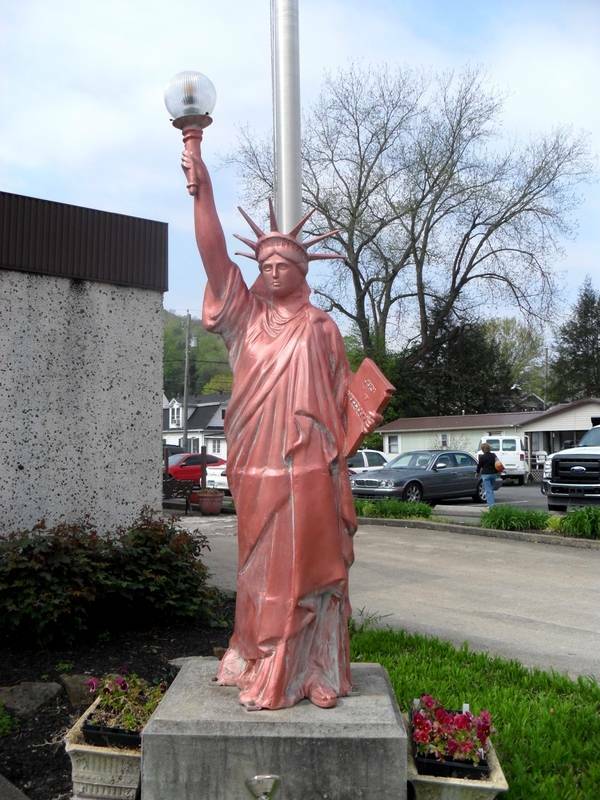 Finally an original statue of a beautiful pink color. It is in this small town of Pineville, close to City Hall. 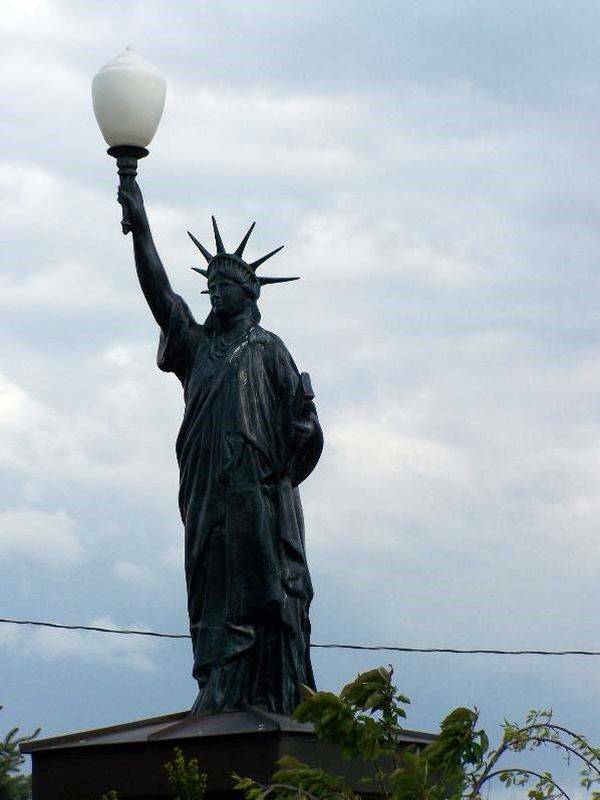 It serves as a lamppost. It's looking up you will see the copy of the statue of Liberty. It is located in Baton Rouge, Louisiana, and more exactly on top of the pizza Johnny De Angelo, at 4606 Jones Creek Road. This pizzeria is "White oak Village shopping center," the local mall. 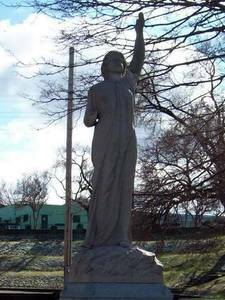 The statue is visible from everywhere, her silhouetted in the sky. Artistically, it is not interesting, it is just a piece of molded plastic rather crude way, but it's still an effect. The torch has been replaced by a light, which is quite conventional. This replica is in New Orleans, United States (Louisiana). Measuring approximately 3 meters high, it is fairly well made and looks pretty well to the original statue. The horizontal black mark, which extends over the walls behind her is the height has reached the water during the flood that occurred at the time of Katrina storm. This photo was taken can after this storm. 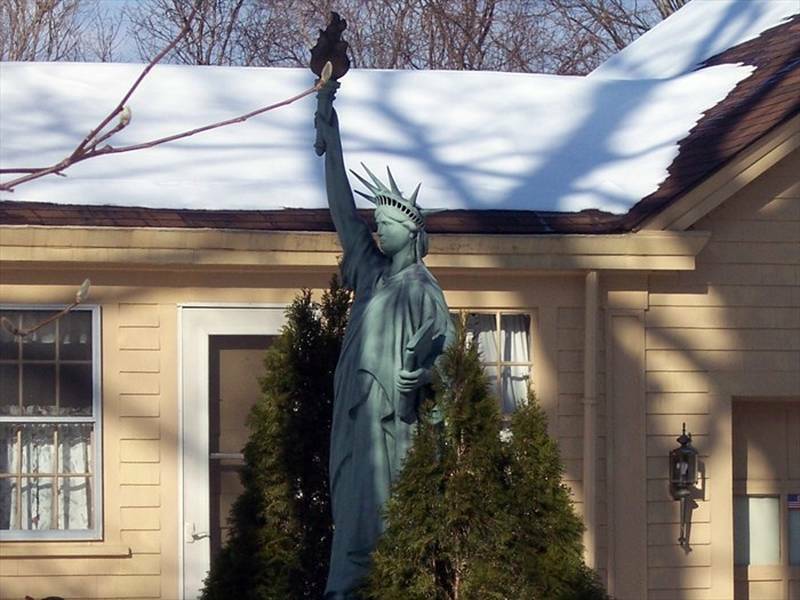 The North Andover city has a large statue of Liberty performed quite well. She just its rays coming a little too low and its tablet range a little too far from the body. 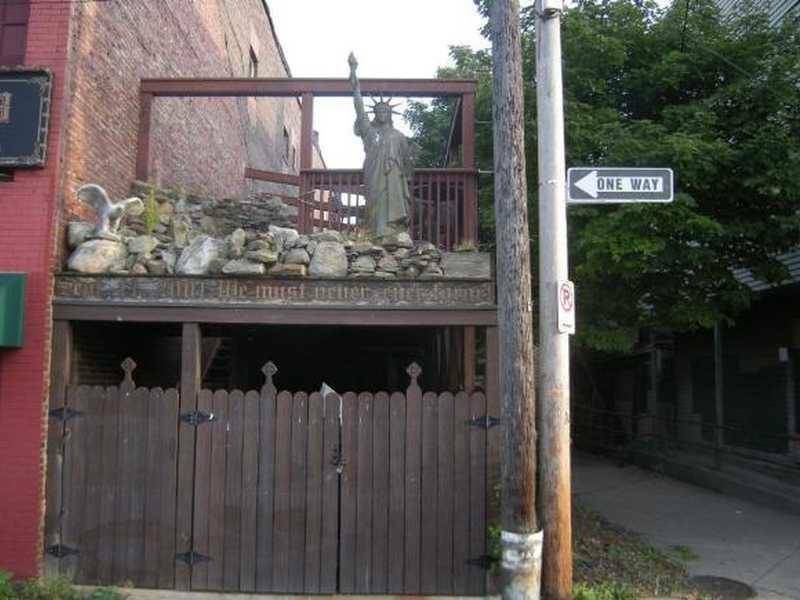 It is located on private property but can be seen from the street without problem. 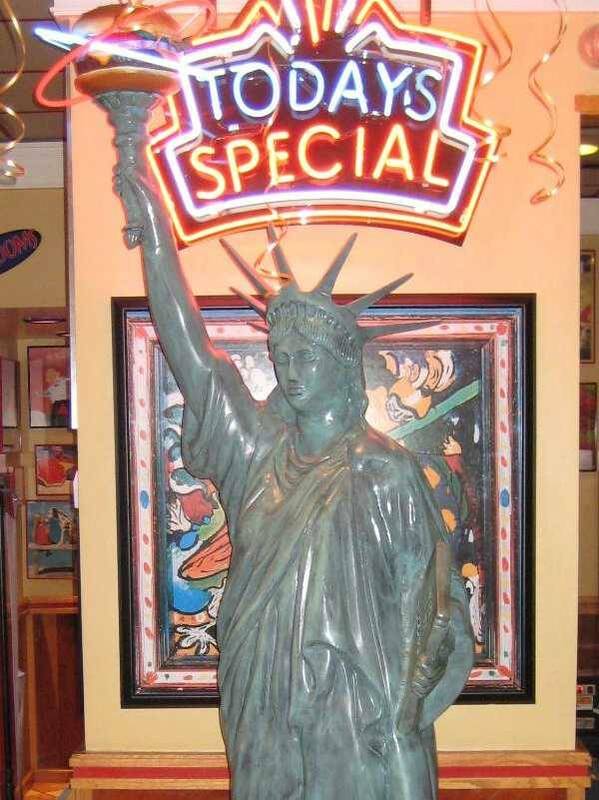 Once reproduction of the Statue of Liberty in advertising pub. This however, is more interesting than the others because it is a fairly high fidelity, whatever the rays coming out of her crown are too constricted and too short gown on the front. But the quality is there, it must be said. 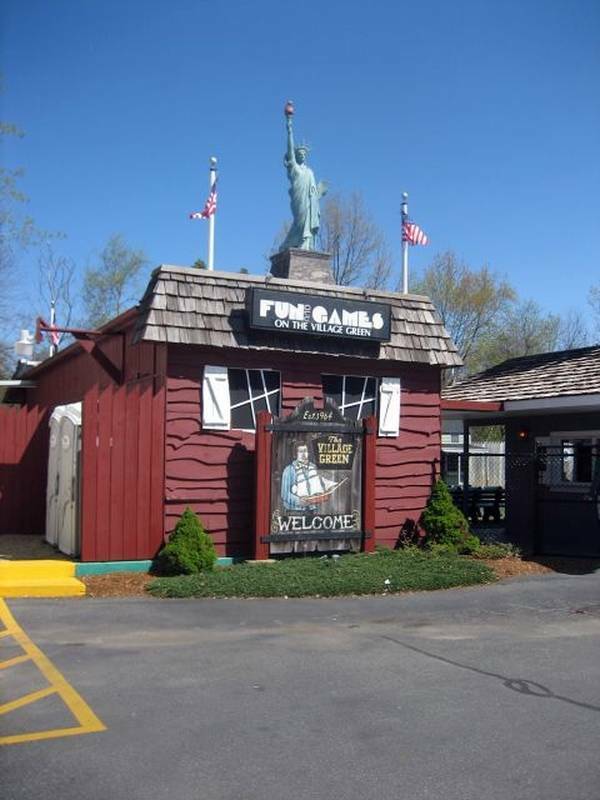 The statue used to teach a mini golf course named "Golf on the Village Green." 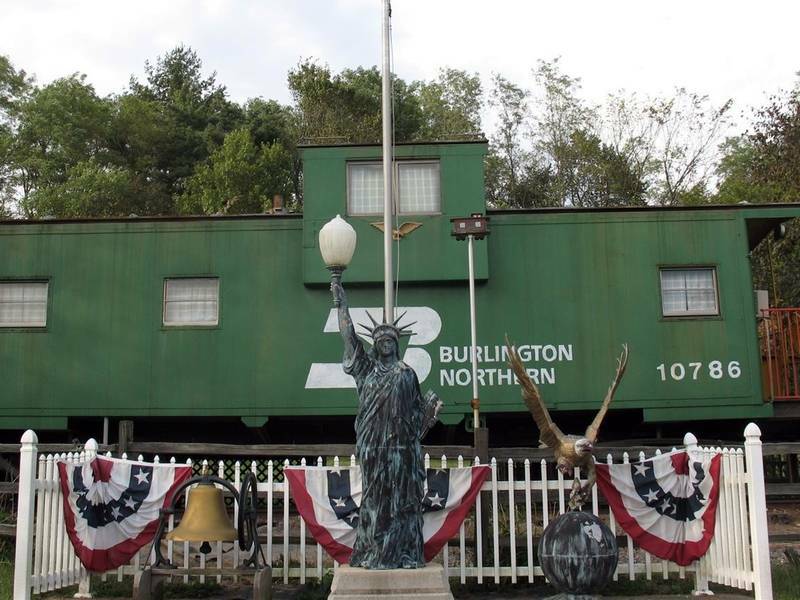 It is located in the town of Natick, exactly along the road No. 9 in East Natick. 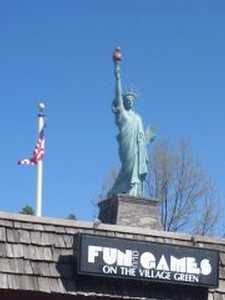 The main building serves as support for various objects: the roof supports an air hockey table, pool table, and of course the Statue of Liberty, facing the parking lot. It is surrounded by flags. 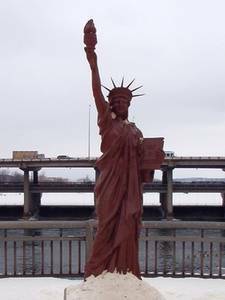 It measures about 6 feet tall, torch included, and it has the same verdigris color as the original statue, except the torch, deep red. The owners retire during the winter months, to see so you have to get to another period from November to April. This is a replica of the statue although strangely positioned at the end of a pontoon. We are in the port of Baltimore, Maryland, pontoon water taxi. 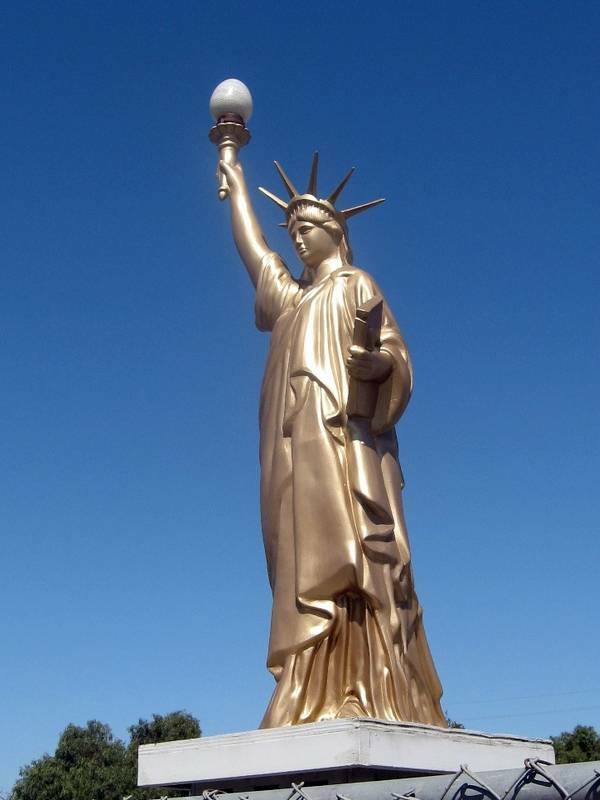 One of the poles hosts the statue, a replica that looks very well reproduced, with the exception of her torch, replaced by a lamp. 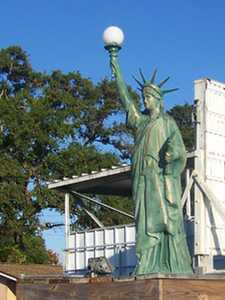 It is possible that this light used to night navigation in the harbor. Still, it is not easy to do, take a boat to admire it from the front. 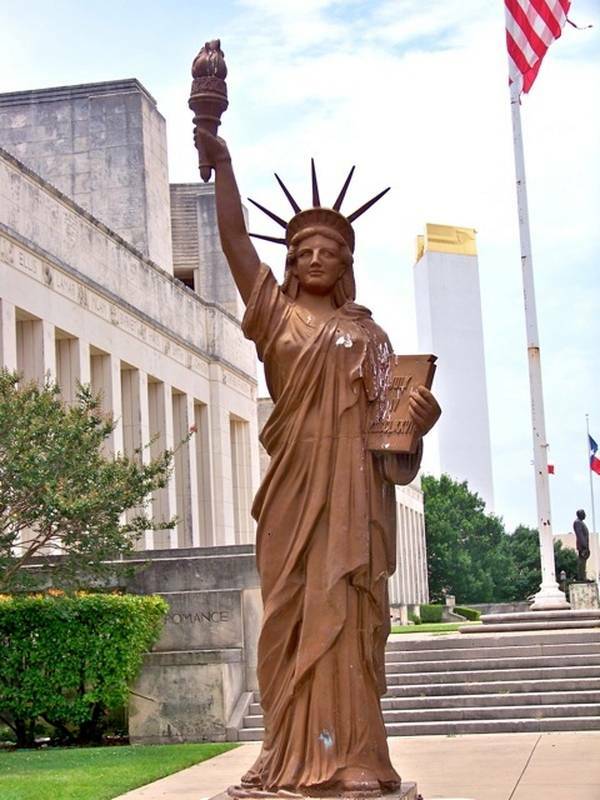 The second statue of Holly is not end of the campaign of Boy Scouts in 1950, it still does not have the characteristics, particularly the young face. It stands on a rather high pedestal and serves light, as many replicas in the world. In the town of Highland, Michigan, is a well-known local grocery store. Vintage style, it borders a small lake in which the visitor can see a small square pontoon center of which stands the statue of Liberty, a replica of approximately 2.50m tall with the characteristic of having a very wide rail torch . The rest is difficult to judge, but it seems to hold the tablet too far forward. When the broken chain of slavery, they were once again ignored. 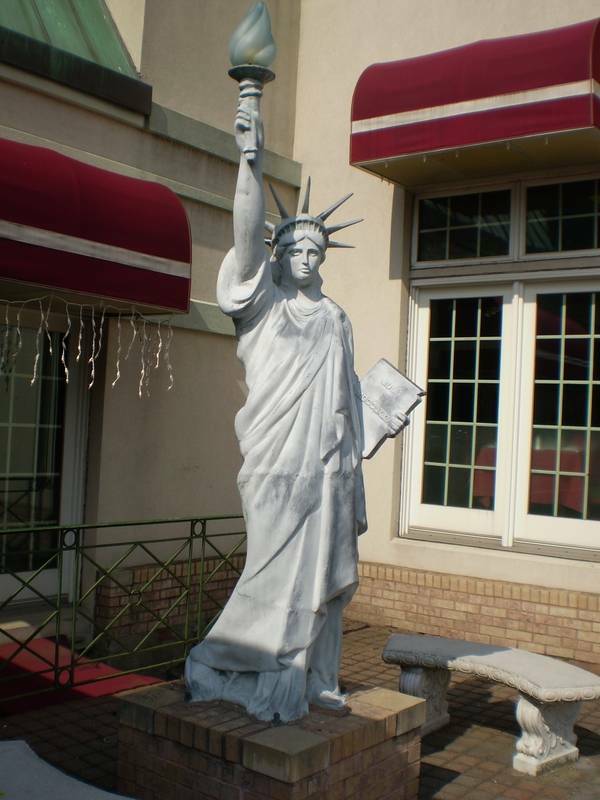 This replica is located in Michigan, in the city of Frankenmuth. It is part of a series of statues representing various people. This is the "Bronner's Christmas Wonderland", a Christmas goods store founded in 1945. It is right next to the entrance. This statue is probably hard plastic. 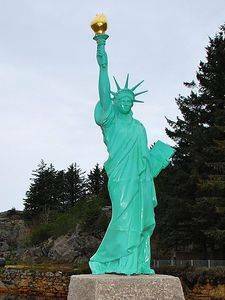 Originally painted in dark red, she was repainted in the traditional green but the paint was peeling in places. The mold which has served to make this replica is not that bad, but it still has some differences: for example, the tablet is held too far forward, and the rays, whatever of different lengths are too upright to the top. 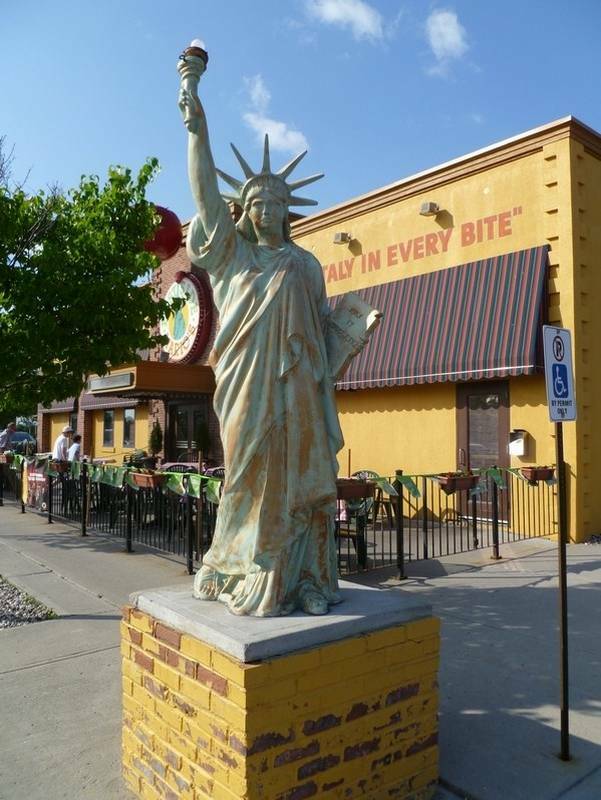 C'est dans la ville de Dearborn, dans le Michigan, que l'on peut trouver cette réplique de la statue. Elle se trouve à l'entrée d'une discothèque, le "Venue nightclub", sur Michigan avenue. Elle est face au parking et sert de luminaire à l'entrée. J'ignore en quelle matière elle est faite, elle ressemble à de la pierre mais il serait étonnant que ça en soit. A noter le socle en brique de la même matière que le mur derrière. Pretty small statue of an intense green in front of an American memorial. The face is youthful as can the statues of the boy scouts, made and spread across the entire United States in 1950. Statue in juvenile air, resembling those implemented by the boy-scouts in 1950. 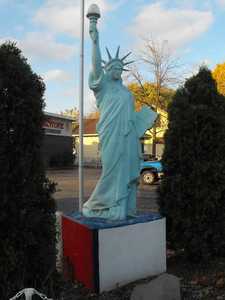 This copy of the Statue of Liberty is in Minnesota, in the city of Long Prairie. She's in the memorial park for war veterans. This park contains several monuments, including a wall five stories recounting the episode War Iwo Jima, wall topped with a metal sculpture representing the flag flying at Mount Surabachi. There is also a memorial to the veterans of Vietnam, Korea, another for women who died during the war, a national cemetery. The statue itself is quite simple, quite small relative to the other copies that exist in the world, but it is correctly reproduced. 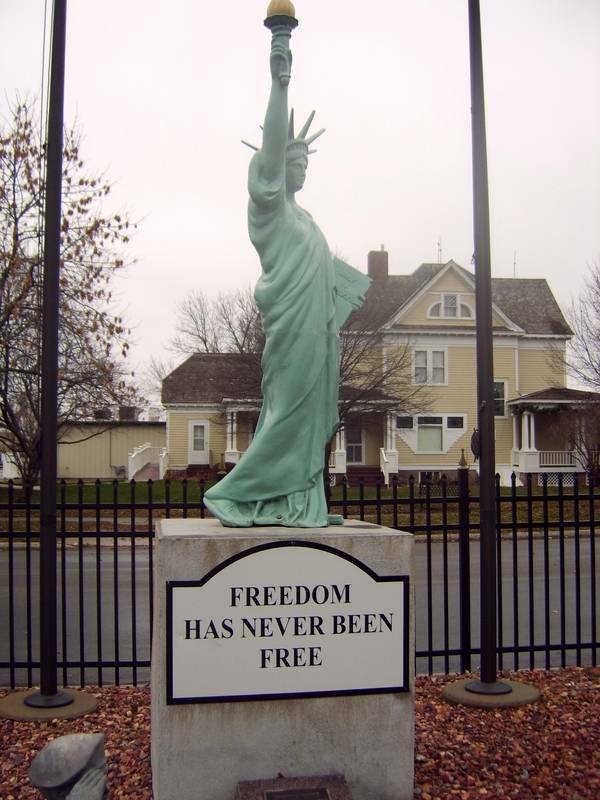 On the base, there is a curious mention: which means "Freedom has never been free," "Freedom HAS never been free.". 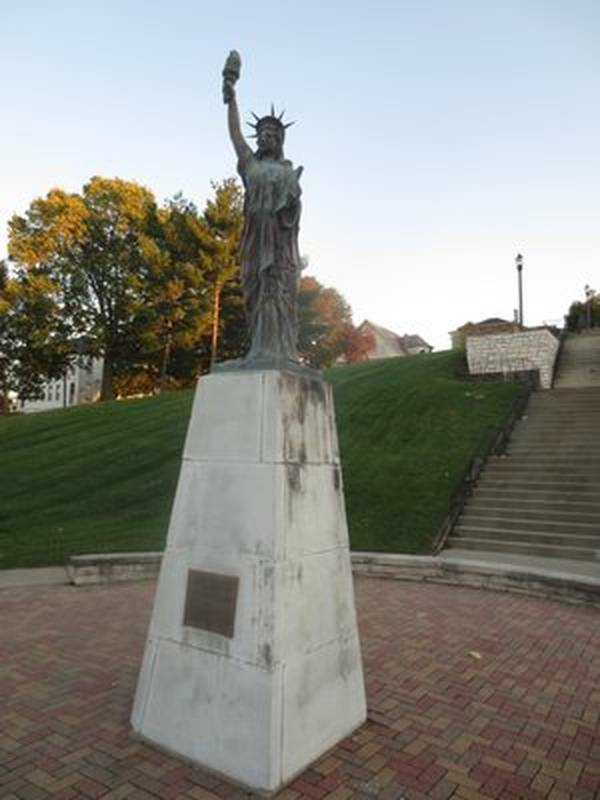 This statue, also after the campaign scouts of 1950, in the city of St. Joseph, Missouri. It was inaugurated in 1950. It is like other covered with copper plates which oxidize slowly. It is perched on a modest concrete pedestal, base plus a plaque commemorating its origin. 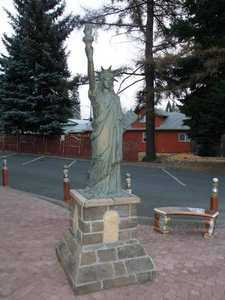 It's in Montana found the statue of Liberty, in the city of Polson. The latter houses a museum, at the southern edge of the city, which is none other than the private collection of an inhabitant. He called it "Miracle of America Museum". Its collections are eclectic, one finds there absolutely everything from Chinese art, Boy Scout badges, helicopter models, luminous insignia, petrol pumps, etc. 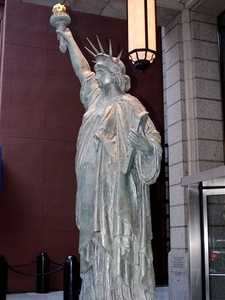 It also has a Statue of Liberty, but as it is too large it has placed outside, at the entrance of the museum. This explains why just go down the street to see it. 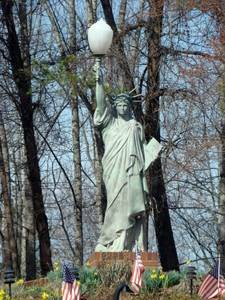 Even a correct replica of the Statue of Liberty, Mount Airy this time in North Carolina. 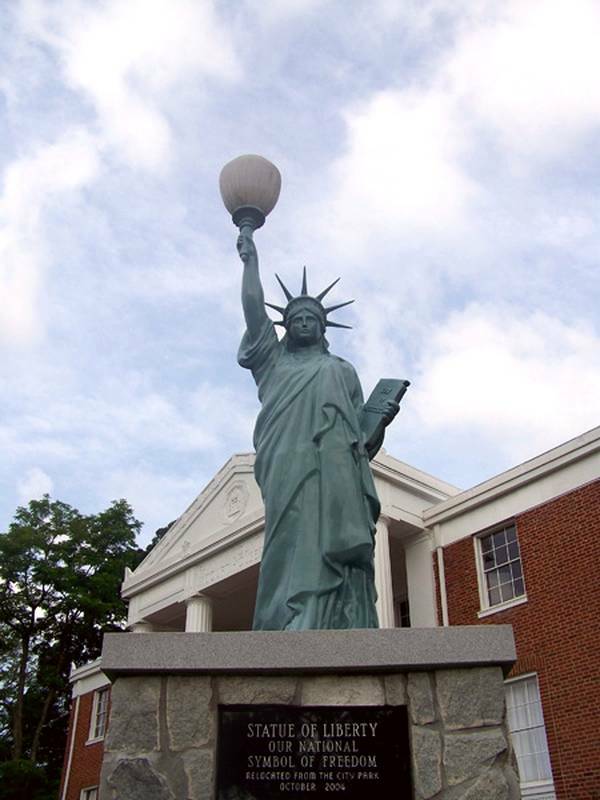 Mount Airy is a small town whose park contains this statue. A bright globe serves public lighting at night. 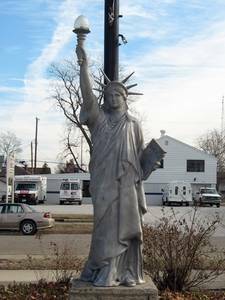 In New Jersey, in Haddon Heights, the local bakery has a highly decorated parking, it is adorned with a few statues, all golden. One that interests us is, like the other, perched on a small pedestal which is content to put forward its size. 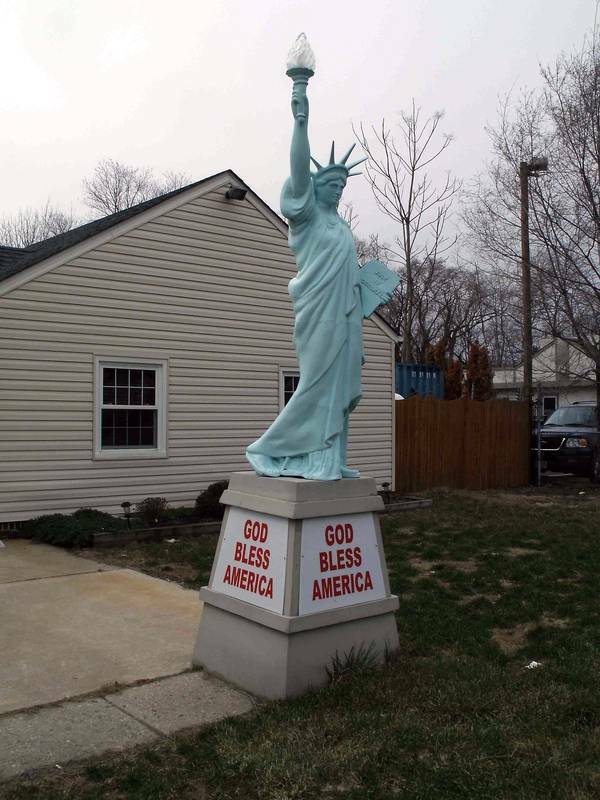 "God bless America" is the message that wants to pass this replica of the Statue of Liberty located in Somerdale, New Jersey. This is adjacent to the US state of New York, the proximity is great. It serves as an advertising sign in a business office. It is not very good likeness when one is interested more closely, she folds her baggy gown, she holds her tablet enough vertically, and her toga drops too low on the pedestal. This is simple, pyramid, probably in concrete. It is located along the historic route 30, clearly visible to all. 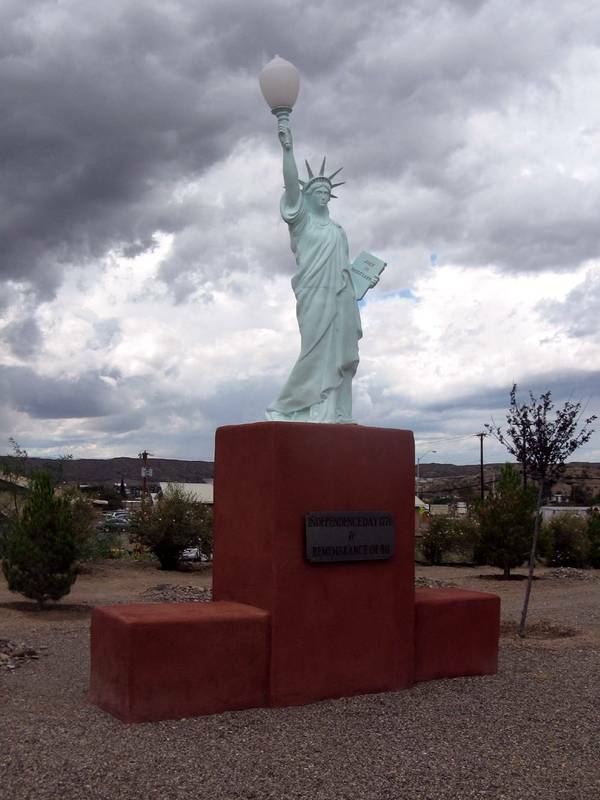 Probably one of the worst copies of the Statue of Liberty is located in Albuquerque, New Mexico. But we forgive him, he is only an ordinary promotional challenge for the passer. I must say it is inflatable, which does not help to provide a perfect replica. And anyway, this is a temporary copy, this kind of object is not destined to last in time. I guess when you read this, it no longer exists. The capital of the game trying to reproduce the great cities of the world, it is not surprising that we find here. 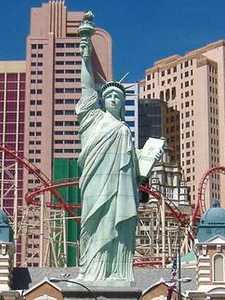 It is located in front of the New York Hotel, New York, which has an amusement park and scenery of New York buildings. 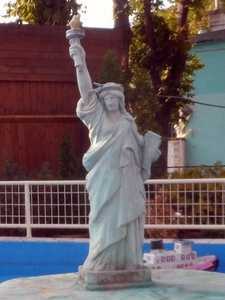 It is a statue of the original. 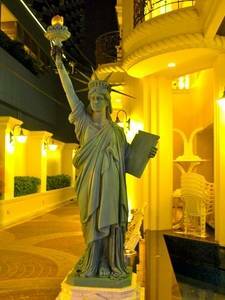 Las Vegas is an extravagant city, there are the New York hotel features the famous line on its front. Less known and most ephemeral, it is at the center of one of its shops. 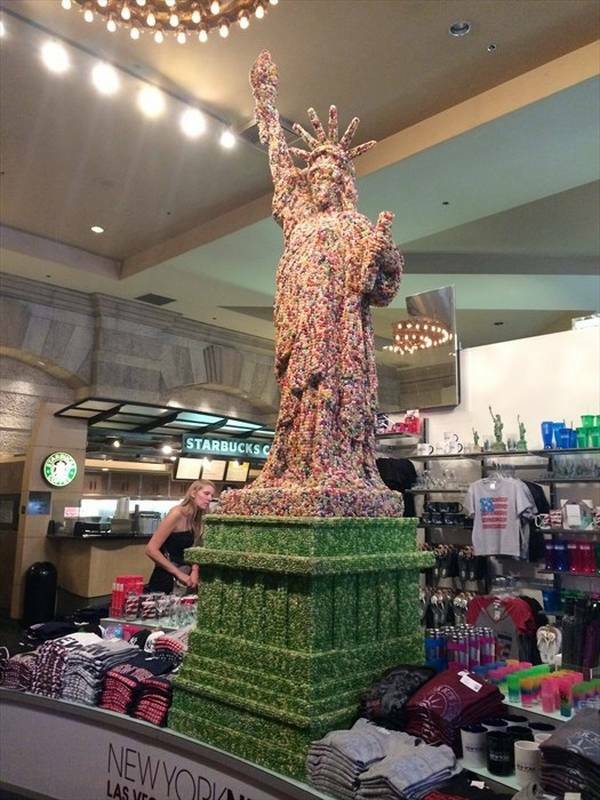 Its variegated color comes from the fact that it is made entirely of candy ... (jelly beans). Las Vegas, USA, is an extravagant city. Visitors can find anything at any time of day or night. 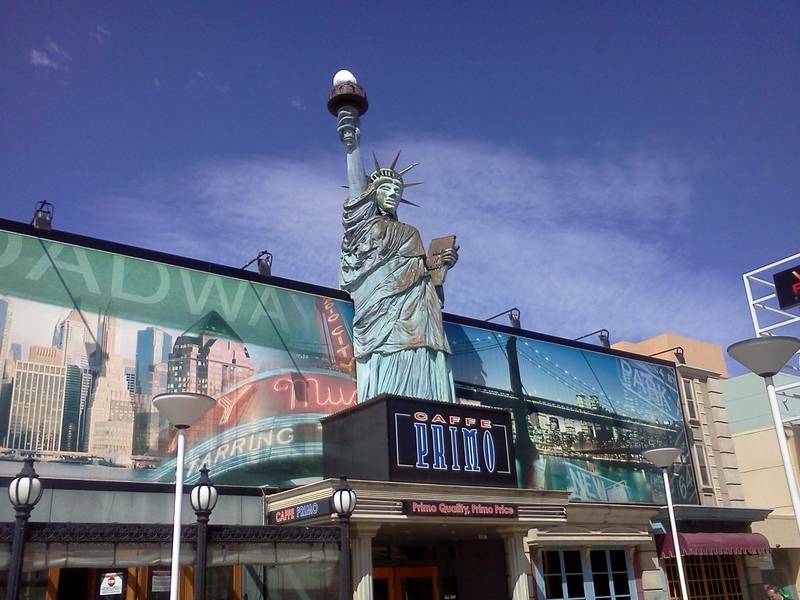 One of the many casinos in the city plays on the theme of American history, and as such he does not hesitate to mix genres: The proof that strange Statue of Liberty is taking as Marilyn Monroe in one of these familiar scenes. One can note the quality of reproduction, even if it has nothing to do with the original statue. In the State of New York is the town of Liverpool, which of course has nothing to do with the UK. Besides it is only a simple village. 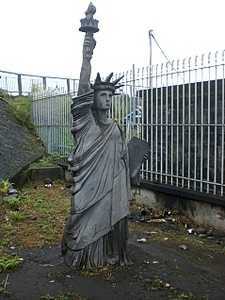 It has a Statue of Liberty, to the angle between the Electronics Parkway and the "Old Liverpool Road." It is close to the parking lot of a fairly popular pizzeria. 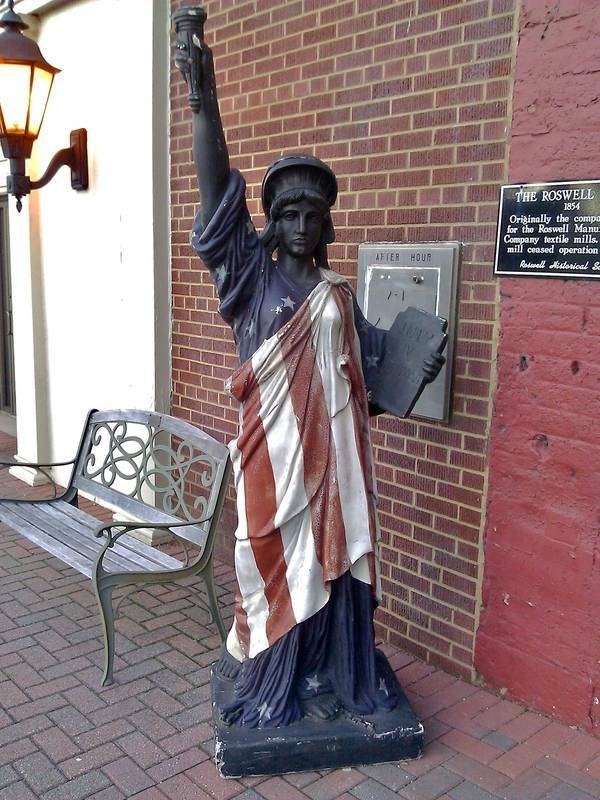 This statue seems to be in good condition, it holds an unavoidable fixture (not too ugly one). The rays extending from its crown are a bit too upright, but that's about all you can see it. Its pedestal is quite simple, wooden. This is a statue which very little is known. It is Husdon along Route 66, in the state of New York. It seems to be private property. Its green color is artificial, high blue portion appear, probably wear marks. 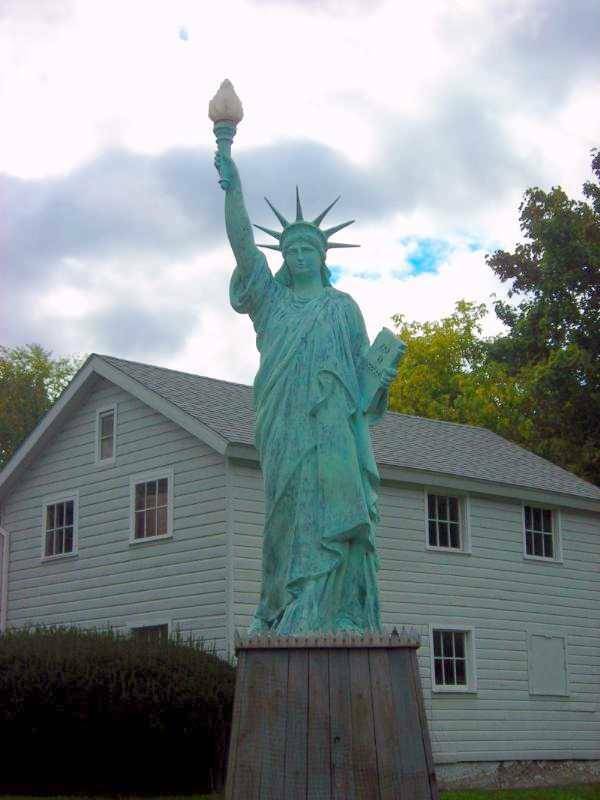 She holds the traditional light bulb instead of the traditional torch, and it is on a rather original pedestal, very simple, made of wooden planks. This reproduction of the Statue of Liberty is in plaster, it is a beautiful white uniform. This is an advertising sign for the City Café on Stewart Avenue, in the city of Garden City, NY. It is rather successful, but the plaster reaches by making the details of the folds of the gown, for example. And then, as usual, there are no broken chains of slavery, at her feet. 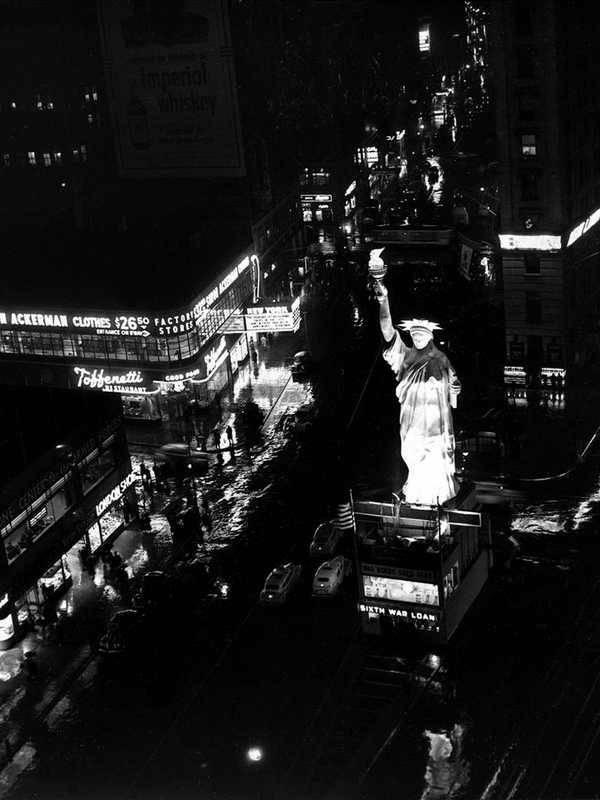 This reproduction of the Statue of Liberty was erected in 1944 in Times Square, probably the busiest area of New York, and there remained only a few months. The aim was to promote the "good war", debt issued by the State to support the military effort required during the Second World War. 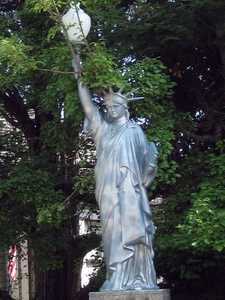 The statue was intended to push New Yorkers to buy such bonds. 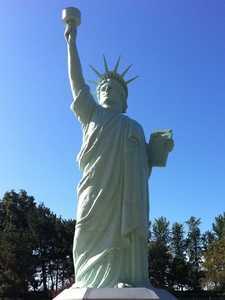 This statue even when measured about 15m in height! This is a small American town in the countryside. In front of a shed throne this small statue, he missed quite be said. This statue is a replica of the original. It is located in the museum, that is in the base of the statue, a little like a setting abyss. It is of great quality in the details, only its color and size makes the difference. It is presented on a small table. It speaks well of replicas and not the original. New York has multiple copies, the first mentioned here is in the lobby of a building. It is new and very nicely done. The Brooklyn Museum has a wing with replicas of the statues outside. 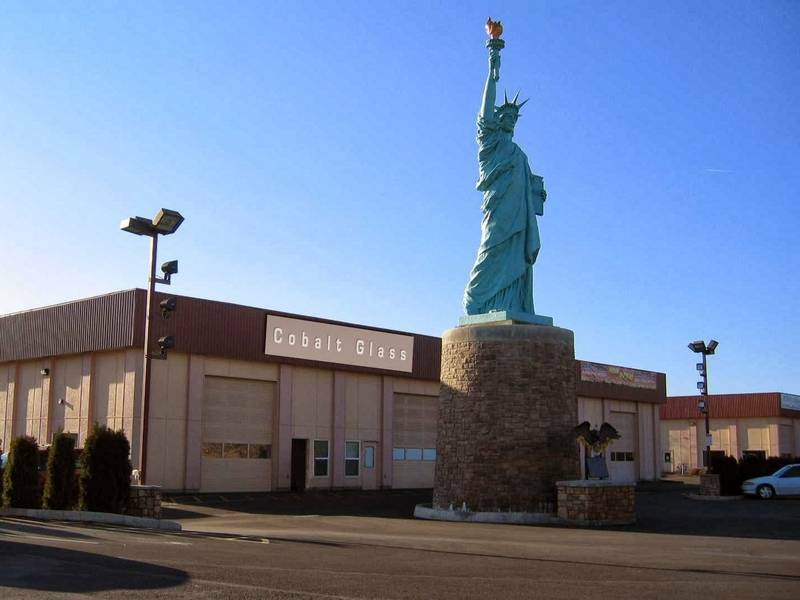 It is of course that it interests us, which initially comes from the "Liberty Storage Warehouse Building" at the corner of 64th and Broadway. When the building was renovated statue was donated to the museum, who installed the car park. 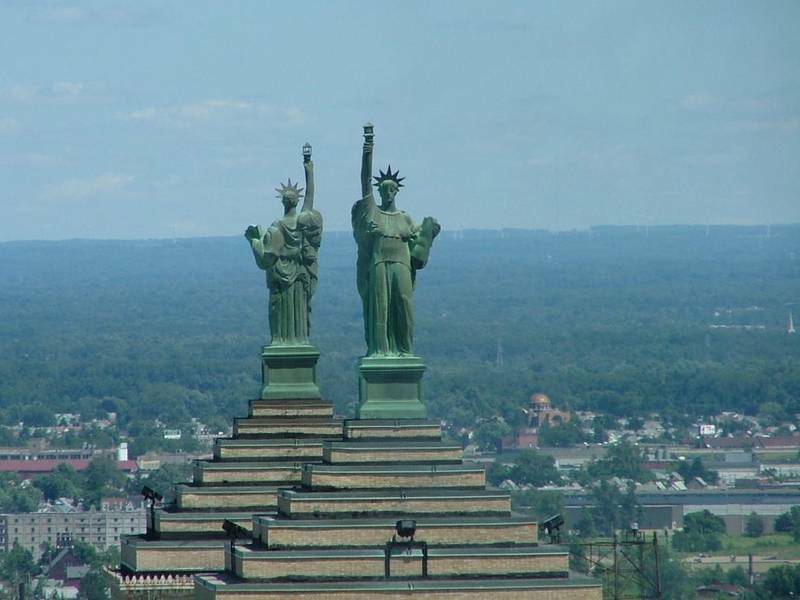 New York also has two well-known replicas, they are on the roof of the building and Buffalo are back to back. All replicas of New York, this is probably the oldest. 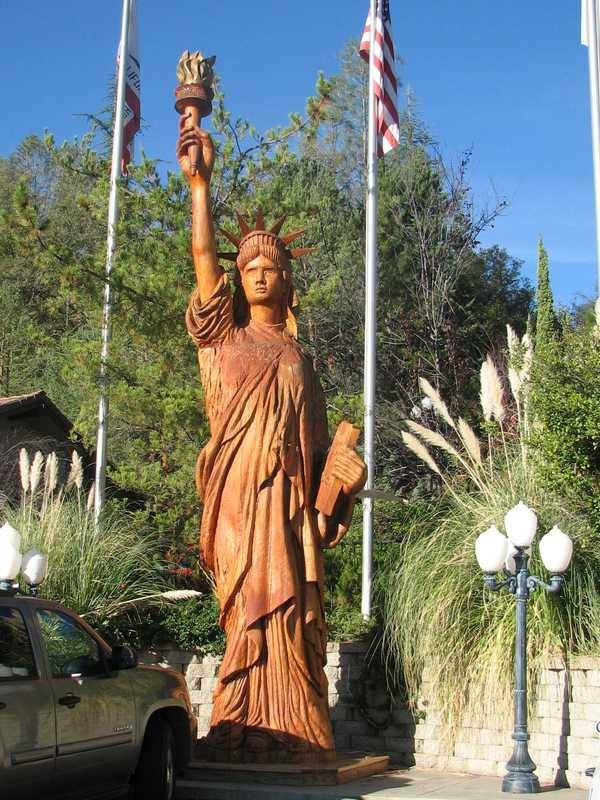 Despite appearances this statue was carved with a chainsaw, and then painted. The owner, who made himself visible, has other elements carved so it's probably a hobby, or just an artist. It is open country, "East Hill", in the city of Wirt (NY). This statue has a commercial vocation, and that's a shame because in many ways, it is a true work of art. Probably one of the most successful in the genre. 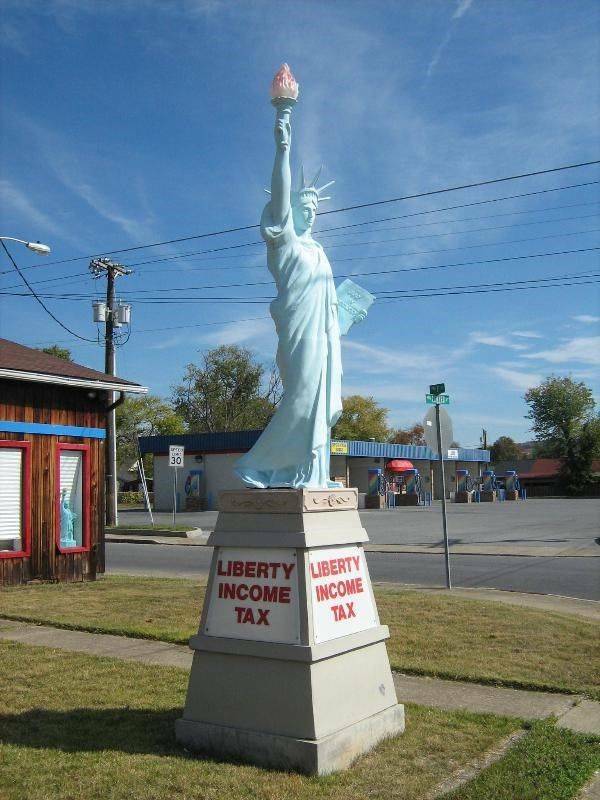 It lies along the road at the Liberty Tax Service. We are here on a very thin replica, the franc draped at the precise face, sharp detail. 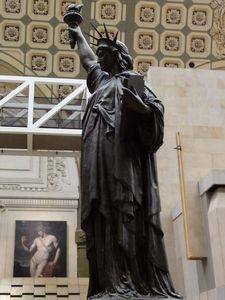 Each element of the statue has been carefully reproduced, including the torch which is usually ignored, and the broken chains of slavery, at her feet. 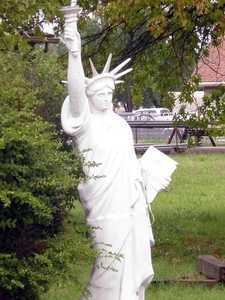 This reproduction is also one of the few to have a perfectly faithful stand to that of Miss Liberty in New York. The details are very precise, everything has been reproduced as a maquetiste would. 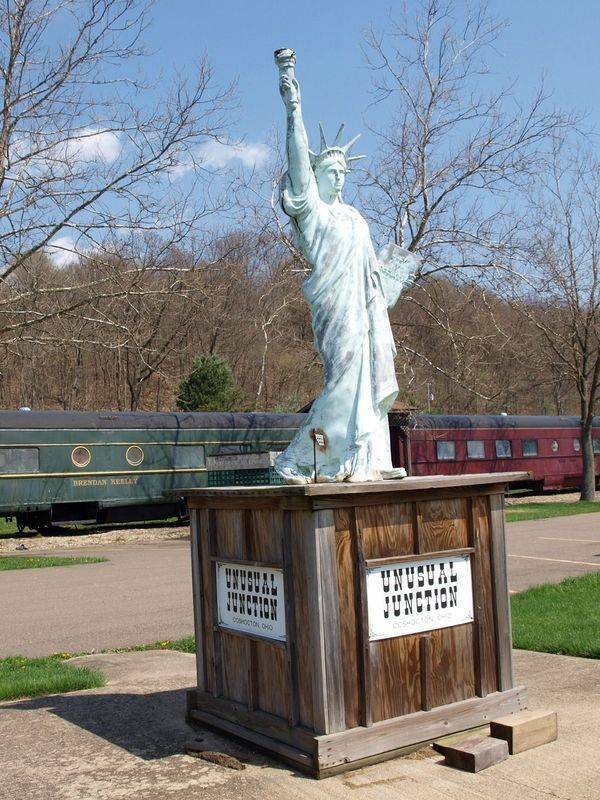 This is a very nice surprise awaits visitors in the city of Leavittsburg (Ohio), along the main track. Unusual Junction is located low density housing instead of in Coshocton County, Ohio. 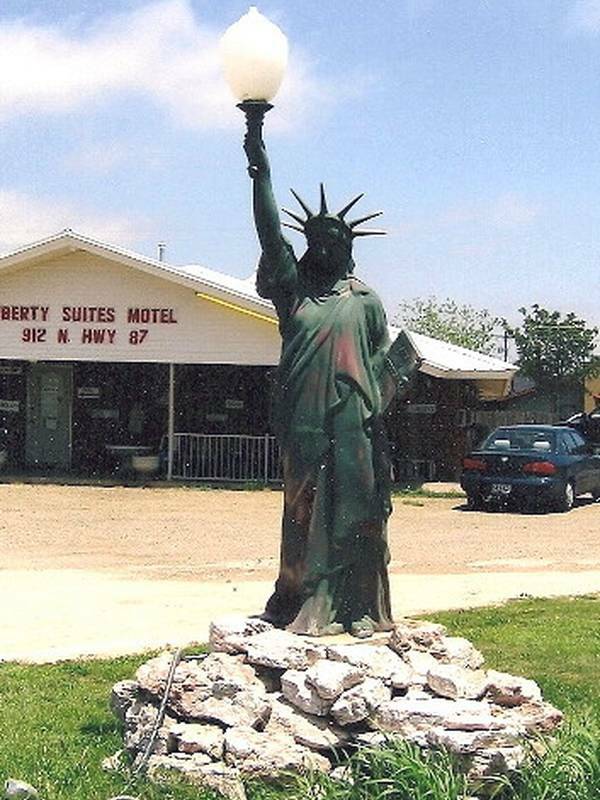 This replica of the Statue of Liberty is located along US Route 36 (east of Hwy 93), in front of the parking lot of Unusual Junction. It is quite resemblance with a pale green color. The torch she holds simpler. Its pedestal is a wooden box, which makes it quite original. This text tells us that it is a memorial of the Second World War. 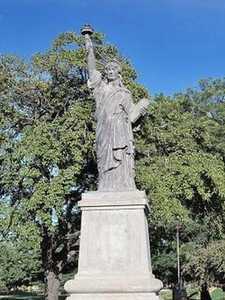 This statue stands in Kirtland Park in Lake Erie. It is along I-90. It is pretty sad state, she could use a renovation. Her right hand while missing her right arm had to be attached. This small replica of the statue looks like those that have been implemented everywhere in the US during the campaign scouts in 1950, but is smaller, it measures only 5 feet tall. 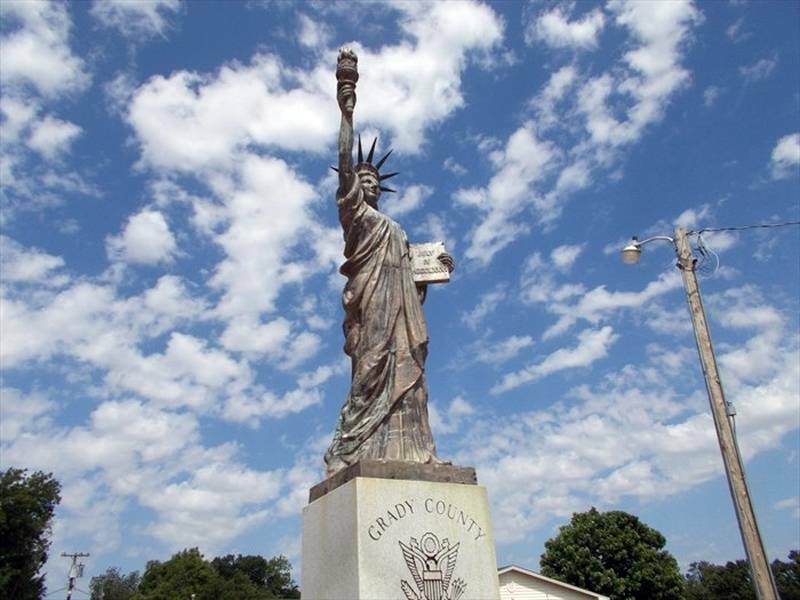 It is located in Oklahoma, County Grady Chickasha. 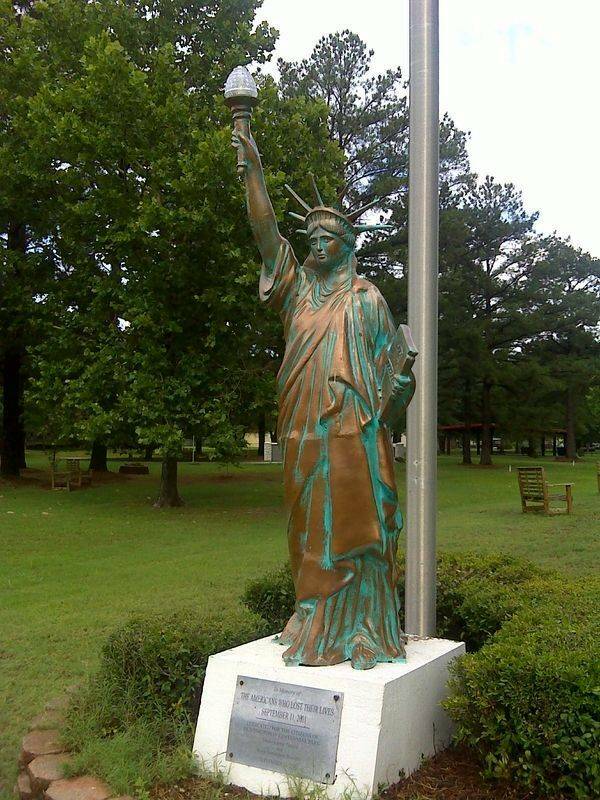 Exactly, it is in Shannon Springs Park, at the Veterans Memorial in the city. 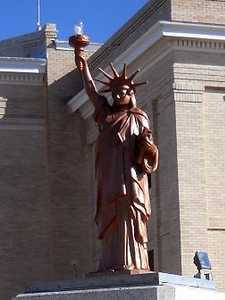 This statue is intended to decorate the front of the Purcell Mall, downtown. It lies on the pavement outside a busy storefront that was once a bank. It has the characteristic to hold at arm a huge bulb and especially to have a golden color, instead of the traditional green. The exact address is 201 West Main Street. 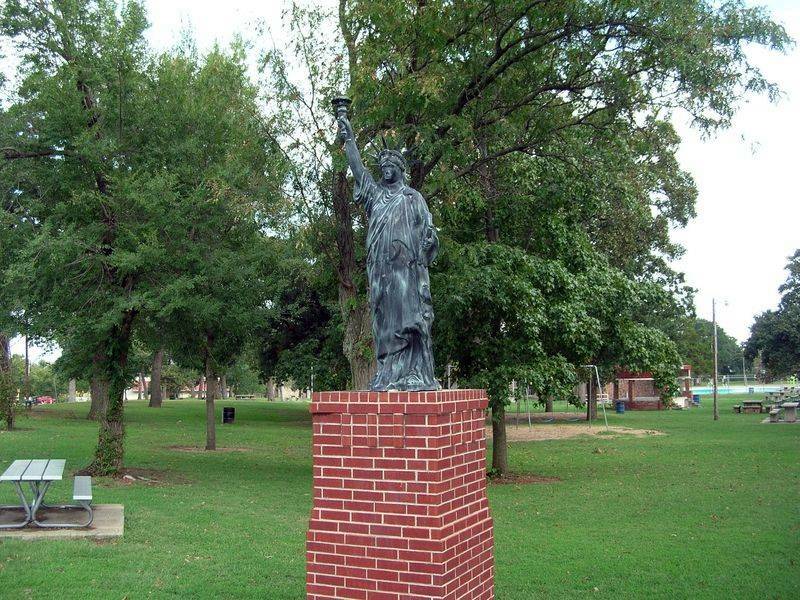 This statue is in Oklahoma, in the "Woodland Veterans Park" in the city of Shawnee. This park is located north of downtown. 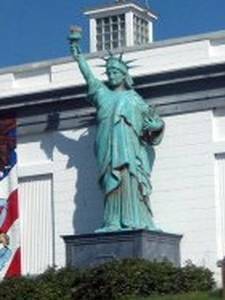 The statue is bronze, when this photo was taken she was already oxidize. It measures approximately 1.50m without arm raised and throne on a rectangular pedestal pretty red brick, but unexpected for such a monument. The statue itself, we can say that it is quite well done, with folds of specific toga. 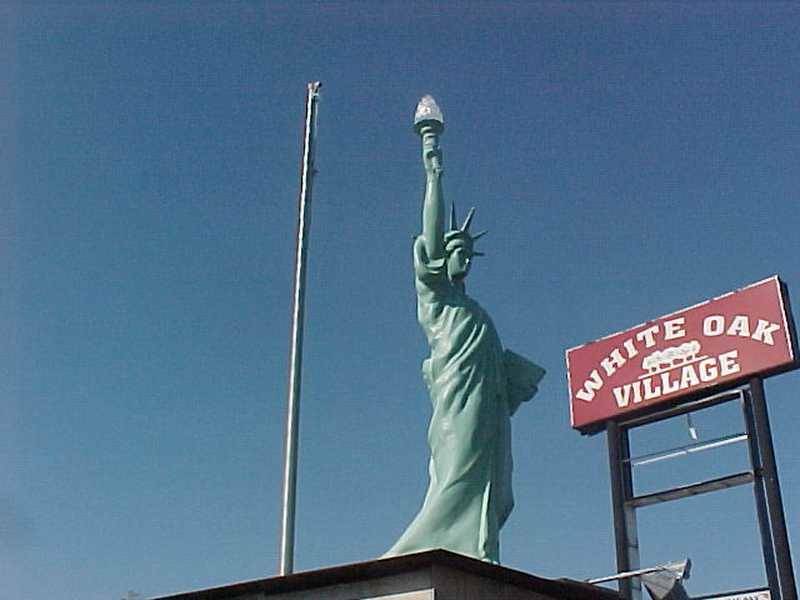 Yukon is here that the visitor can find this replica pristine white of the statue of Liberty. It is in front of a home along Highway 66 on the north side, east of I-40 entrance from Highway 81. 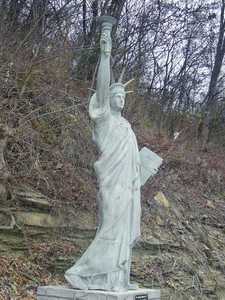 This copy is approximately 7 feet tall, around it there has some other statues, all in the vegetation. 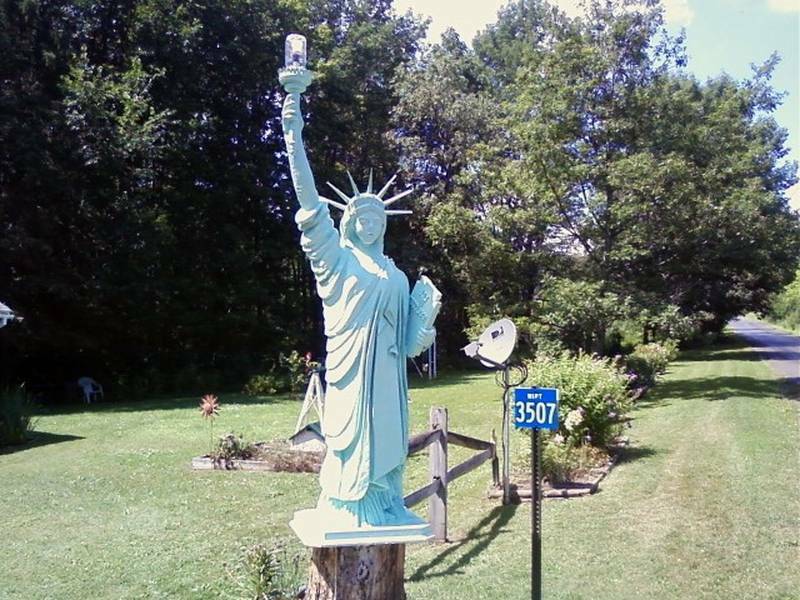 This copy of the Statue of Liberty has an advertising purpose, it serves as teaching at Mill House Bed and Breakfast which she adorns the entrance. It measures 6 feet tall and is perched on a pedestal of 3 feet. This pedestal is very successful, far more than the copy itself whose manufacture is correct, but that is hardly consistent with the original statue. This takes its tablet too horizontal and its crown too small roayons, giving it the air air thorns on her head. Moreover her outstretched arm is especially long. The Petersen gardens are gardens created from scratch by Rodolph Petersen, a Danish architect. It worked in 1935. On one of these platforms has been carving a replica of the Statue of Liberty from a rock. Of course, this statue represents more a technical challenge that accuracy in the reproduction of an original work. Rodolph Petersen was born in Denmark on July 21, 1883. He came to Oregon in 1906 where he built a house, launched in agriculture, and gradually acquired land until reaching 300 hectares. In 1935, he began to devote time to her garden, he developed exponentially. Although passed in 1952 the garden still belongs to the family that maintains and it added a small museum. This is in Elysburg has built an amusement park, "Knoebels Amusement Resort". Inside, on the west side is the copy of the statue that has other vocations than offering visitors original photo. It measures approximately 2.50m tall and its base is probably one of those closest to the base Morris Hunt, true. 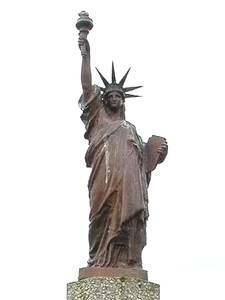 It must be said that it is rare that replicas of the Statue of Liberty is a consistent stand, most of the time it is simple. This replica has a commercial vocation, it is a small statue that was placed on the terrace of a popular restaurant north of Pittsburgh. It was formally set up as a memorial to 11 September. Given that distinguishes little, it is difficult to get an idea of the accuracy of the reproduction. It seems to still have the arm too bent, too straight, too. If you take the 322 Harrisburg route to State College, you will pass near the Susquehanna River in a section called Dauphin Narrows. 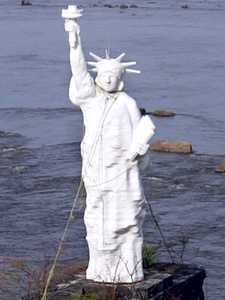 There, in the river stands a replica white, brilliant, the Statue of Liberty, proudly standing on a stack of old stone bridge. 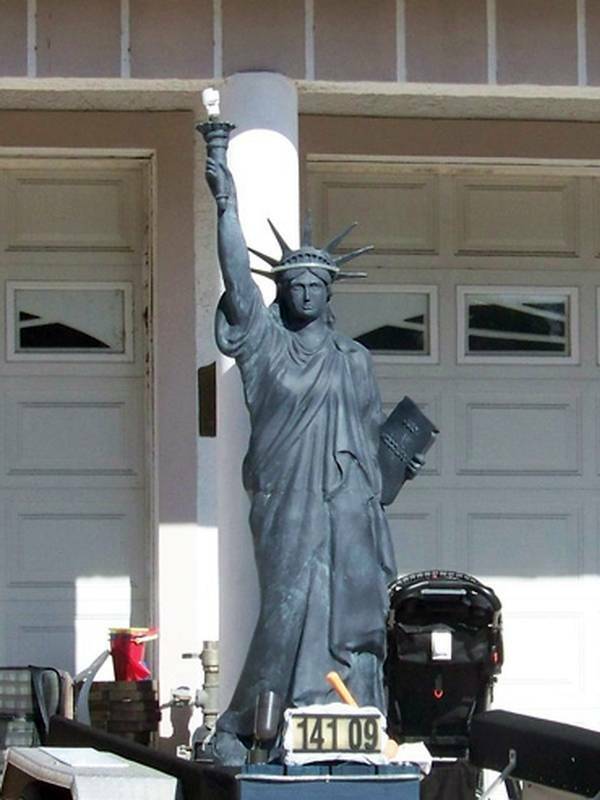 Do not take it: Though "Dolphin Lady Liberty" appears tiny, it's still 25 feet high and is very robust. 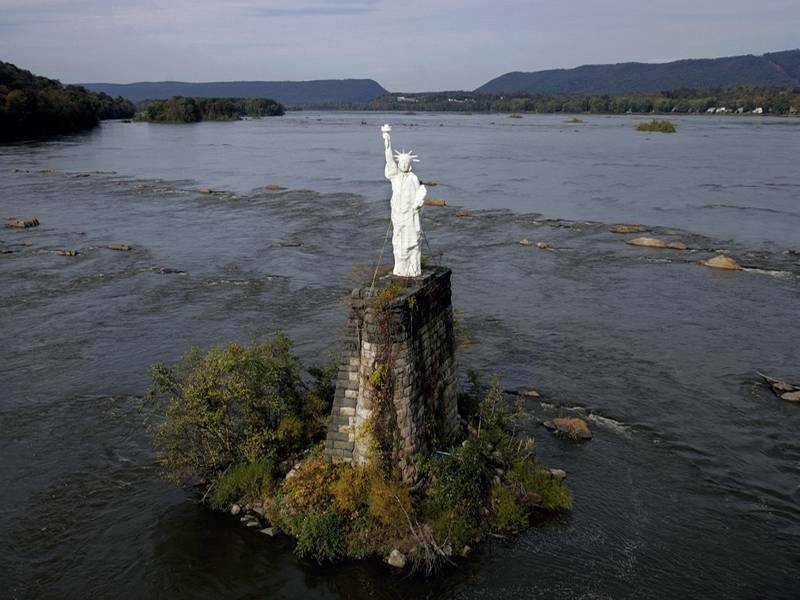 This is the second replica of the Statue of Liberty standing in the troubled waters of a river. The author is George Stilp, a well known figure in Pennsylvania for her political activism. The original statue he built in 1980, measured 18 feet and was made from ... Venetian blinds! 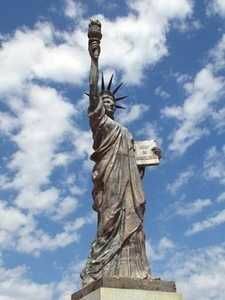 A few years later, the statue had a serious need of repair due to successive storms. Stilp and her group of volunteers got down to reconstruction, this time using more robust materials. Incidentally, they have expanded to its current size of 25 feet. But they did not change its location, always original. Very nice statue in a park. She has a very frank drape. 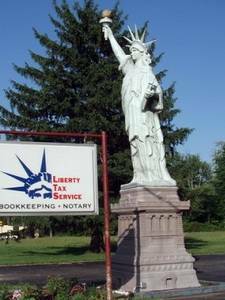 This copy of the Statue of Liberty is advertising sign at a firm specializing in taxes. 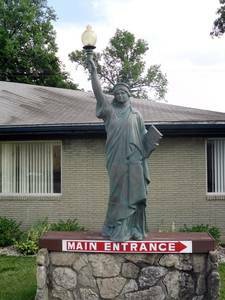 This office is located in 2320 East Center Street and the statue is on the lawn, just ahead. It is perched on a high pedestal in the shape of a truncated pyramid. 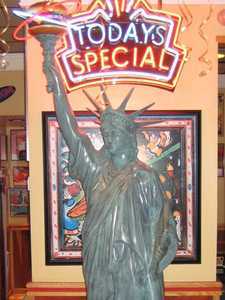 There is nothing special to say about the actual statue, it is what it should be, a simple promotional large. A smaller is behind the windows in the offices of the firm. The City of Johnson City, Tennessee, is home to the offices of the company Traco. The company was chosen by the financiers of the renovation campaign of the Statue of Liberty in 1986 to restore the quality of the field of vision, ie to provide the 25 windows in the crown. As such this copy, probably made in any polymer, has been installed on the parking lot. 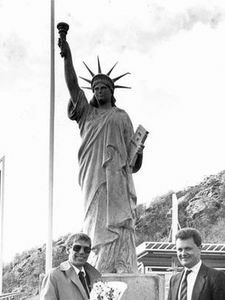 A plaque recalls this episode of corporate life, "TRACO Restores Lady Liberty's Crown July 1986 As pard of the $ 30 million torch-to-toe restoration project, TRACO Manufactured and installed 25 custom windows in Lady Liberty's crown." 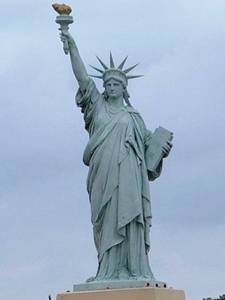 This which means "TRACO has restored the crown of Lady Liberty in July 1986 within the project of 30 million dollars for its restoration of the feet to the crown. 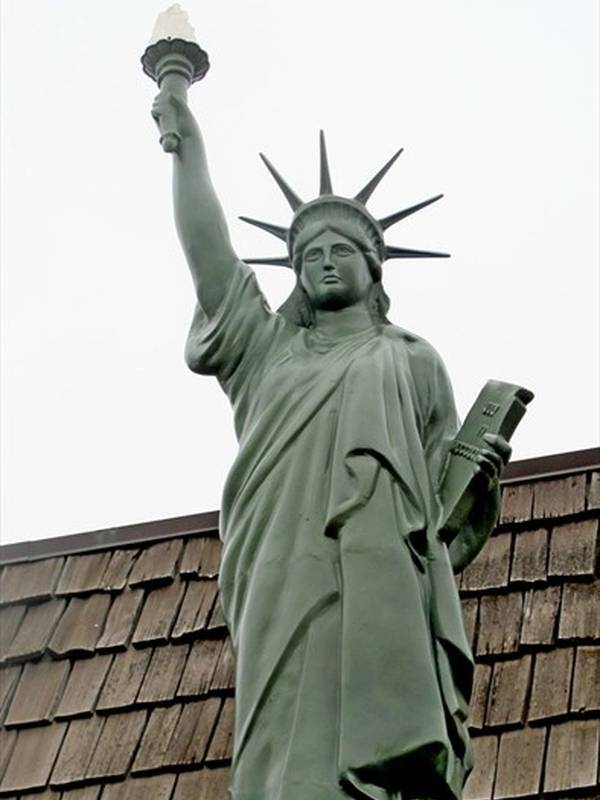 TRACO has manufactured and supplied the 25 windows in the crown of Lady Liberty." 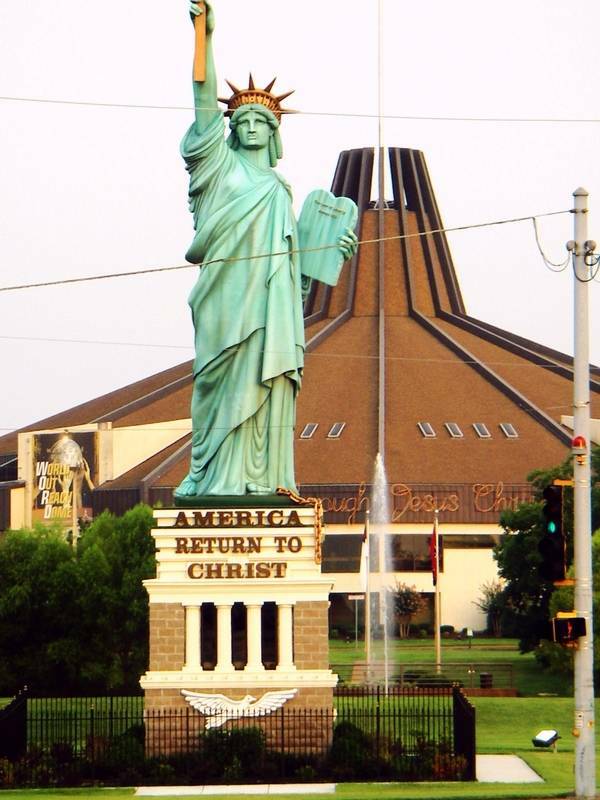 It was at Memphis that the visitor can cross this very imposing statue of Liberty holding a cross instead of the usual torch. 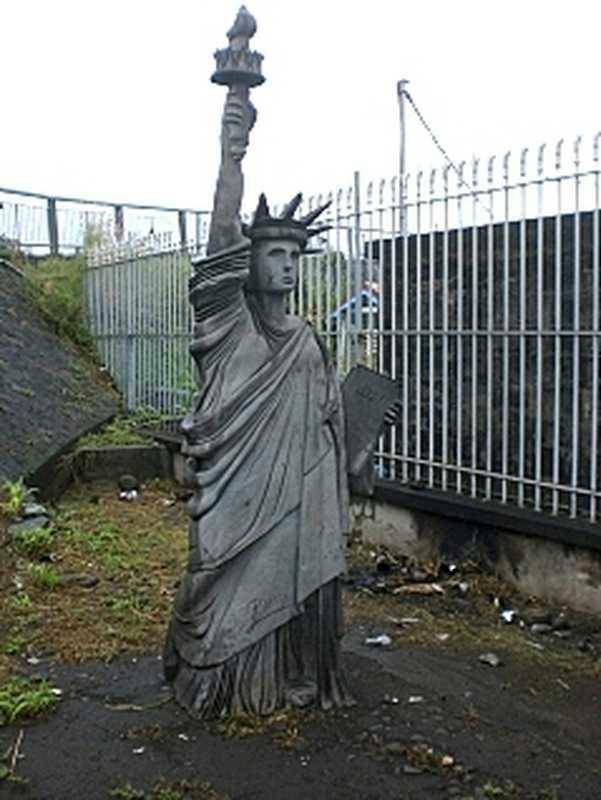 Nothing to it, we guess that the symbol of Liberty was hijacked for religious purposes, and that's what happened. It was built as an emblem of the church "World Overcomers Outreach Ministries Church", funded by 12,000 members who have paid for $ 250,000 donation for its construction. It was erected July 4, 2006, the day of the anniversary of American independence and contains other religious symbols as the cross she holds in her hand. The crown is marked with the word "Jehovah" and the tablet is written "ten commandment". It is located in the park in front the church in 6655, Winchester Road, Memphis (Tennessee). It was built on a metal frame fiberglass, filled with expanding foam. 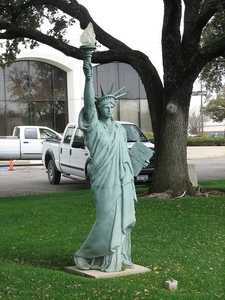 In Dallas, the statue is located in Fair Park. There is nothing special to say about it, except that it is a rather surprising brown, probably due to her material that I have not identified. She landed on a relatively small base. 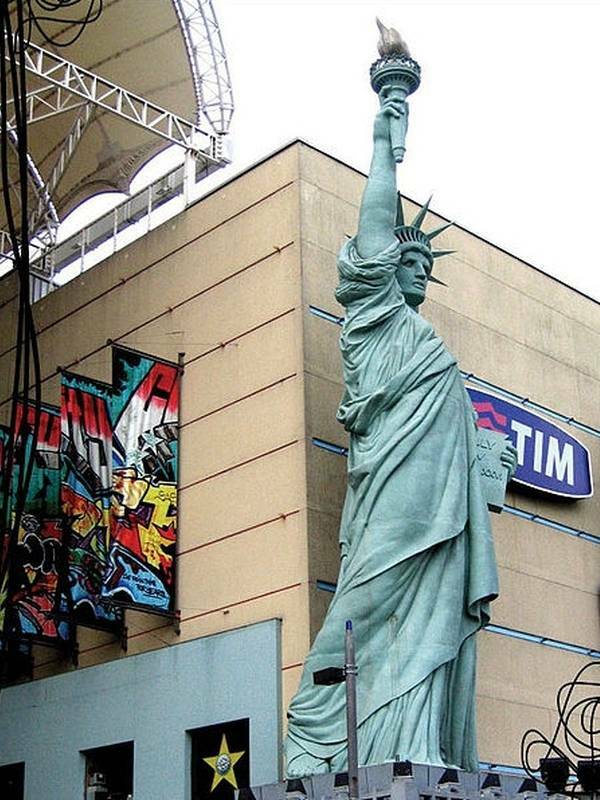 Unfortunately for her, this photo was taken on a day when the statue was fouled. Beautiful statue as this, it serves fixture on the lawn of the Liberty Bank of Norh Richland Hills, a city in Texas. The bank is located at the intersection of Highway 26 and Vance. Laid on the ground on a concrete slab, which is terribly rare, it is approximately 3m from the ground at the end of the luminaire. Its proportions are quite correct, it just lacks accuracy in the reproduction of the folds of the gown. It takes the tablet a bit low too. This Texan replica of the Statue of Liberty is in Forney, along a road between Broad Street (FM 688) and US 80, approaching the downtown Forney, Texas. It is a fairly simple pedestal, pyramid, concrete covered with stone. The statue itself is a green uniform and fairly well approximates the original statue. 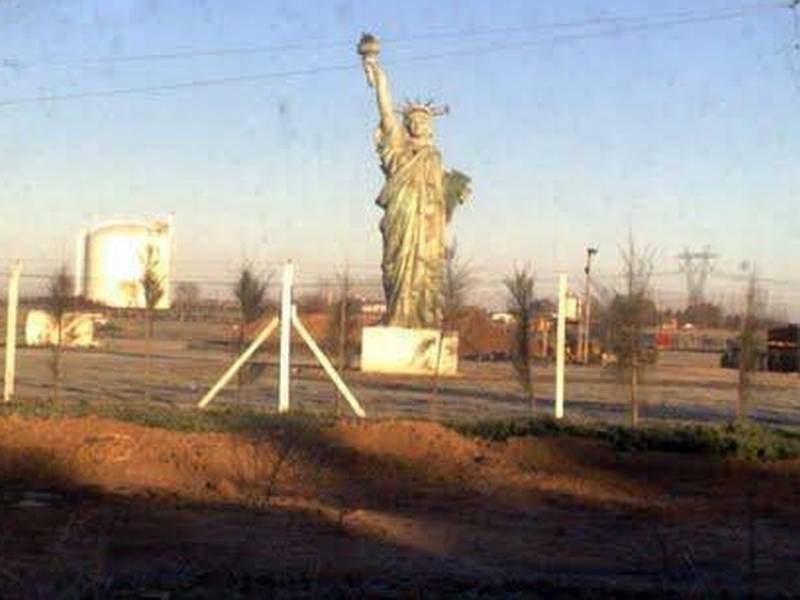 A Huntington, Texas, the visitor can see the Statue of Liberty dedicated to the citizens of the city in memory of Americans died in the attacks of 11 September 2002. It is in the park September 11, one of the parks of the city. 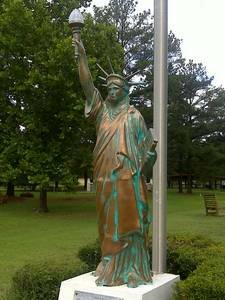 This statue is interesting because it is copper, copper is oxidized, but as it is at ground level, without pedestal, visitors can touch, which remove oxidation. By reflex visitors do affect superficially, the recessed regions thus remained oxidized and it is why today it is two-tone. 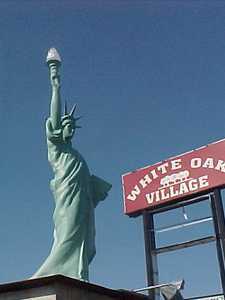 The Statue of Liberty is on public space in front of a motel on River Oaks Boulevard, in the City of River Oaks (Texas). It is black in color, which is rare, but is not very faithful to the original: It has little chest (which is also rare), the crown of rays are badly drawn, and especially its face is slightly recognizable. 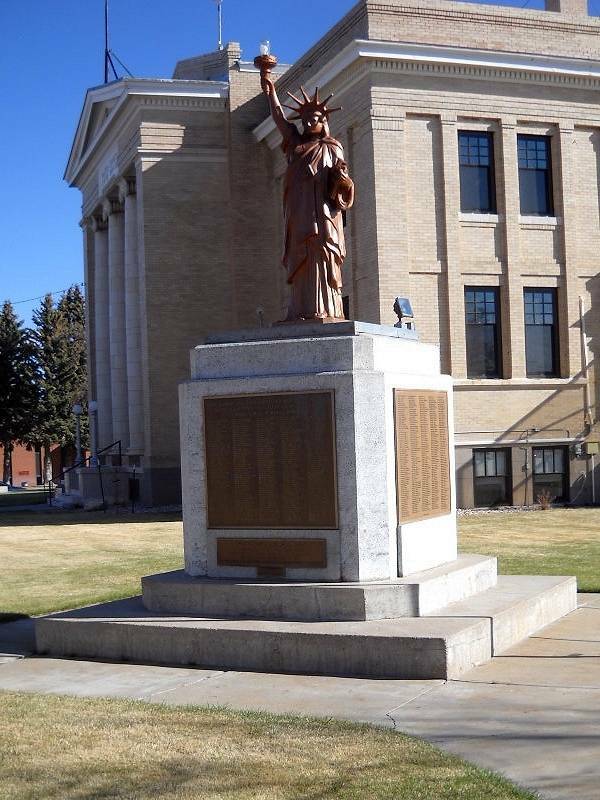 By cons, its base is entirely consistent with the statue, well decorated without being too busy. Statue located in height, before bowling. 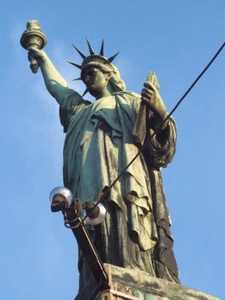 Sacrilege, instead of lifting the traditional torch she holds a bowling pin in hand! It is located in East State Street, up to the 140th Street South in the city of American Fork (Utah). 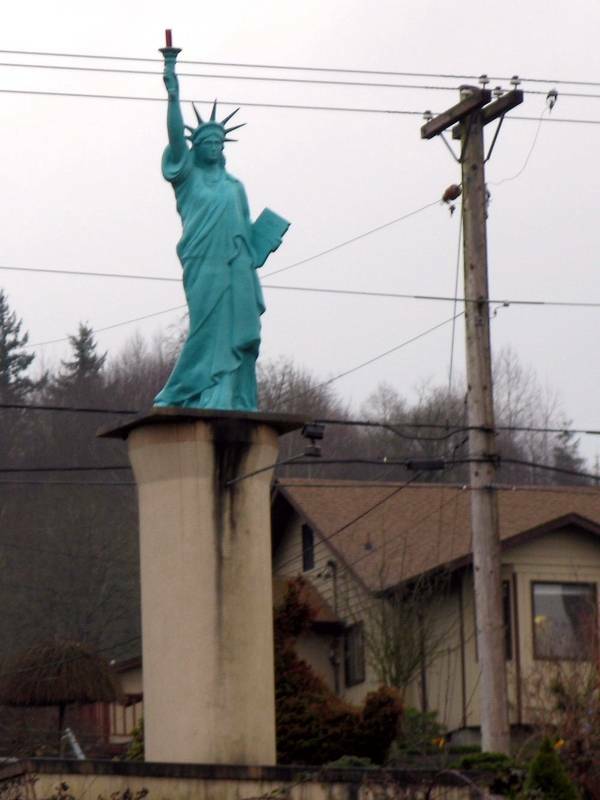 That curious statue of the city of Carrolls in Washington State. It is located along the "Old Pacific Highway" (Pacific Highway), it is visible at the I-5. Carrolls is located along the "Interstate 5" (the highway that runs through several states). 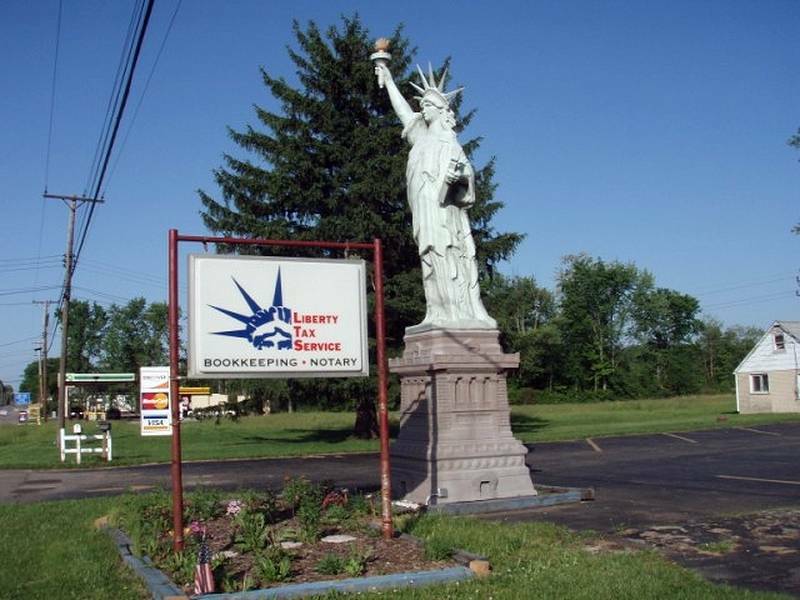 It is quite surprising to meet the eyes of Miss Liberty as far from New York, has an unexpected time, in full highway driving. Therefore it is difficult to have good quality pictures. To be more in height, this statue, nearly 4m high, is about a disproportionate pedestal ordinary cuboid attacked by weather and pollution. In Washington State is the city of Hoquiam, who owns Simpson Street (Simpson street). This is where you will find a home with the statue in the garden. Originally the statue was in a shopping center and served advertising sign, but the sign itself has been removed, so that you do not know today what it actually served. This statue has the distinction of having the crown and golden hair. 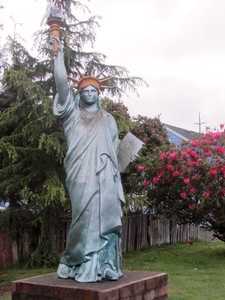 There are some statues of Liberty in the State of Washington, USA. It is quite simple, it is in Point Roberts, a city along the Gulf Road. It is located in downtown, in an official building park. It is perched on a vaguely decorated concrete pedestal. The statue itself appears to be fiberglass, a material that does not allow great details. This is the case of the folds of the gown, which remains here pretty simple, slightly marked. 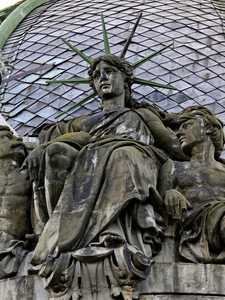 Her face is a little small and the crown lacks the traditional windows that there is on the original statue. Similarly these rays are too far apart. 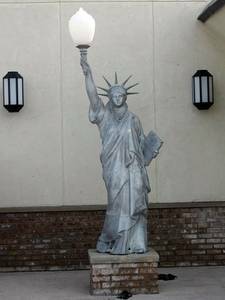 And of course, it takes a lamp instead of the torch, but now impossible to be difficult: three quarters statues serve as public lighting! 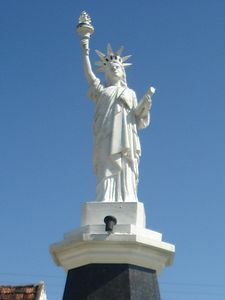 Statue facing the bay of the city. Again it is particularly successful, but can we not expect less from Americans people? This statue is on the beachfront, in a place especially passing. 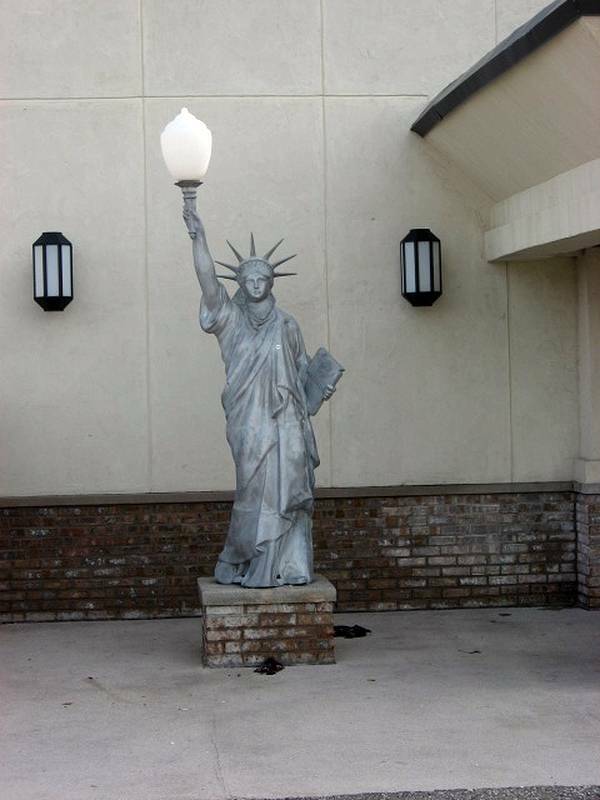 This is a small gray-black replica entirely consistent, if not the torch, replaced by a large bulb. Note that the base is very successful, both in its appearance than proportionality. Matewan is a small town along a National and a river whose current is controlled by a huge dam. 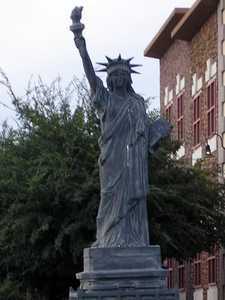 The statue is located on Main Street. The plate is put above reads "Liberty Tax Service"
In the Wyoming is a replica of the Statue of Liberty in the town of Wheatland. 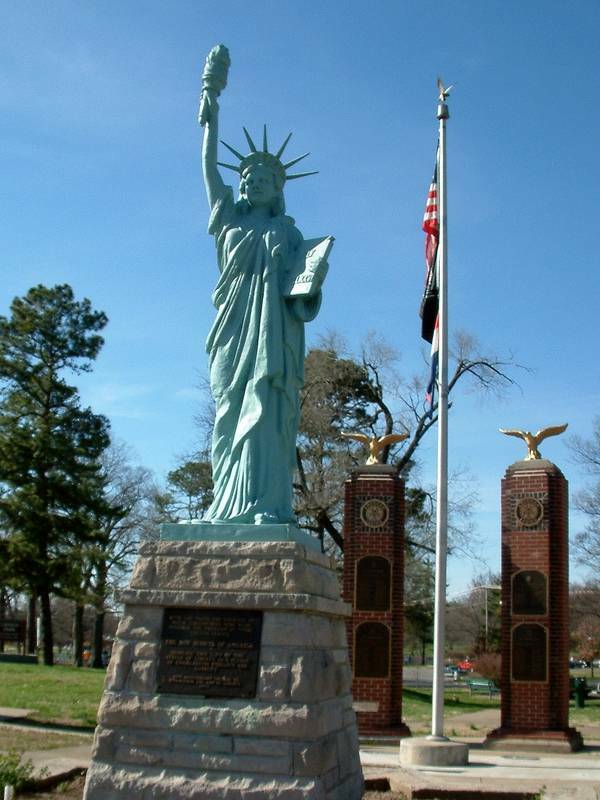 It commemorates the veterans in the 2nd World War Platte County. It is also in front of the "Platte County Court house", the equivalent of our hotels department. 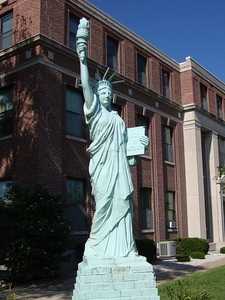 This statue was set up in 1943 and was restored in 1966. It overcomes a heavy cubic pedestal on the sides of which are engraved the names of deceased County during the war. The list is quite long, unfortunately. Once purely advertising statue. It measures 6 feet tall and is located at the corner of Walnut Street and Ashland Avenue, in front of the restaurant "Blackstone Family", in Green Bay, Wisconsin. It is quite unsuccessful it must be said, the mold that was used for the manufactured was probably not very worked. It is based on a cement block making base office, painted in American colors: White, Red and Blue. Wisconsin is the city of Neenah. 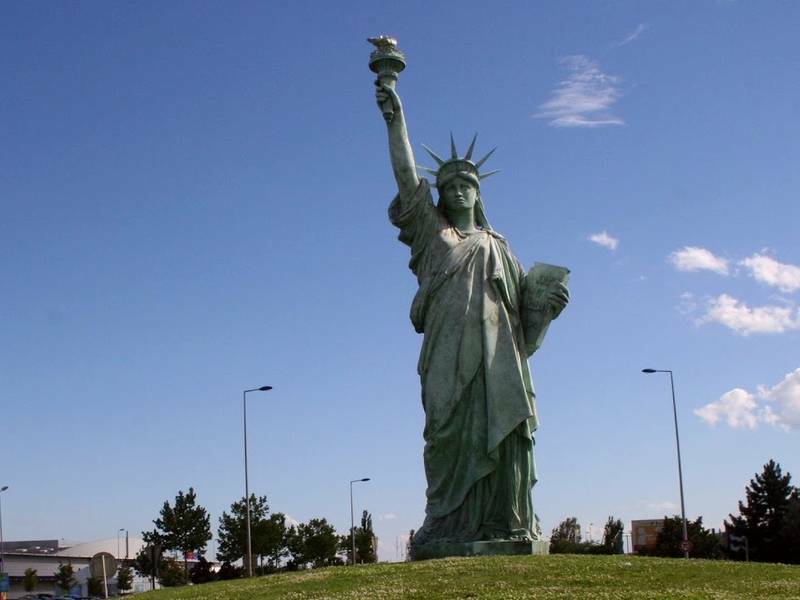 At the center of this city the visitor can find a replica of the Statue of Liberty 14 feet 6 inches tall, or 10% of the stack size of the original. 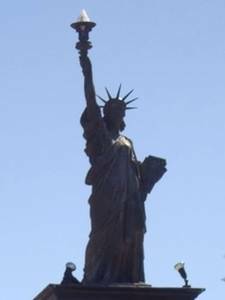 It is made of bronze and was cast by the California "Great American Bronze Works". This is a gift to the community of man John Bergstrom case. It is based on a very pretty massive stone plinth. 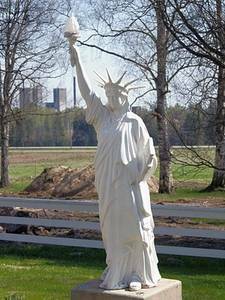 This reproduction of the Statue of Liberty in the dazzling white is in the village of Koskekorva in Western Finland (Ilmajoki). It was in this village that is the factory Jari Mäki Inc. which manufactures equipment for American cars. They also make the service, still in the market for American motorists. This proximity to the New World pushed them to settle in the factory park this replica of a pretty good fidelity. Note, however, the poor performance of the tablet, too bent down, and no broken chains of slavery, which is fairly standard in the reproductions. 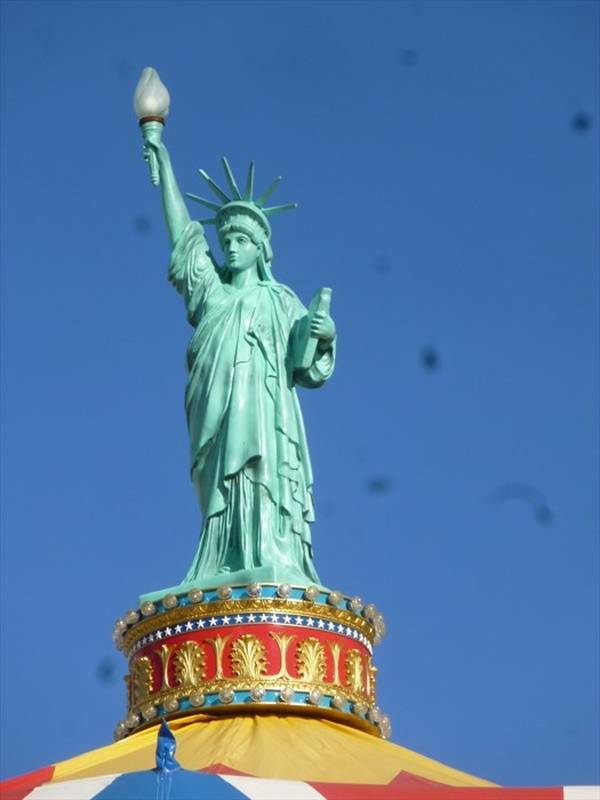 And of course, the bulb replacing the famous torch is one of the glaring errors, but we can not blame them for that. 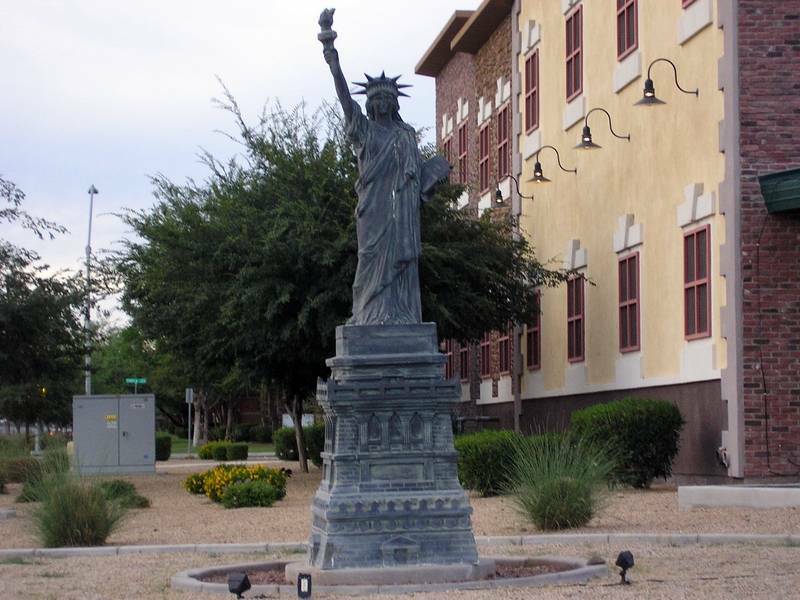 This statue has virtually no pedestal, it is placed on a small concrete pad, simply. 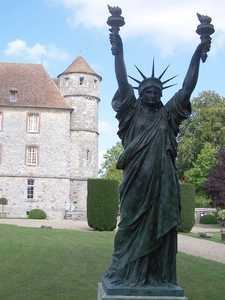 Replica of the statue of Liberty at Barentin (France). 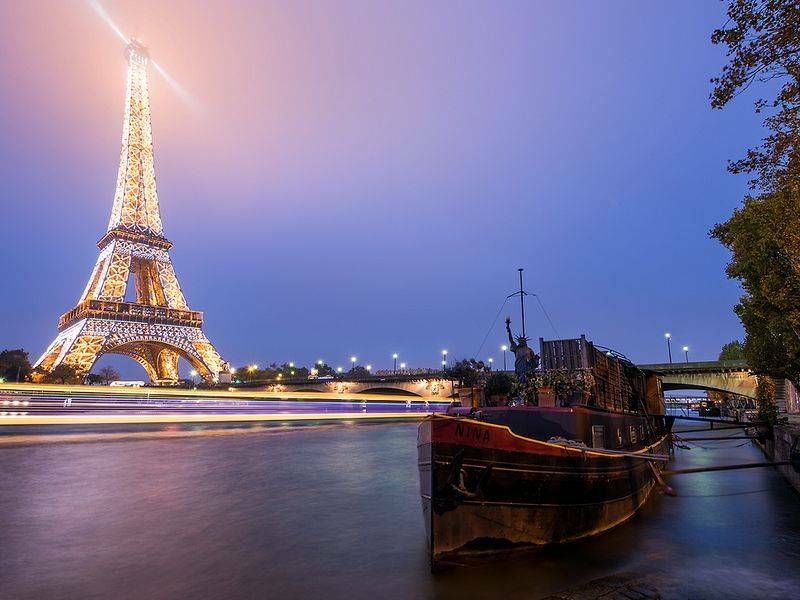 (Seine-Maritime) : The statue is not entirely consistent, it is more skinny than the original. It sits atop a small dirt embankment in the center of a roundabout. It measures no less than 13m50 for a venerable weight of 3.5 tons. It is made of resin. It is this statue that was used in the film "The Brain" by Gérard Oury (1969). At the end of filming she spent some time at customs, because of non payment of customs clearance, and had to be destroyed. The intervention of Gérard Oury and Paul Belmondo, son of John Paul, allowed its recovery. 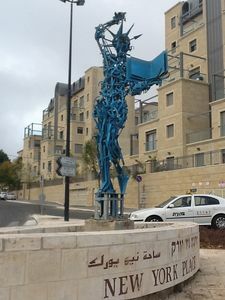 The mayor of Barentin being bias, the statue was installed in the center of the roundabout of the commercial area of the city. Replica of the statue of Liberty at Basse-Terre, Guadeloupe (France). 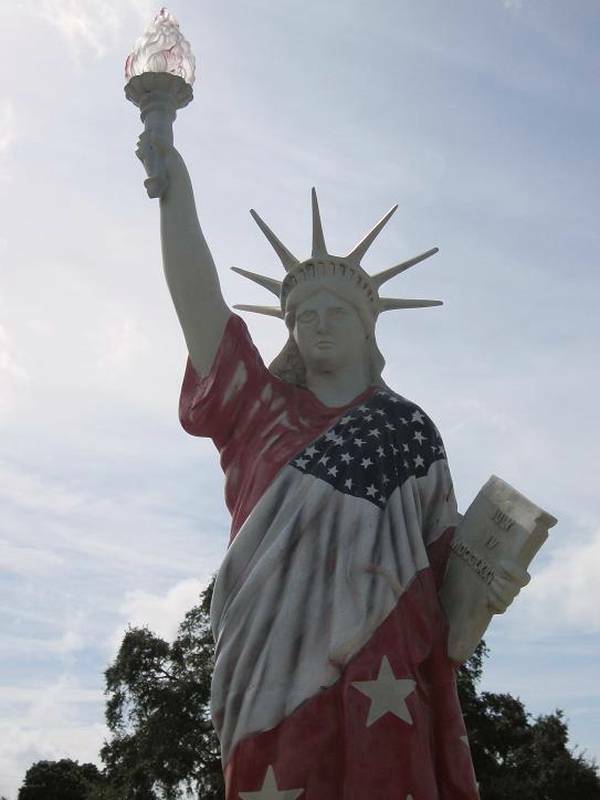 (Guadeloupe) : This copy of the American statue does not comply, it is even quite far from the original statue. It is too wide, too short, too, it looks like it was cut at its base. The folds of her toga do not fall properly and she holds her arms a little too forward. But it was her face that is most missed, we must also say that it is what there is more difficult to reproduce. But there, the resemblance is really unflattering. Additionally the rays of her crown are too thick, too wide. This statue has been challenged recently, she was moved from the Town Hall Square at the port in St Claude, 6Kms further. Especially the way it was done is problematic. Still, it is always visible, in Basse-Terre. 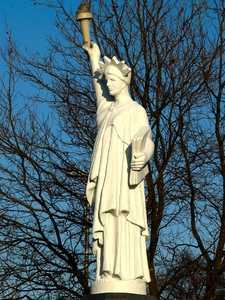 Replica of the statue of Liberty at Blérancourt (France). 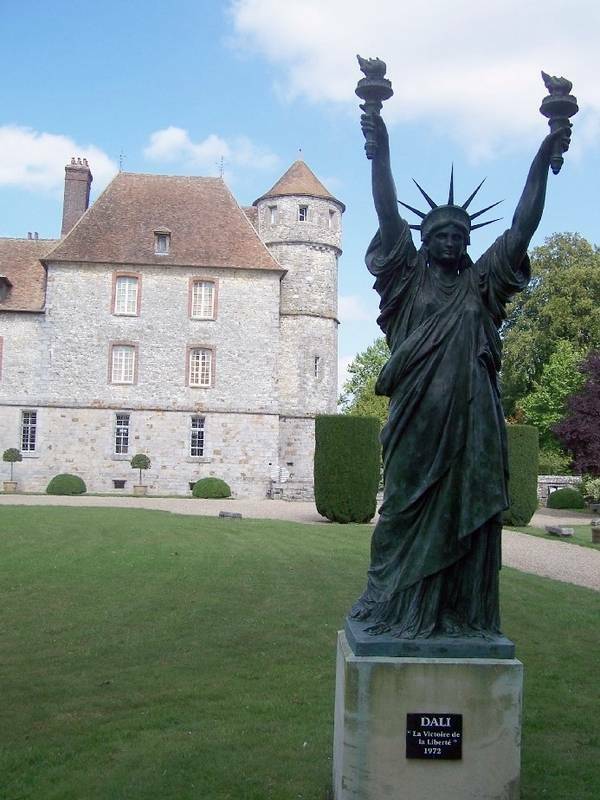 (Aisne) : The Blérancourt museum has a replica of the Statue of Liberty. 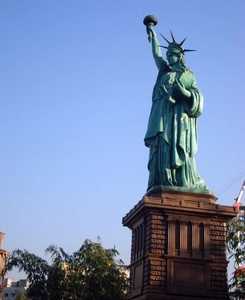 It was probably built by Auguste Bartholdi himself around 1885 ie one year before the official opening of the real statue. It is terracotta. 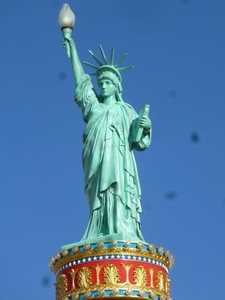 "Remember to Mr Count Saune that transported to America in the name of France the colossal Statue of Liberty. 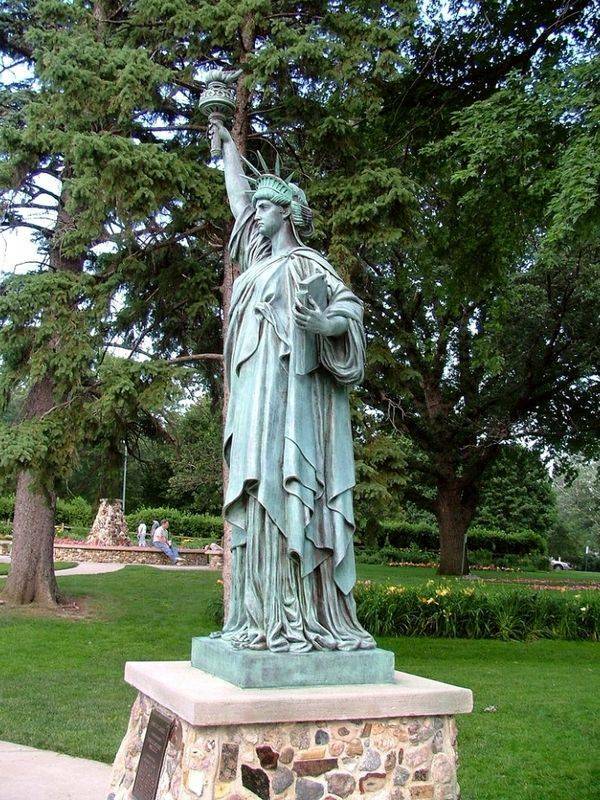 1885"
Replica of the statue of Liberty at Bordeaux (France). 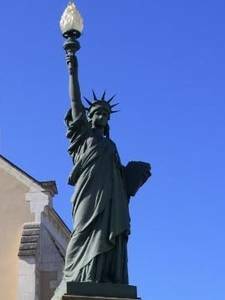 (Gironde) : Located place Picard, this statue was donated by Bartholdi himself in 1888. 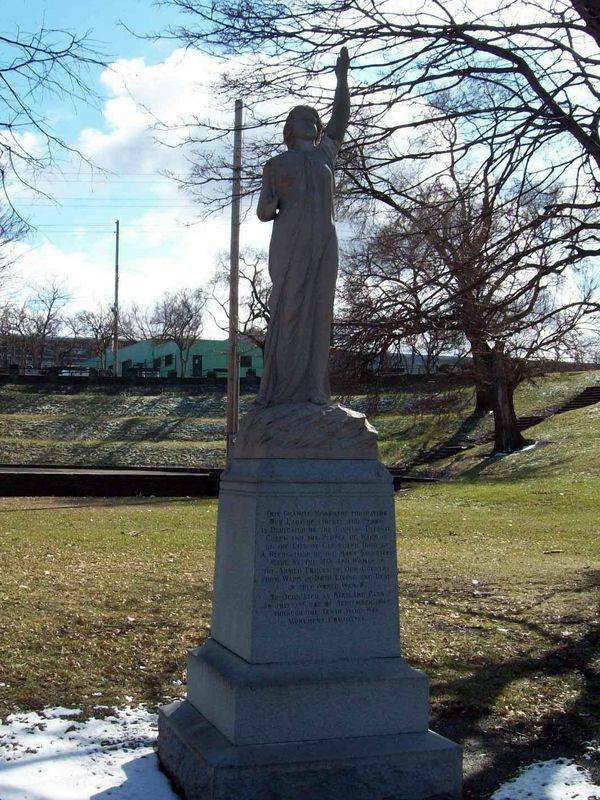 It was inaugurated on April 28, 1888. 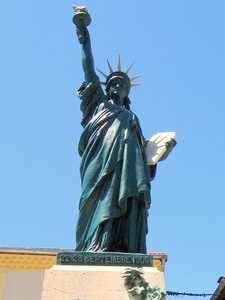 But as it was bronze, it was toppled by the Germans in 1943, just as interested as the metal the removal of this symbol of freedom. In 2000 a smaller copy was installed in her place, copy itself replaced by another, resin, recently. 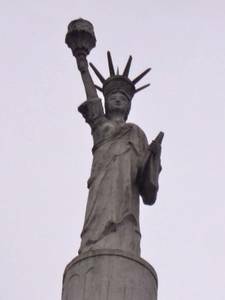 You should know that the gift to the city of Bartholdi was done following the abandonment of the project to install a fountain in the hemicycle of staggered rows. Although it won first prize for the project cost exceeded the budget allocated and the work was never realized. 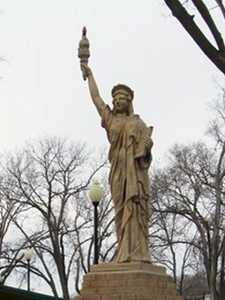 In compensation Bartholdi offered the city a replica of the statue, inaugurated two years ago in New York. Anecdotally, this statue served as support for some time in a jokester artist who, at night, dressed so interpeler passersby. Thus was she covered with a holding housewife, a burqa, dressed in Guantanamo prisoner, a victim of traffic accidents, etc. 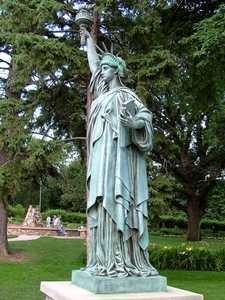 Replica of the statue of Liberty at Cambrin (France). 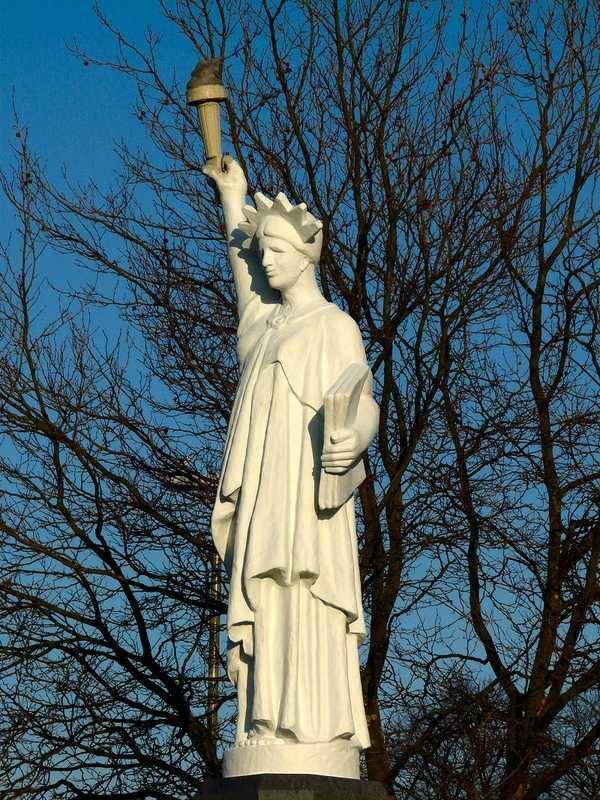 (Pas-de-Calais) : This statue is 2 meters 90 550 kg was erected in 1925 in memory of the 26 children of dead country for France. 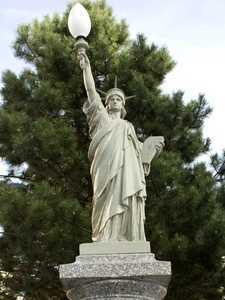 Replica of the statue of Liberty at Cessenon (France). 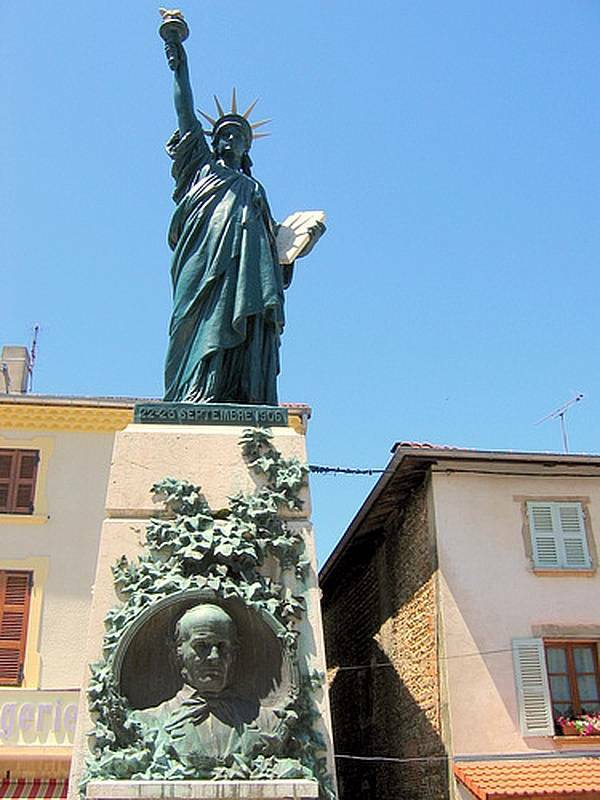 (Hérault) : This statue is a resin molding produced by the Museum of Colmar. 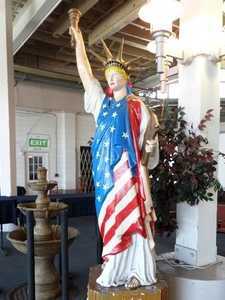 It served as a figurehead cruise ship "Maxim's sea" during transportation of European and American personalities between the two countries on the occasion of the centenary of the inauguration of the Statue of Liberty (1986) Once cruises completed the statue was stored in a hangar Nice and the company tried to sell it without success. The commander of the ship then proposed to recover it, which was done, and brought it back home at his own expense, in the hamlet of Lugné. He yielded few square meters of land and the city offered a pedestal, pillar of old bridge over the Orb. Since the statue stands at the entrance of the hamlet. Note that it is very slightly damaged, it lacks the shelves. 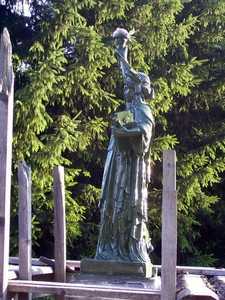 Replica of the statue of Liberty at Châteauneuf-la-Forêt (France). 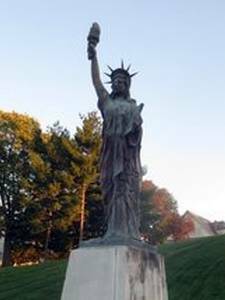 (Haute-Vienne) : Another statue of liberty, which serves war memorial. Note the very large lamp she holds, which distorts a little. 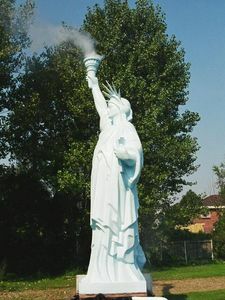 Replica of the statue of Liberty at Cléguerec (France). 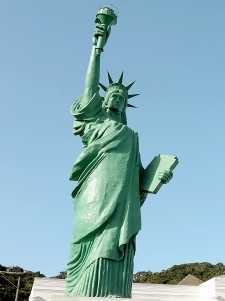 (Morbihan) : The statue was cast in 1875 by the Avoiron molding, ie 11 years before the opening of the original statue New Yorker. Opened September 24, 1882 by the Prefect of Morbihan, this monument was erected in memory of Joseph Pobéguin sergeant, a member of the Flatters mission to open new channels through the Sahara. 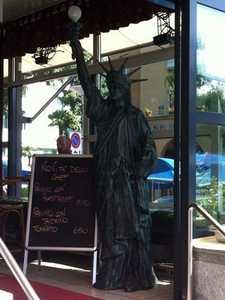 Replica of the statue of Liberty at Colmar (France). 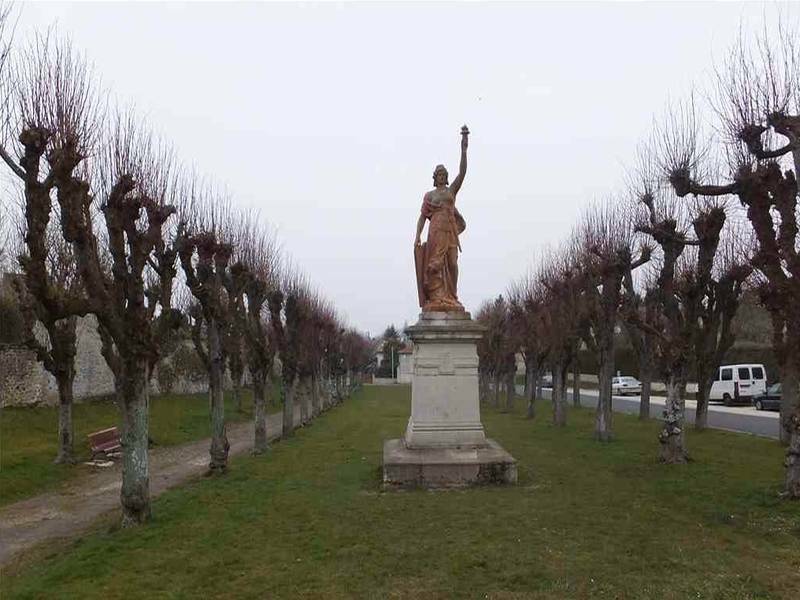 (Haut-Rhin) : The birthplace of Bartholdi wanted to have its own course replica. It is located at the northern entrance of the city. This is a true copy, scale close of course. It is made of a composite material dyed in the mass, to give it the appearance oxidized copper. 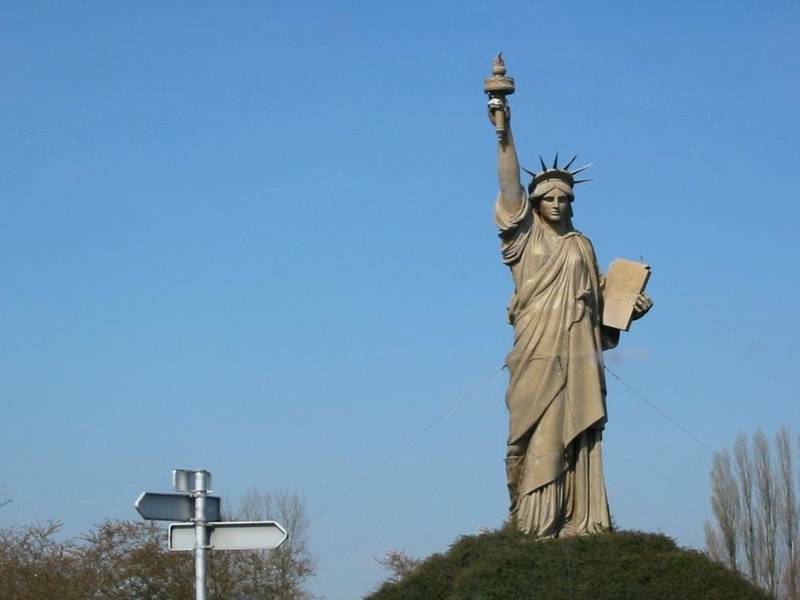 It measures 12 meters high, is one of the largest in France. 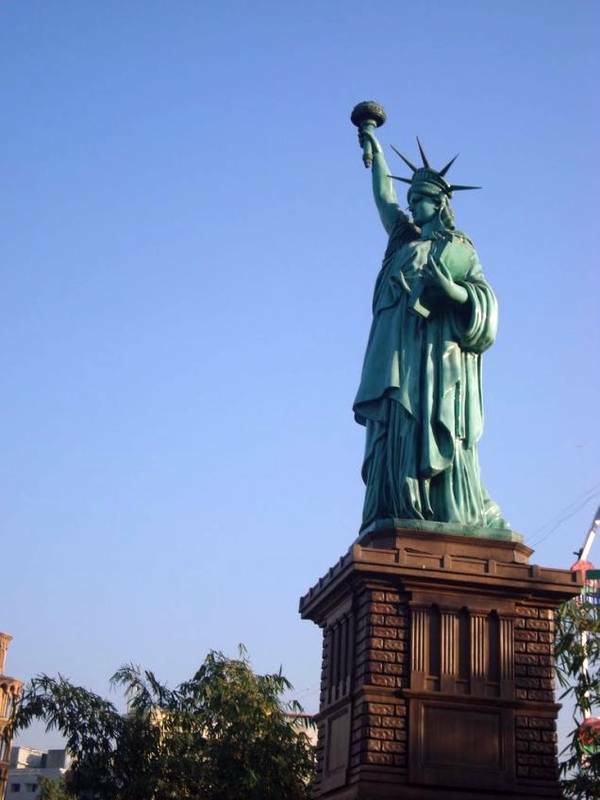 It was installed in 2004 to mark the centenary of the death of Auguste Bartholdi in 1904. 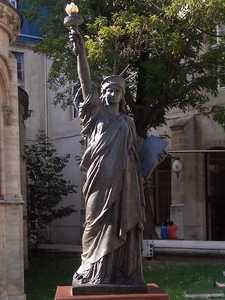 Replica of the statue of Liberty at Dijon (France). 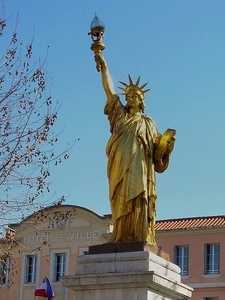 (Côte d'or) : The city of Dijon also has a statue of Liberty. 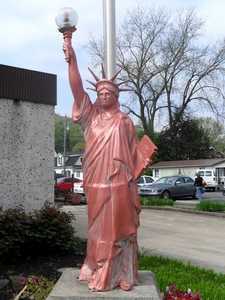 It is 1m35 tall, and is bronze in color. 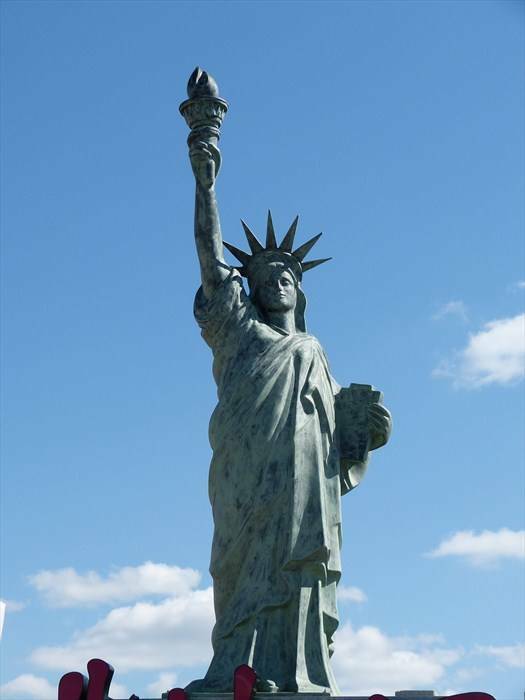 It was manufactured by Auguste Bartholdi himself. She was the trophy of a cycling event of ... 1912! Retrieved in the clubhouse, the statue was later stored in these premises, then found by the janitor in 1944, after the departure of the Germans. The concierge put it on a piece of the city for a day. 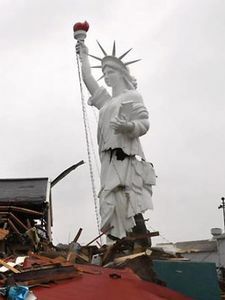 Some pictures were taken, then the statue reinstated the attic. These photos recently found her trace, and she was found again in the same place, many years after being stored there. 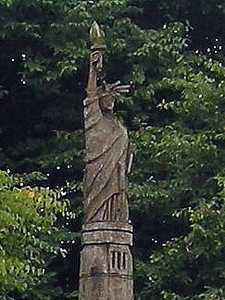 Replica of the statue of Liberty at Gourin (France). 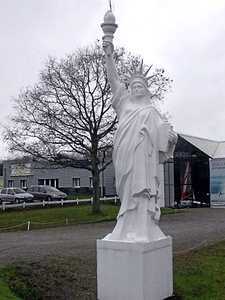 (Morbihan) : This statue of immaculate whiteness is a testament to the exodus of Gourinois to the United States. Indeed, a very large part of the population of the city migrated to their new country of adoption, and the city was a place of passage for voluntary departure. On behalf of 6-7000 people who left the territory from Gourin. This replica was offered to "Transamerica Britain" in 1990 by Air France, to thank the many emigrants who traveled overseas with the Air France office in Roudouallec installed until 1985. 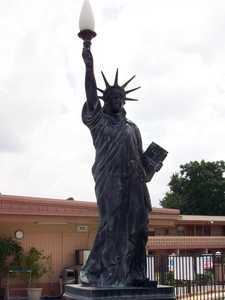 This statue is more a symbol immigration that freedom. 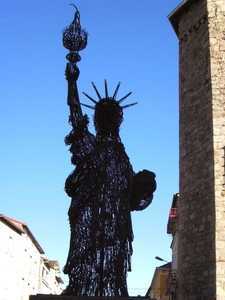 Replica of the statue of Liberty at Jaujac (France). 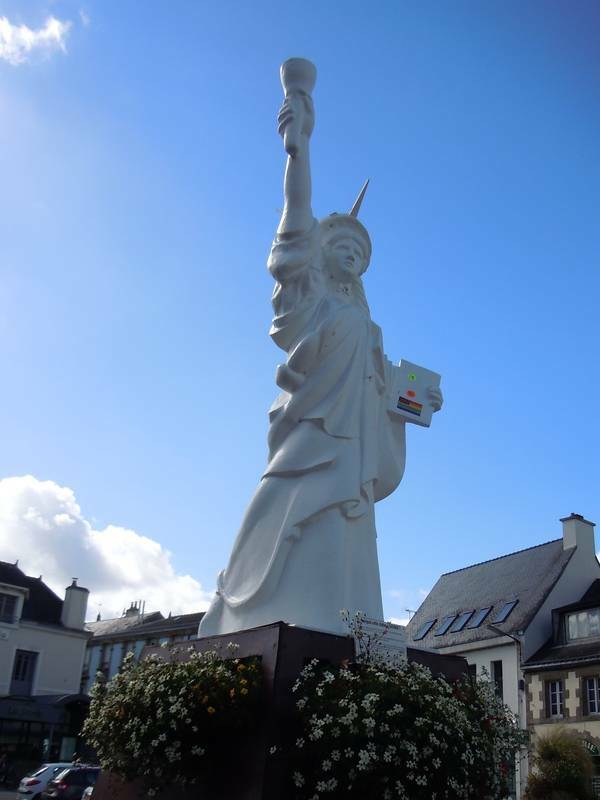 (Ardèche) : This statue is also all white. This is a private property, it is in the garden of an individual at the entrance of Jaujac, when arriving from Aubenas (in the Ardeche). It is clearly visible from the small road. It is rather successful, with perhaps a face a little too juvenile compared to the real statue, but the folds of the toga are well made, and the torch well made also. Among the reproaches, there is of course the flame of the torch, which here is probably a bulb, and the port of the tablet, perhaps a little too vertical. But overall, this statue is rather successful. 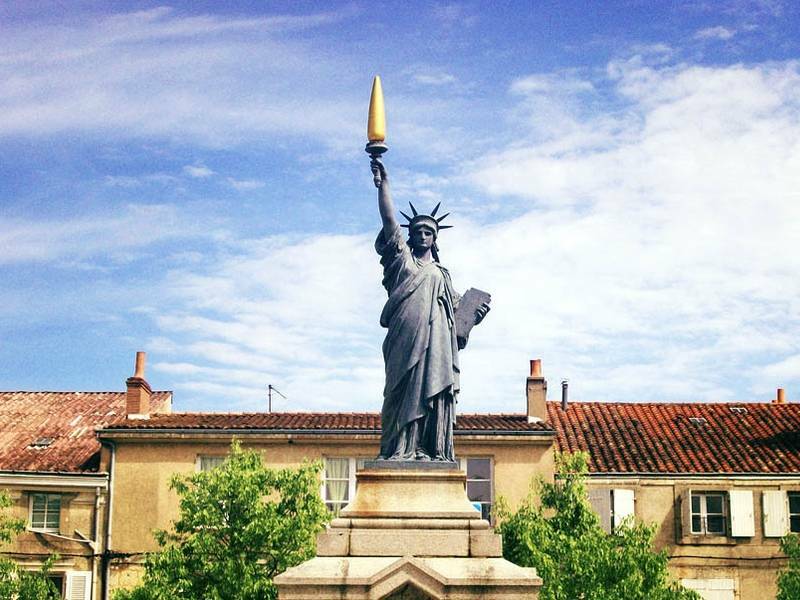 Replica of the statue of Liberty at Lunel (France). 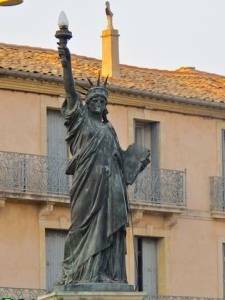 (Hérault) : The city has a stone statue of freedom at the center of a square. 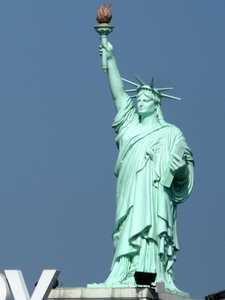 She was put in place during the celebration of the centenary of the French Revolution in 1889. Issue of the same workshops as the original statue, and Gautier Gaget she weighed 500kg for high 2m5. 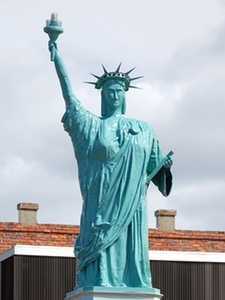 Unfortunately in 1943 the Germans made her melt, as well as to recover the bronze to remove this symbol of freedom. 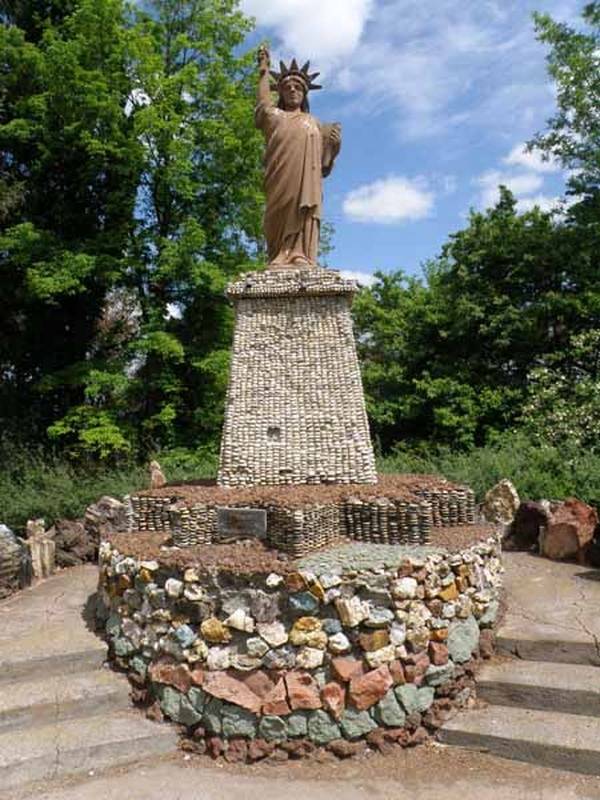 In 1989 we replaced it with another statue on the occasion ... the bicentenary of the French Revolution! The inauguration took place on 25 February. 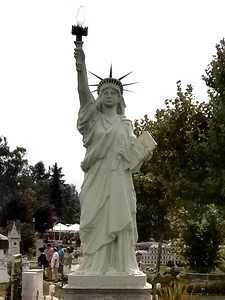 Replica of the statue of Liberty at Montagnat (France). 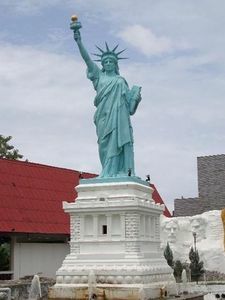 (Ain) : This is a statue of 4 to 5 meters high that serves as an emblem for the reception hall "Freedom", hence the use of the statue as a symbol. 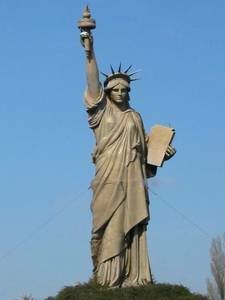 So we are in the private domain, and it is estimated that there are a large number of statues of private freedom in France. This one is one of the few to feature in this list. Replica of the statue of Liberty at Narbonne (France). 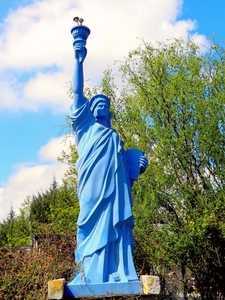 (Aude) : This is a statue of cast iron, painted blue. It is located at the entrance of a deposit Gruissan road materials. 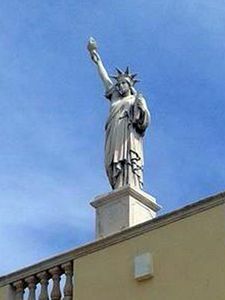 Initially she was at the entrance to the hotel Liberty, currently "Hôtel du Port", Gruissan, Shore Tramontana. 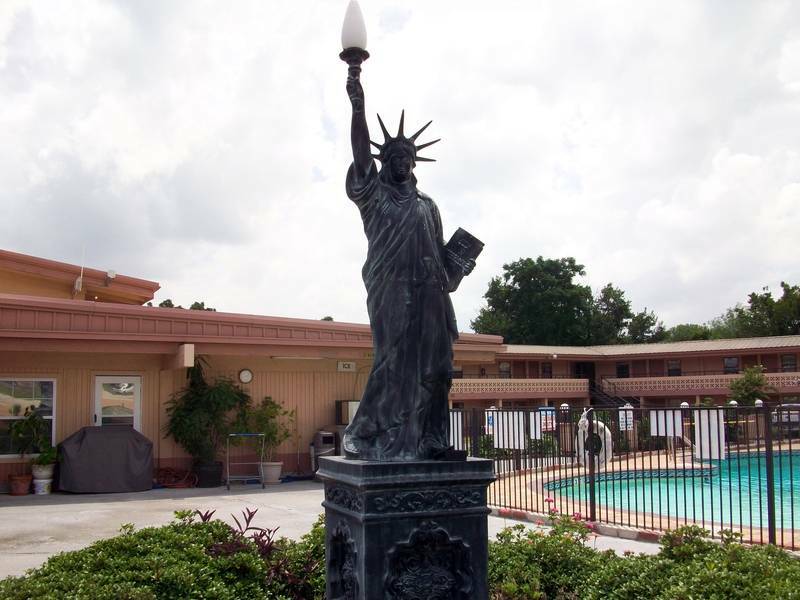 The hotel was sold and the statue was recovered before being installed there. 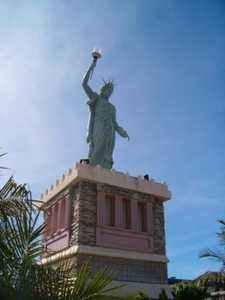 Replica of the statue of Liberty at Nice (France). (Alpes-Maritime) : Probably one of the more recent, it was put in place quay US in 2014. The statue, small, is too curved compared to the original and its rays are a bit thin. 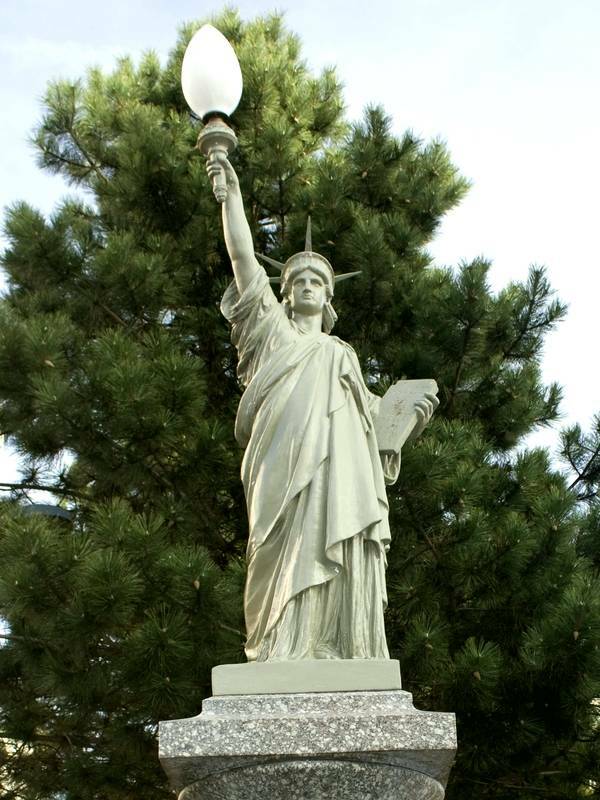 Replica of the statue of Liberty at Ourville-en-Caux (France). 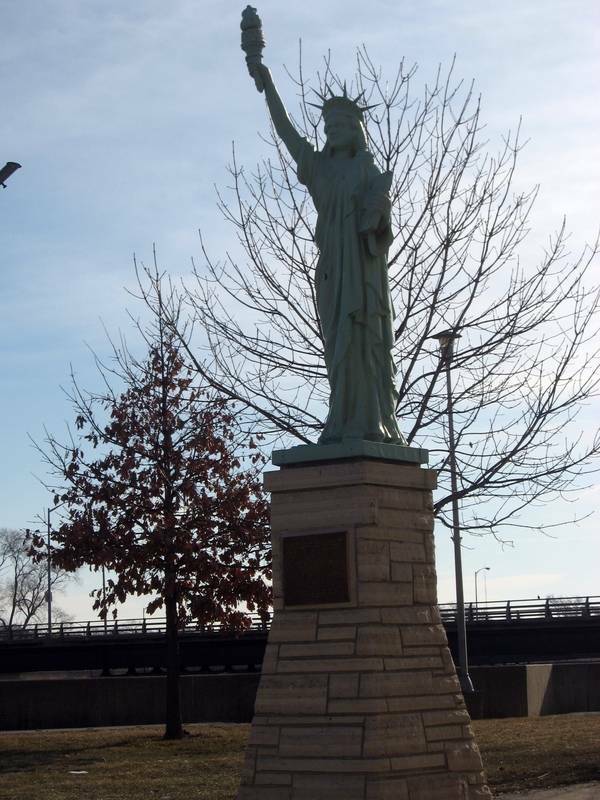 (Seine-Maritime) : This statue has a few errors that do not denature. She holds the tablet vertically, she has a crown of long, close rays, and especially she holds a torch-shaped openwork bowl. And of course, it is blue. It is located on a roundabout in the city, which is, itself, a sixty kilometers from Le Havre, between Fauville and Cany Barville. 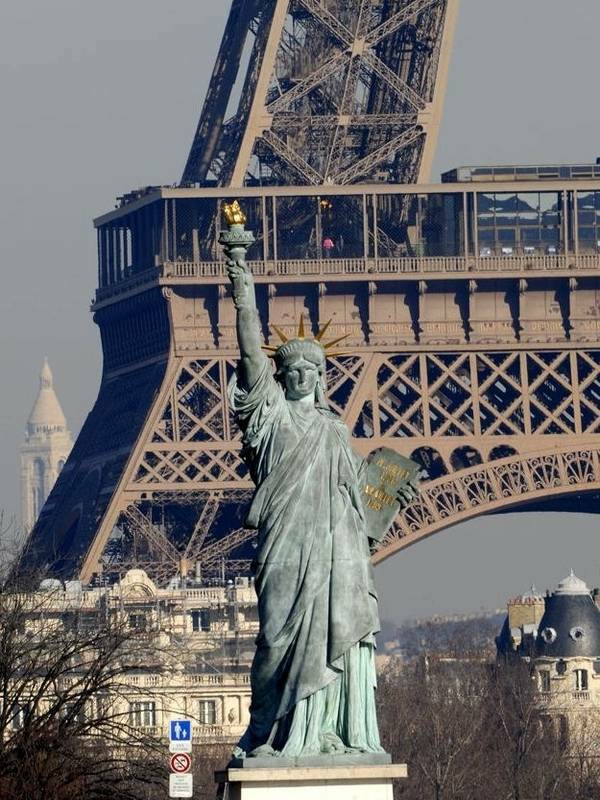 Replica of the statue of Liberty at Paris (France). 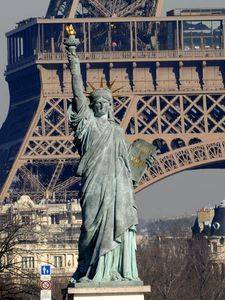 (Seine) : This statue is simply a bronze replica of the one that served as a model for the realization of the New Yorker statue. 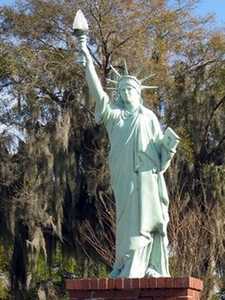 It measures 11.5m and weighs 14 tons and was installed and inaugurated in 1885 on the site of the United States. 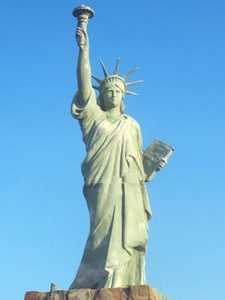 It was donated to the town in Paris by the American community in recognition of guarantee for delivery of the statue in New York ... which had not yet been officially opened. 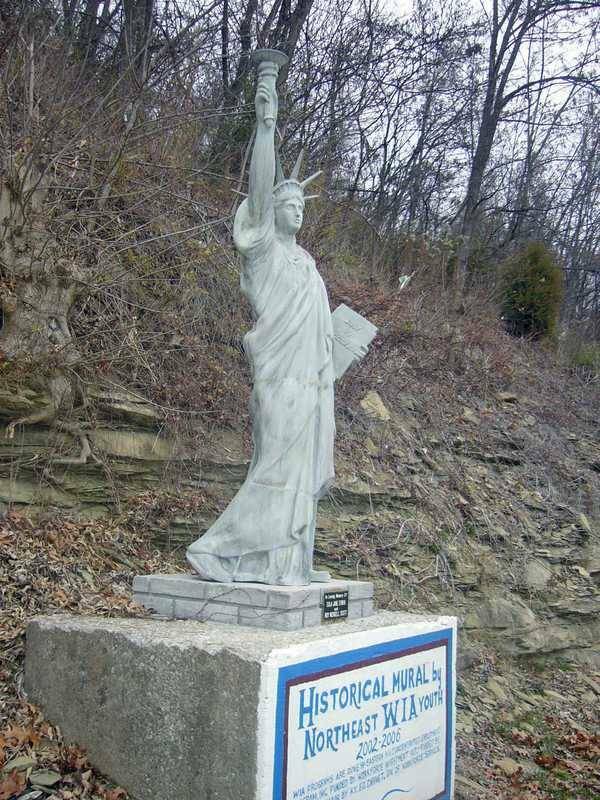 However the location was a problem because instead of the United States was too narrow for such a monument. It was then moved to the Isle of Swans, near the Pont de Grenelle, where important work of big-works were necessary. Its orientation has also posed the problem: It was facing the town, with their backs to that of New York. Its orientation was then changed in 1937. For the record, you should know that the day of the inauguration, the subscription was not completed, and the work not done. 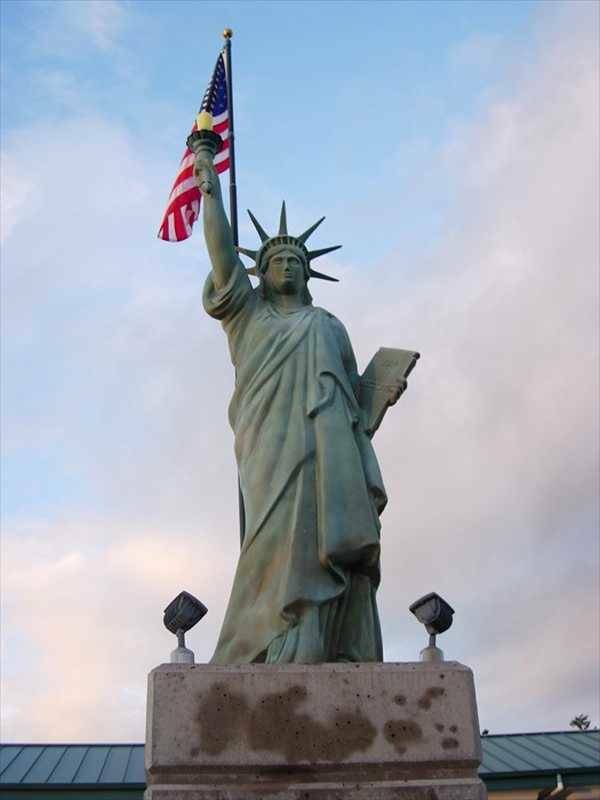 So the statue that day, was still the old, the true model of Bartholdi! Replica at the Orsay Museum, at Paris (France). (Seine) : Situated today at the Orsay Museum, the statue is one of the first that were melted in the same mold as the one used in the original model. 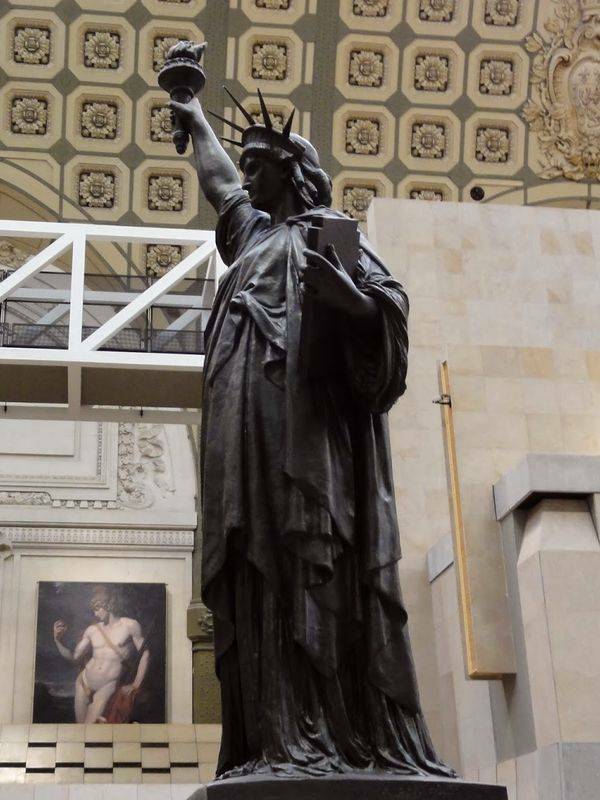 She has the same size, she makes a little less than three meters high, and was commissioned by Bartholdi himself in 1889, and then exposed in 1900 during the World Exhibition in Paris. Property of the artist, she was given in 1906 by her widow at the Luxembourg Museum, who installed a long time in the gardens. 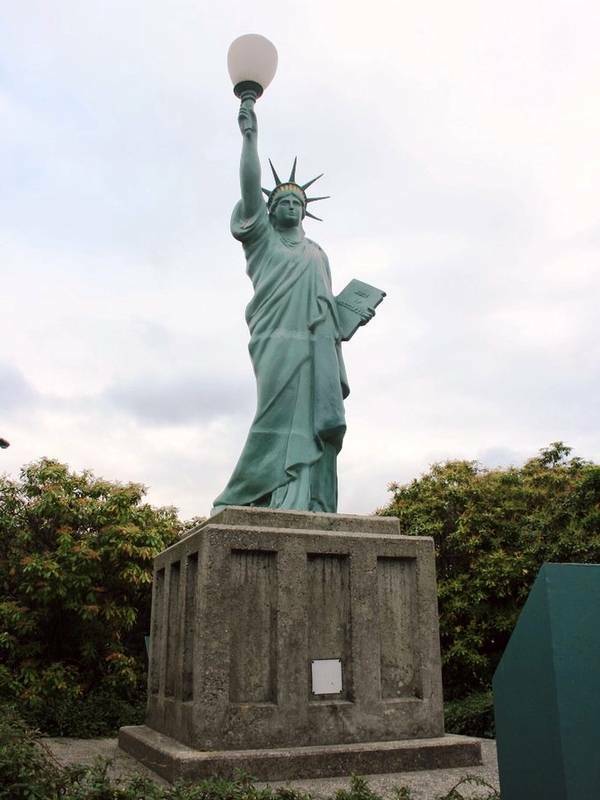 Recently, being damaged, she was transported to the Museum of the Quai d'Orsay and was replaced by another identical statue, later, in the gardens. Replica at the Luxemburg garden, at Paris (France). 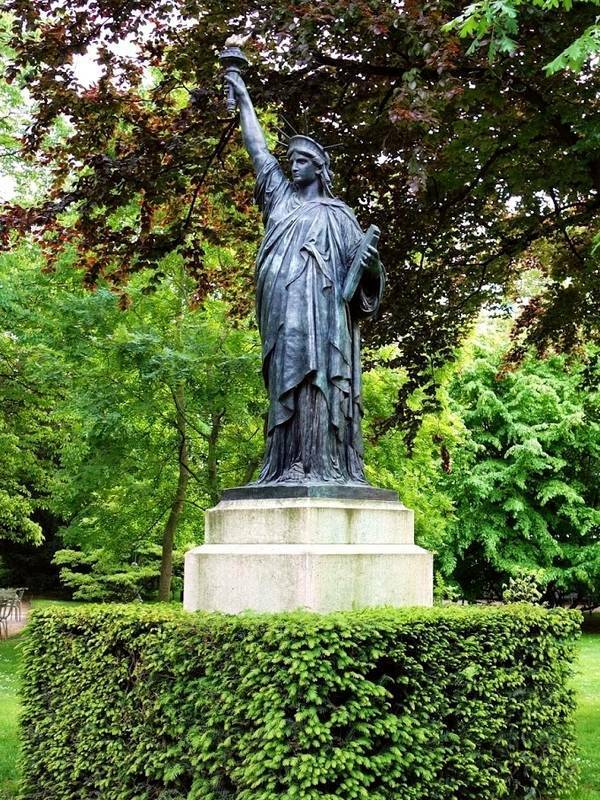 (Seine) : In the Luxembourg Gardens visitors can cross this beautiful statue of Miss Liberty, which is of great fidelity to the original. 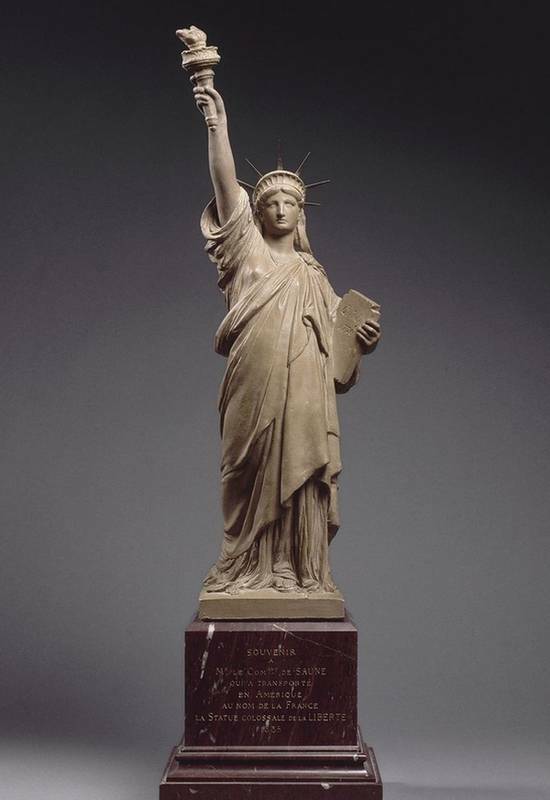 Normal, it is a replacement copy of the statue sold at the Luxembourg Museum by the widow of Auguste Bartholdi in 1906. This, in danger of being damaged, recently moved to the Musée d'Orsay be protected from the weather. This replica is of the highest quality. Replica of the statue of Liberty at the 'Arts et Métiers' museum, at Paris (France). (Seine) : The Statue of Liberty is the only one not to be a replica of the Statue of Liberty: THIS IS THE STATUE OF LIBERTY HERSELF. 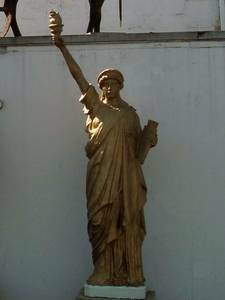 Indeed, Auguste Bartholdi, the sculptor, was first realized this statue one, which is called the original statue, and presented throughout the project. 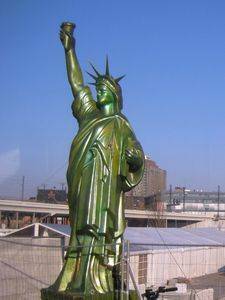 When he was able to start work, he used it to model an enlarged four times larger, and it is this model that was extended four more times to get to the New Yorker statue. So all of this statue by one, very well exposed in the Museum of Arts and Crafts in Paris, which can be estimated to be the original model. 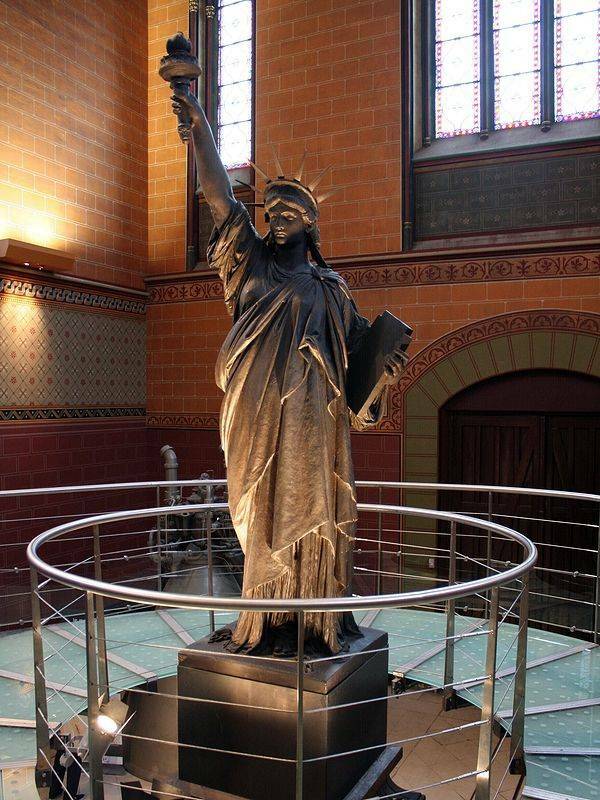 Replica of the statue of Liberty at the entry of the 'Arts et Métiers' museum, at Paris (France). (Seine) : There is also a replica at the entrance of the Museum of Art and Crafts, to mark the entrance. 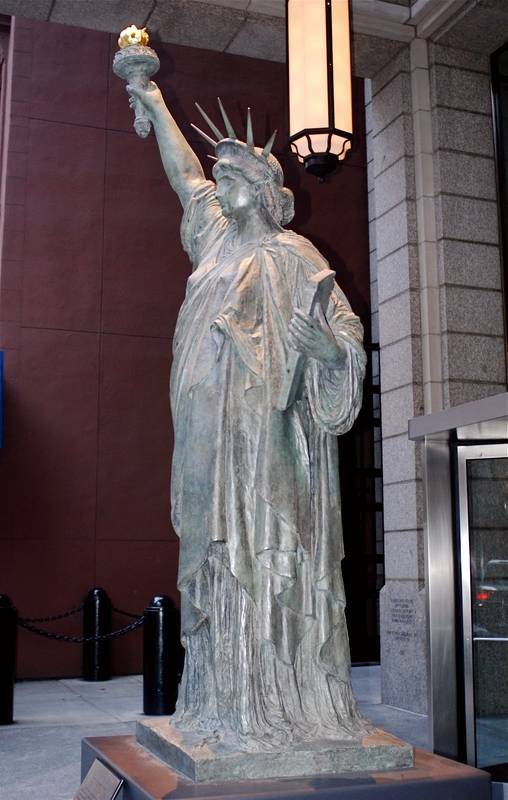 This is an exact replica of the statue located inside the Museum of Arts and Crafts, which is simply the original Statue of Liberty, the model used in the first ever expansion. 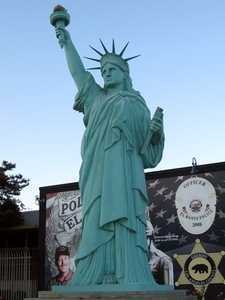 Replica of the statue of Liberty in frontdoor of the American Dream, at Paris (France). 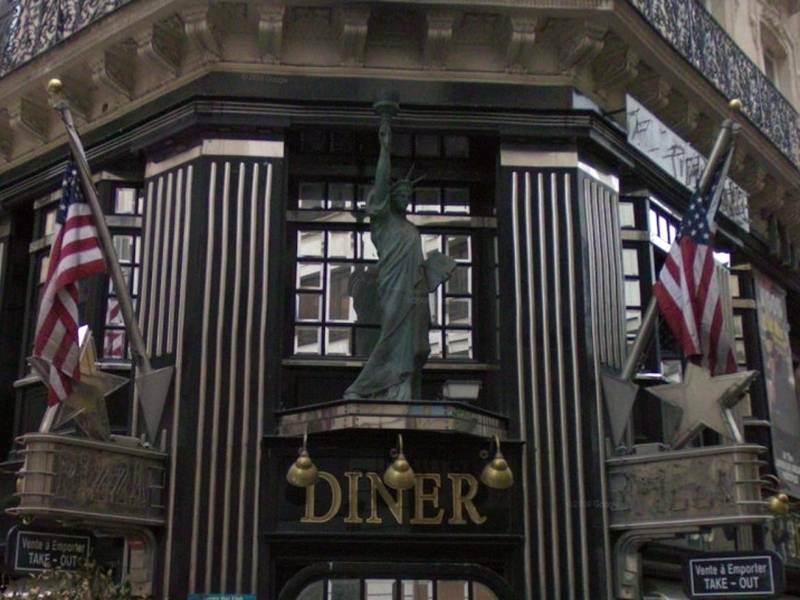 (Seine) : There is another statue of Liberty in Paris, for commercial use: She's on the front of the American Dream, an American restaurant in the capital. 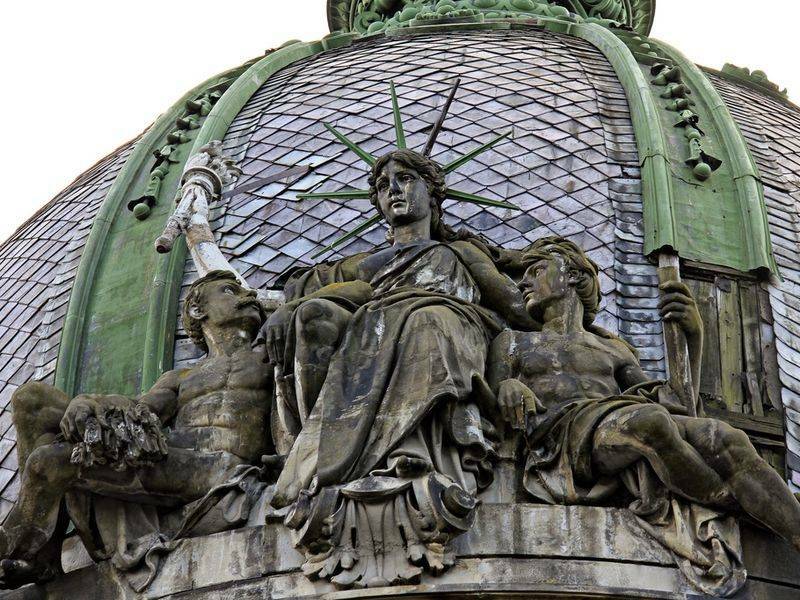 (Seine) : Probably the most original replica of the Statue of Liberty in Paris, the Centauri is also the smallest. Indeed, it is the sculptor Caesar who made it, it represents a centaur whose face is that of the artist. Aside from his style so recognizable, the statue has the characteristic to shelter on her chest a tiny replica of the Statue of Liberty. 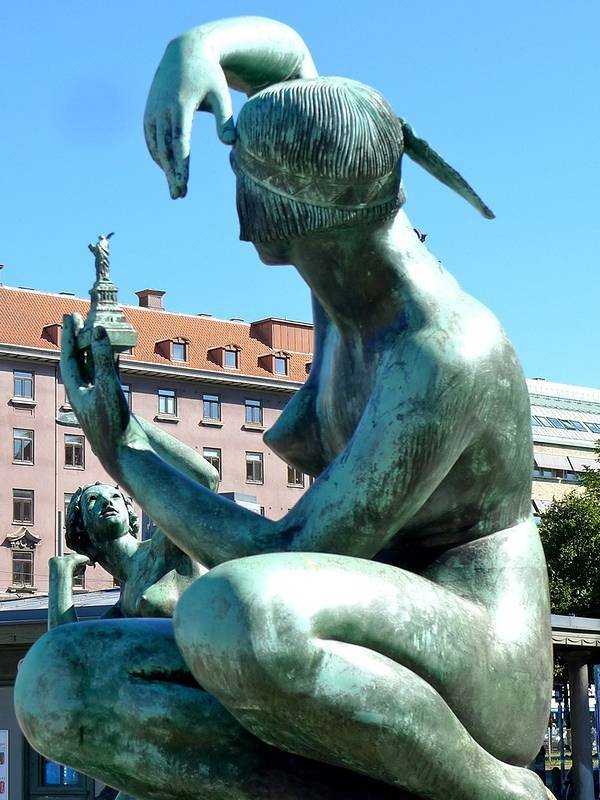 It is a curiosity, but not unique in the world: A fountain sculpture uses the same process in Sweden, Stocklholm. 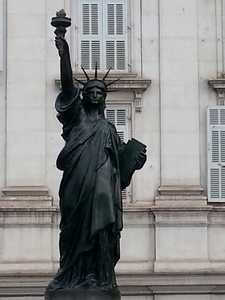 This statue is visible in Paris Michel Debré square. 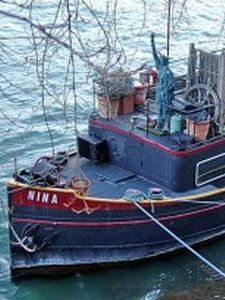 (Seine) : Another replica of the Statue of Liberty in Paris, but not where we expect it: It is located on the barge "Nina", moored along the banks of the Seine, near the tour Eiffel. 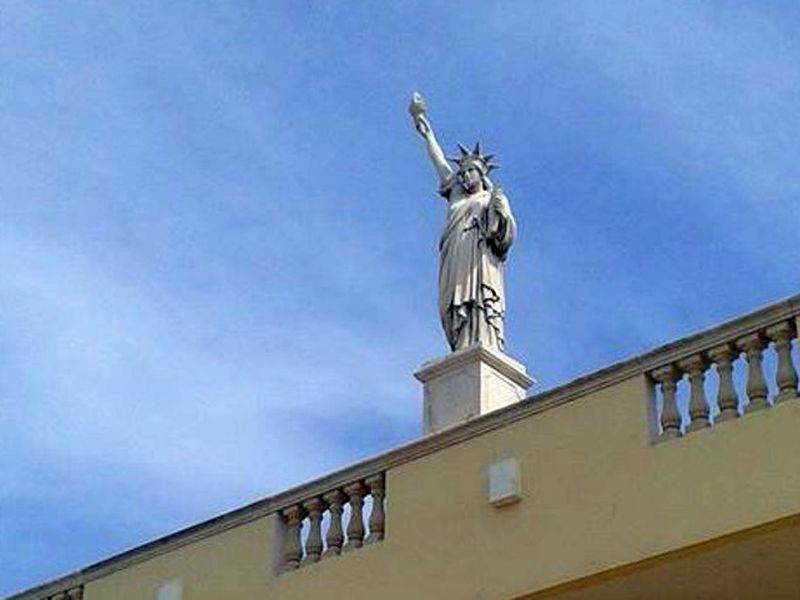 This statue should measure approximately 3 meters high, it is on the front, like a figurehead. 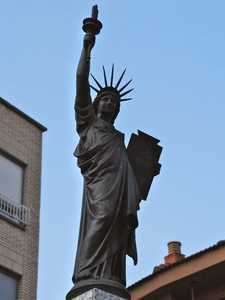 Réplica of the statue of Libety at Perpignan (France). 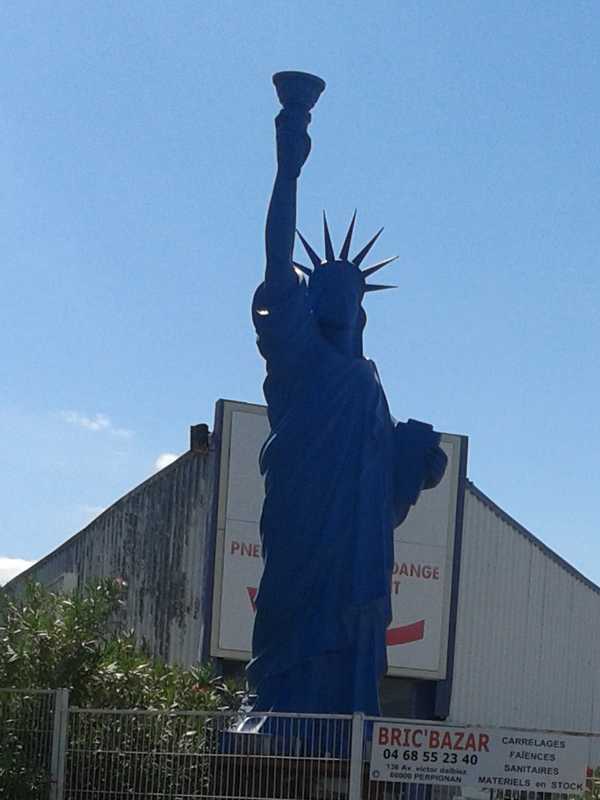 (Pyrénées-Orientales) : This statue of a not very happy blue is at the entrance of a dealer of used vehicles, in front of the famous company Cémoi, in Perpignan. Made of polymer materials, it seems quite fragile. It is not particularly successful, it holds a torch completely missed compared to the delicacy of the original, and the folds of the toga are really coarse. 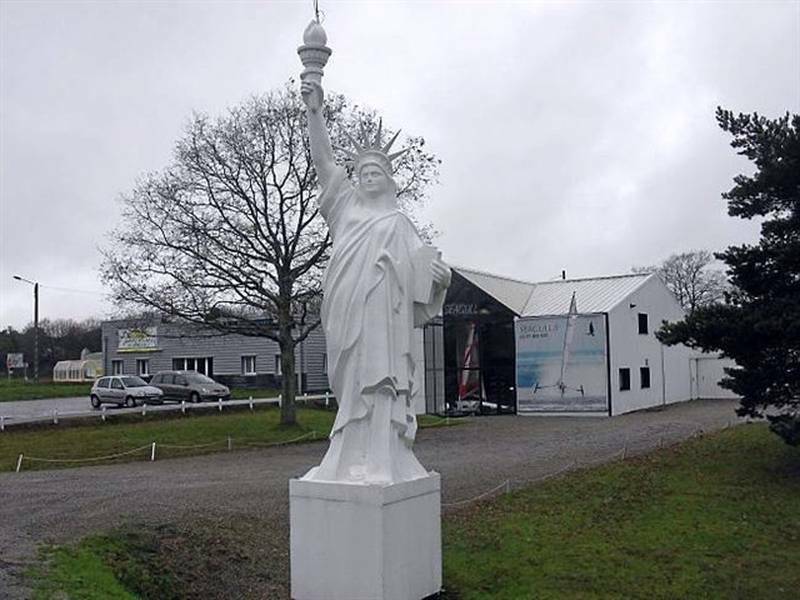 Replica of the statue of Liberty situated at Plaintel (France). (Côtes d'Armor) : A strange statue that was conducted with a chainsaw! It is of course wood. The artist Gerard Ferruel, who carved in 1996 to mark the 10th anniversary of the feast of lumberjacks. Replica of the statue of Liberty situated at Ploeren (France). 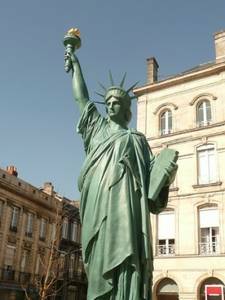 Replica of the statue of Liberty situated at Poitiers (France). 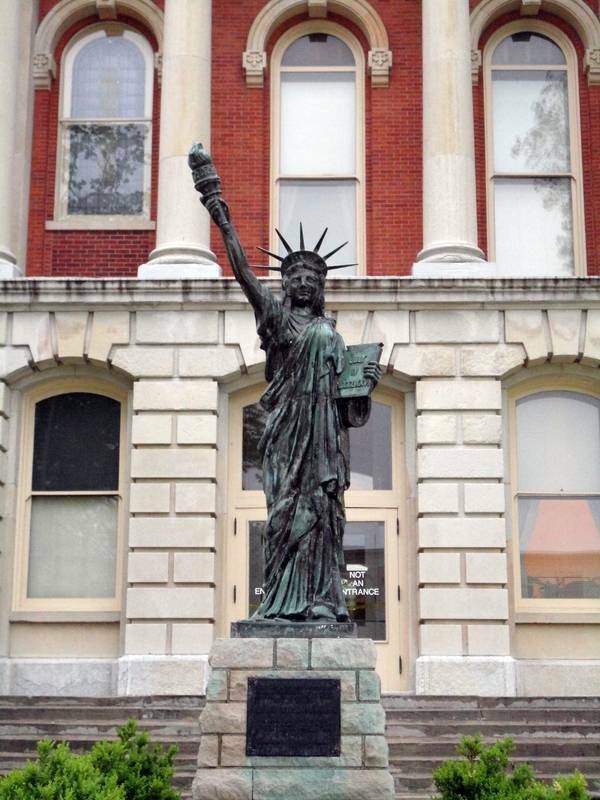 (Vienne) : The statue is located on Liberty Square. It is almost in line, but the torch is very large, very long. 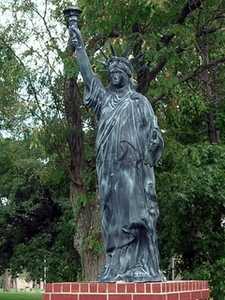 This statue was donated to the city by the Masonic Lodge in 1903, ie one year before the death of Bartholdi. Instead took the name "Freedom Square" after 1822 following the death of General Berton, guillotined, which had the last words "Long Live Freedom". 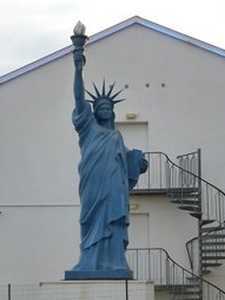 Replica of the statue of Liberty situated at Rozay-en-Brie (France). 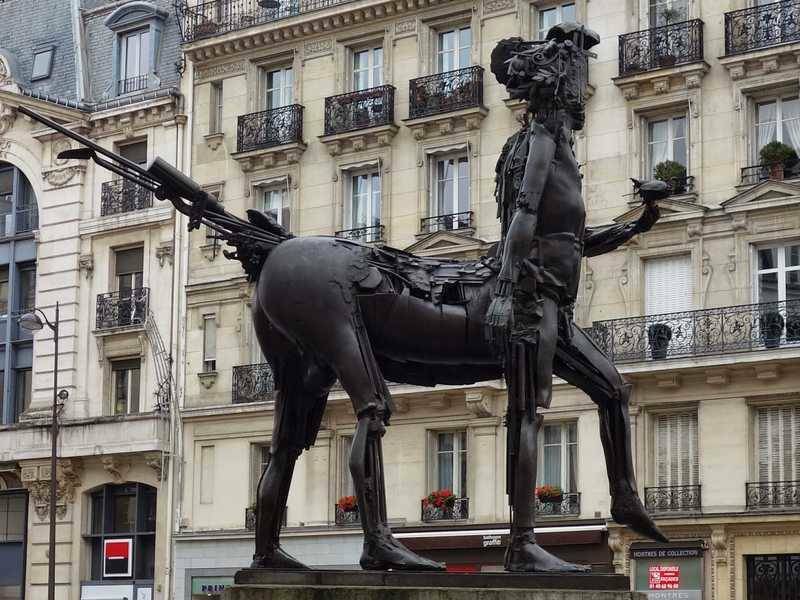 (Seine-et-Marne) : This statue is one that departs furthest from the original. Wearing a Phrygian cap in place of the crown of rays, she holds her ground tablet, and is armed. 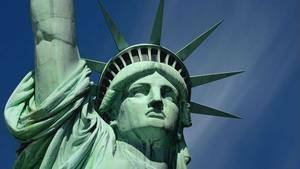 It is in this list because it is commonly accepted as a replica of the Statue of Liberty in New York, but too many differences make it incompatible with that status. 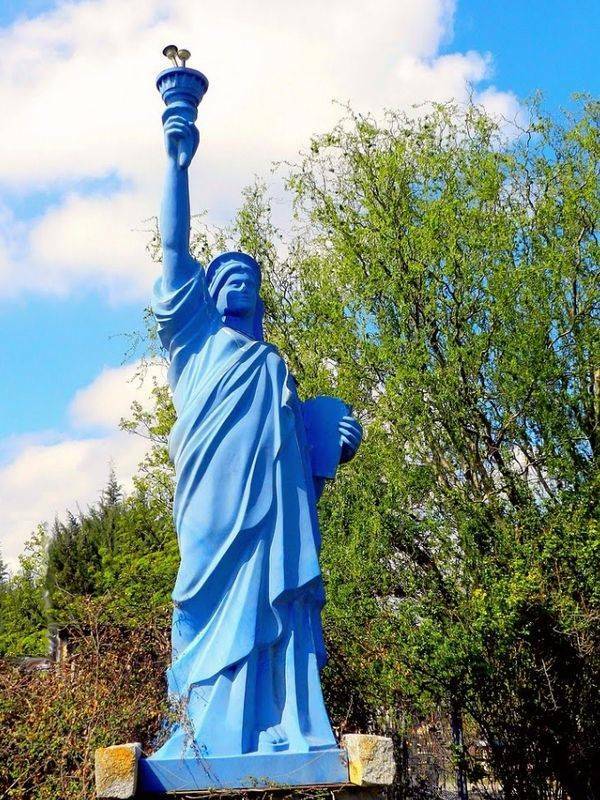 Replica of the statue of Liberty situated at Roybon (France). 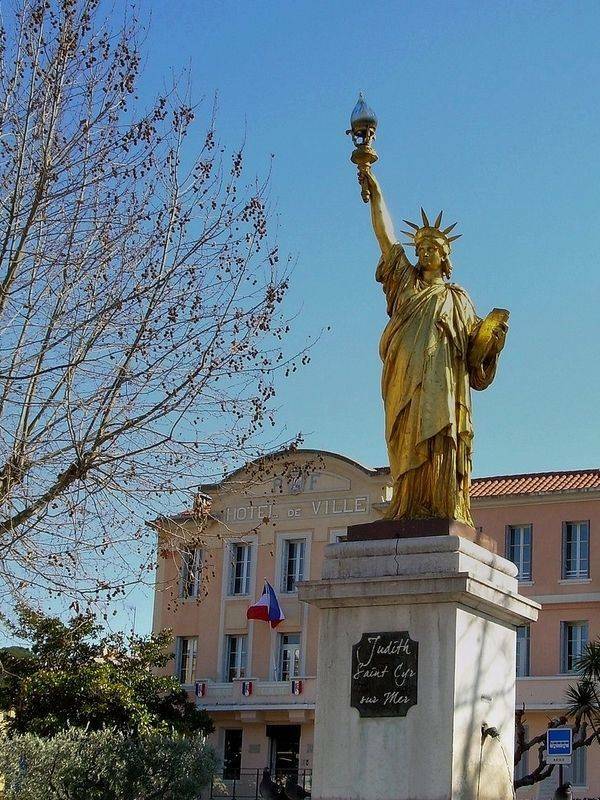 (Isère) : This is a historic replica of the statue, located on the main square. 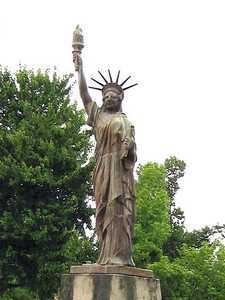 It was donated by Bartholdi in honor of Henry St Romme, a prominent figure of the Second Republic, from Isère, her son Mathias Saint Romme, who has installed in Roybon. 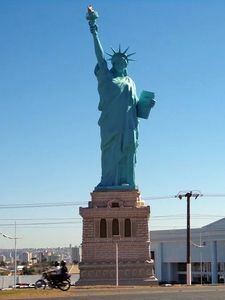 This statue is 3 meters high and it is an exact replica of the one in New York. 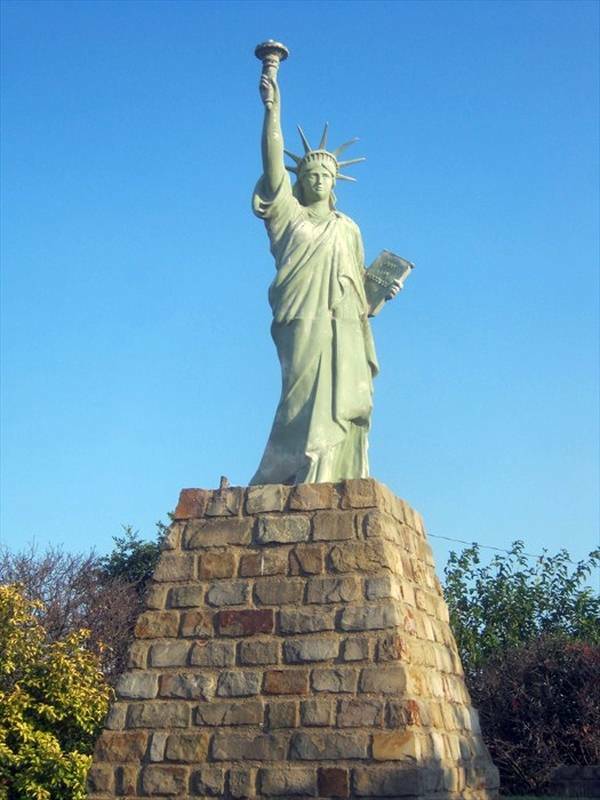 Replica of the statue of Liberty situated at St-Affrique (France). 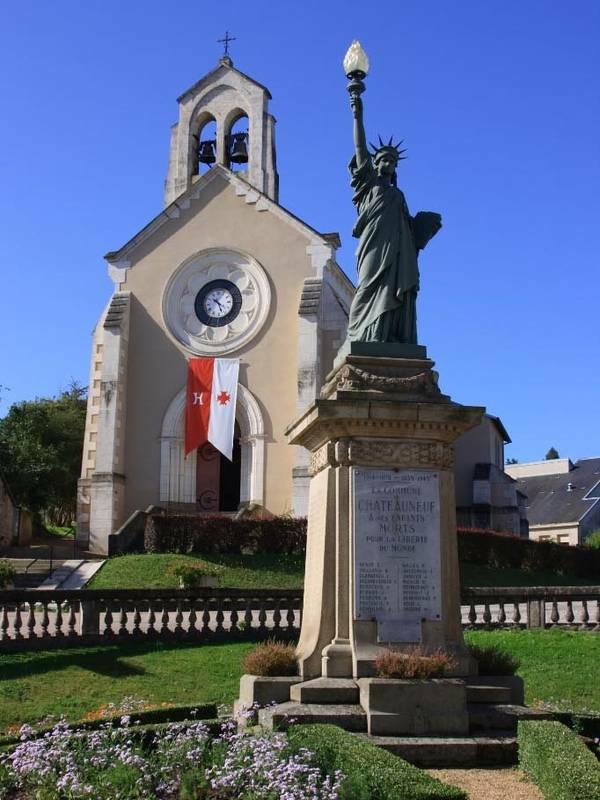 (Aveyron) : Sise Freedom Square, the statue was installed in this place in 1889 to mark the centenary of the French Revolution. The monumental fountain that sat there was moved to a public garden. 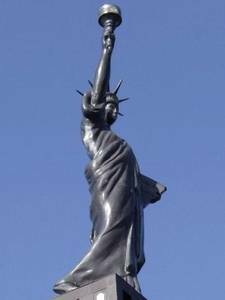 In 1942, during World War II, the statue was melted by the Germans to recover the bronze as well as to remove this symbol of freedom. 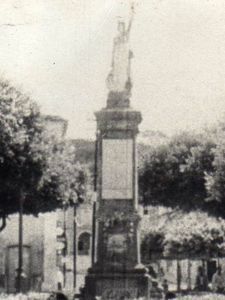 His replacement was passed at the end of the war, but no company could not provide a suitable reply, then in 1946 the pedestal of the statue was removed. 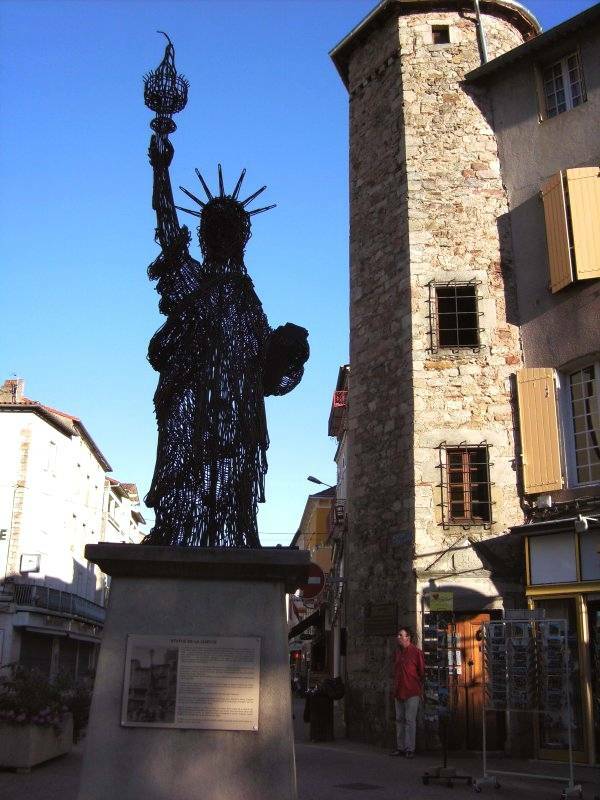 It was not until 2006 that the municipality is back Miss Liberty in the instruments of the artist André Debru Smith, who made wrought iron work very modern. 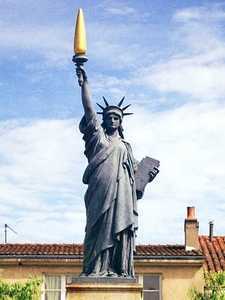 Replica of the statue of Liberty situated at St-Cyr-sur-Mer (France). (Var) : Portalis on site there is a golden statue holding a lamp instead of the traditional torch. Inaugurated in 1913, on the occasion of the installation of the first drinking water network in the city, it is offered by Anatole Ducros, a wealthy owner of St Cyr. 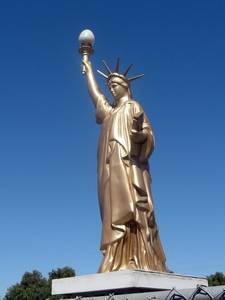 It is cast iron and coated with a thin gold coating and measuring 2.50m high. 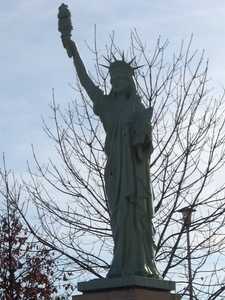 Replica of the statue of Liberty situated at St-Etienne (France). 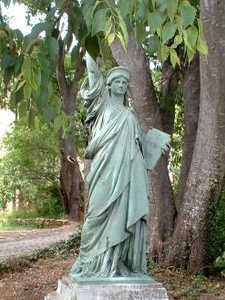 (Loire) : This statue was set up in 1915, but is unusual, it was never officially inaugurated. Initially Badouillère place, it is now place Jules Ferry. 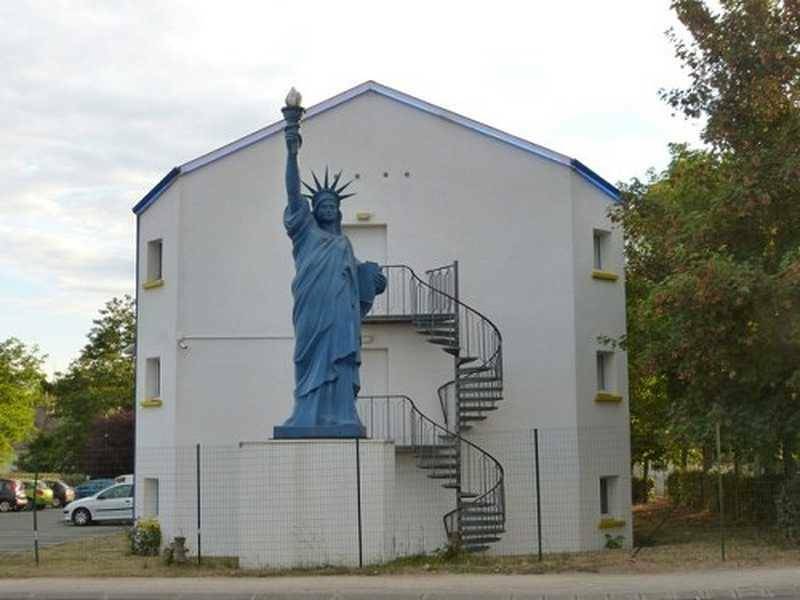 Replica of the statue of Liberty situated at Saint-Germain-la-Forêt (France). 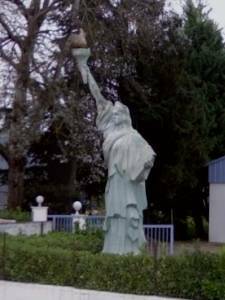 (Loir-et-Cher) : In Saint-Germain-la-Foret, near Blois, visitors can come across a beautiful reproduction of the Statue of Liberty. 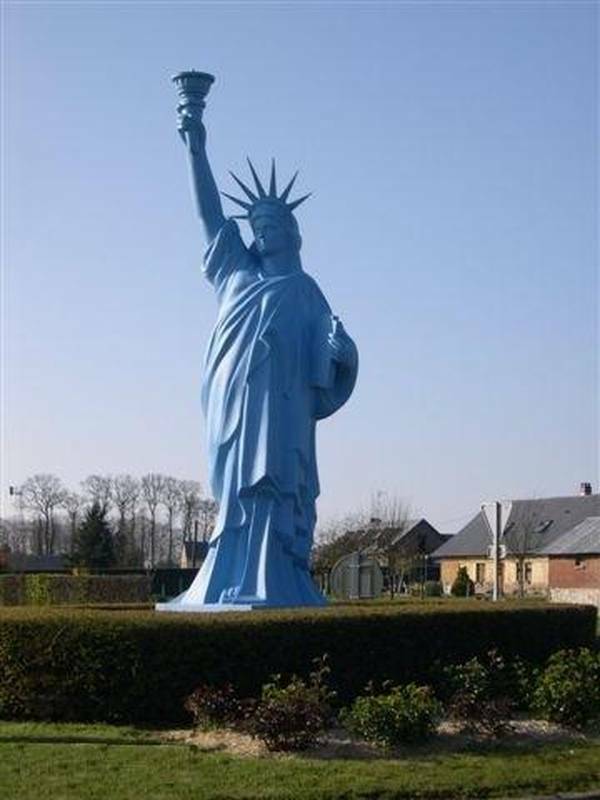 It is blue in color, measuring approximately 2.50m and is on a high pedestal, but rather simple. It serves as an advertising sign for a hotel. This is a rather strange vision than this statue here. Note that this is not true copy, she too frank smile and details of her toga are not reproduced correctly. 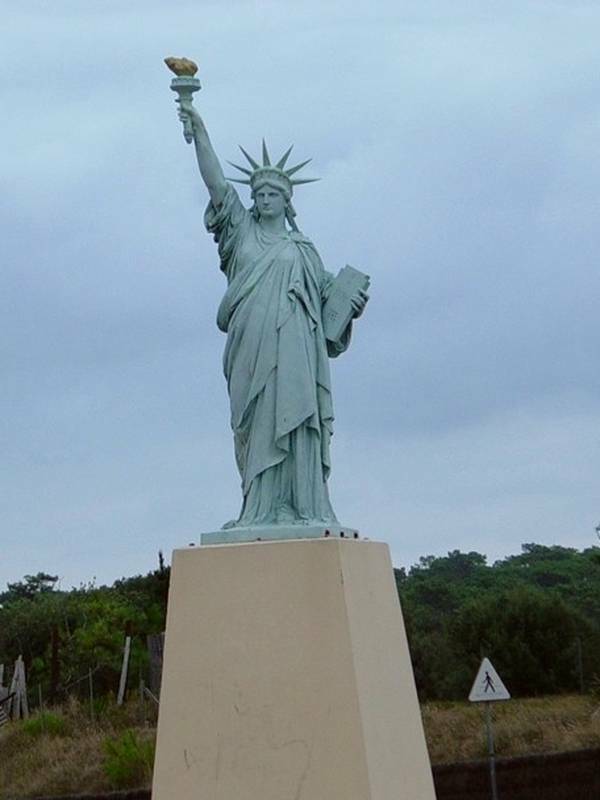 Replica of the statue of Liberty situated at Soulac-sur-mer (France). 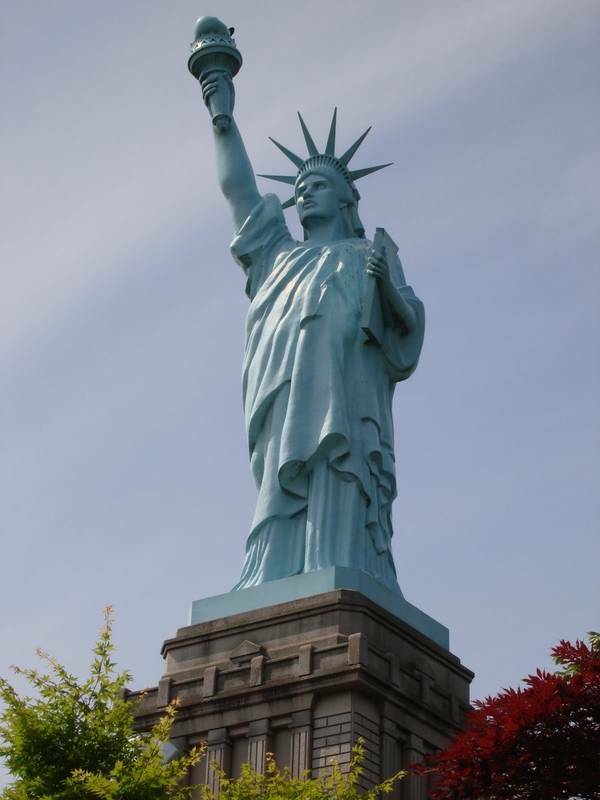 (Gironde) : The Statue of Liberty is bronze. Fondue by Thiebault workshops. It was bought in 1980 by the municipality of Soulac-sur-Mer who wanted to mark the shipment of Lafayette to America. 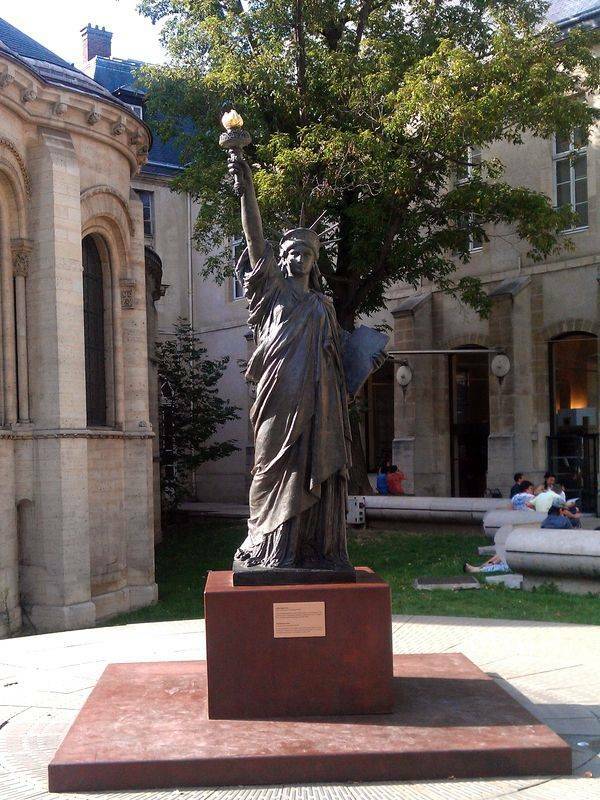 Prior to final installation, the statue was in stocks in the Paris Arthus-Bertrand, but we do not know its exact origin. 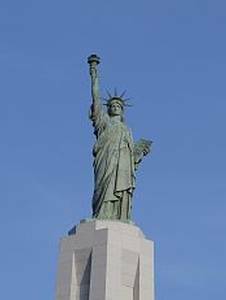 Replica of the statue of Liberty situated at Vascoeuil (France). (Eure) : Very nice statue by Dali. Its characteristic? She raises both arms! 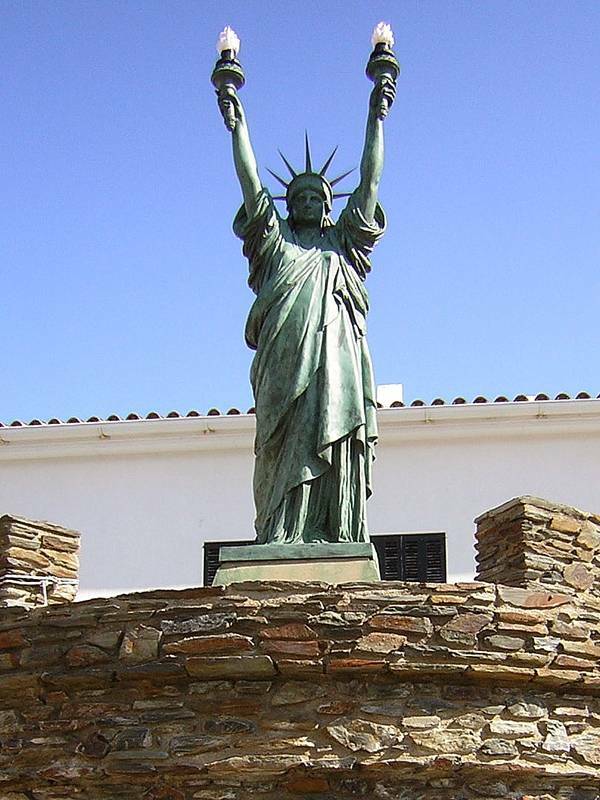 Note the presence of a copy of the statue at the entrance to Cadaqués, Spain, where the artist lived for a long time. In India there is an amusement park in the city of Mumbai called Vardhman Fantasy. 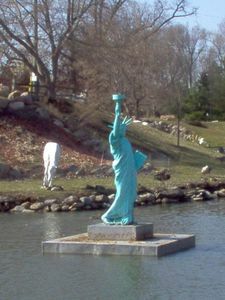 Like many parks in the world it offers replicas of some iconic landmarks like the Eiffel tower or the Statue of Liberty. This one is rather well reproduced, with well pronounced details. The realism will have to identically reproduced the base, yet is rarely highlighted in replicas, as faithful as it is. The park's address is a bit special, seen from France, "Shivar Vardhaman Fantasy Gardens, Kashi Mira Road, Chatrapati Shivaji Marg, Mira Road East, MUMBAI 401107". Do not forget anything when you give it to a passerby. 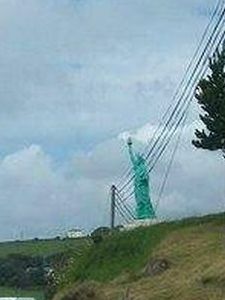 Strange vision that this statue that faces the ocean on the west coast of Ireland. 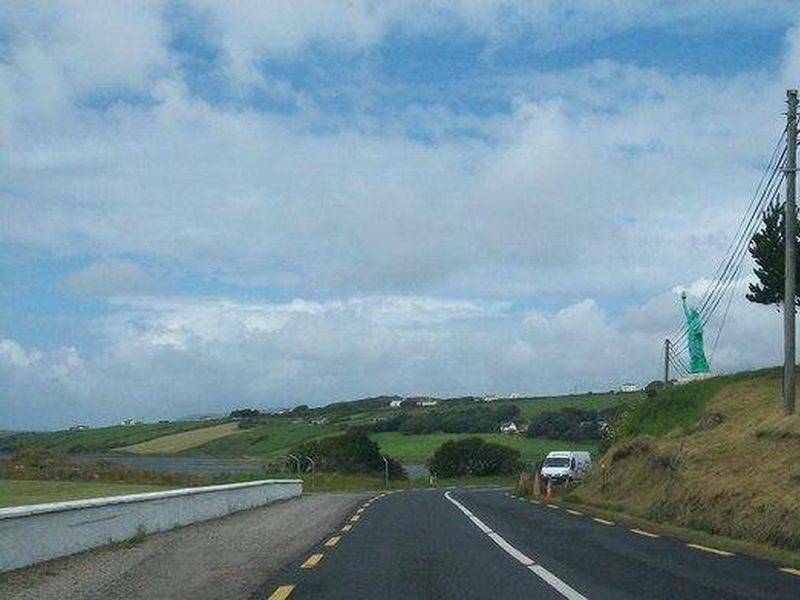 We are in County Donegal, near the town of Mulnamina-More. 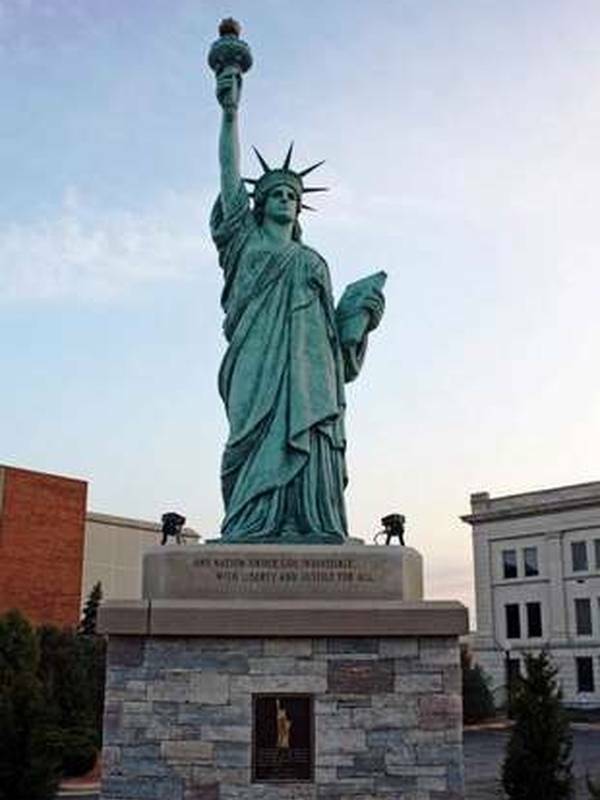 We do not know the origin of this statue and the reasons of her presence, but we must say it is rather surprising to find such a statue in the open field, most of the time they are in town, in parks, or the limit on large private land in the periphery. But in the countryside, there is unexpected. Difficult to say more on this copy, the poor quality of the photo is not possible to be more precise. It is difficult to find statues of Liberty in the Middle East, and yet it exists in Israel, in the village of Araba, where stands this stylized structure representing the famous statue. 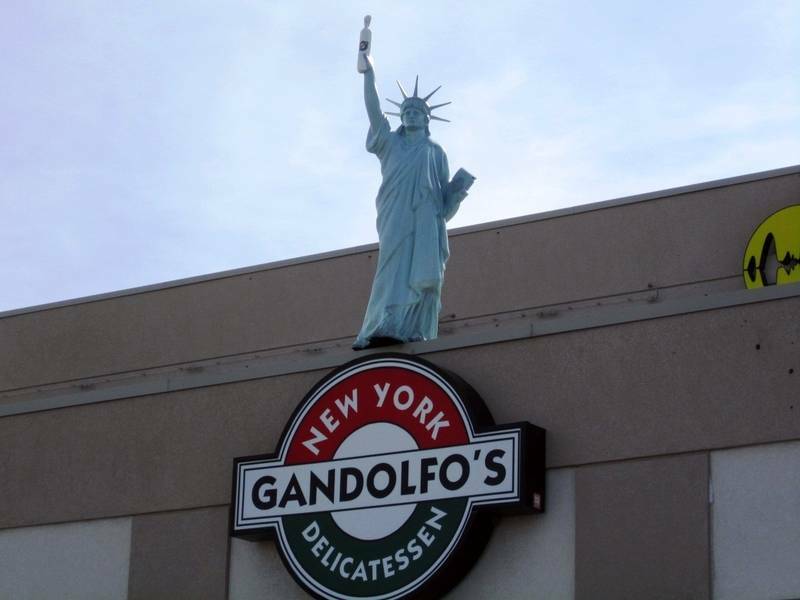 It is right next to the "Mother of Freedom", a restaurant that is not unrelated to the presence of such a statue. It is in the town of Arraba. A Jerusalem is the place of New York, probably a small square or a district of the city. 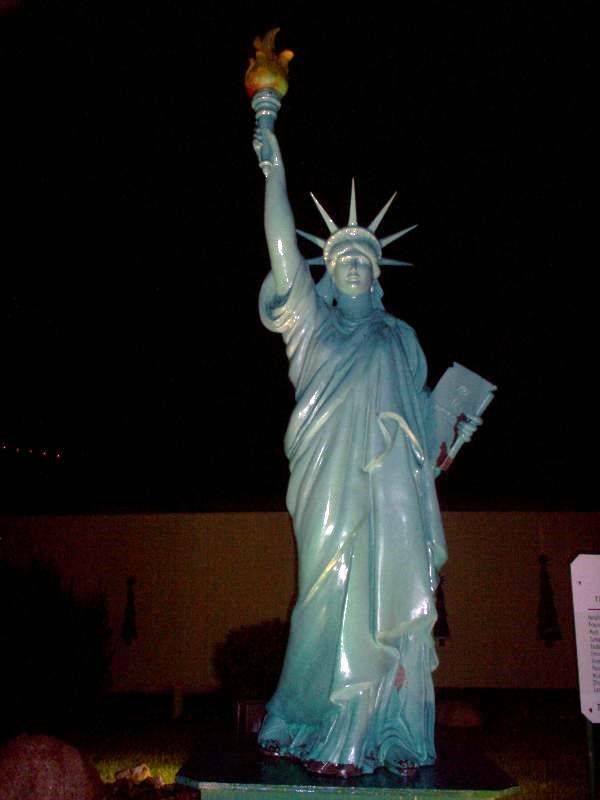 A stylized replica of the Statue of Liberty was implanted there. 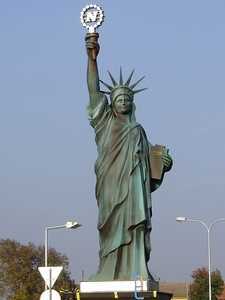 It is made of metal rods welded together, forming a set resembling little but recalling the posture of the New York statue. Note the inscription, written in three languages. The city of Salento on the Ionian Coast, Italy. By the sea there is a series of buildings in the locality "Torre Suda." On the roof of one of these buildings is the copy of the statue, which belongs to an individual who has put it there in decor. It is magnified by a fairly large base. One can easily imagine that it should not be a lot of wind in this region. As to why the statue is here, he would have to ask the owner. Note that it is not true to the original, it has, for example, the rays of too wide crown. For against her toga is high quality, folds are well marked. Japan 3 Statues of Liberty are listed. 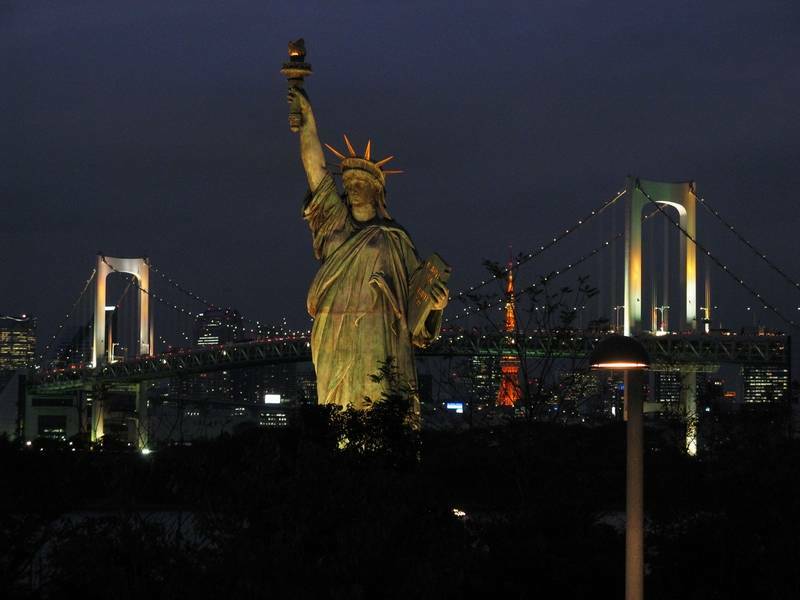 The largest is on the artificial island of Tokyo Bay. 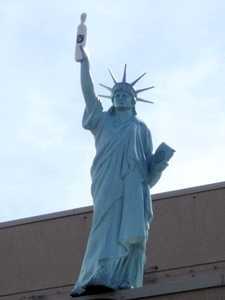 It is here that stands a statue in Odaiba. It is also the most famous of Japan. It is particularly well done. Another statue is recorded in Japan in the city of Osaka. It overlooks the shopping center "New American Plaza". It is well seen but can not be detailed because it is too far for that. Aomori is a city in northern Japan, near the Misawa Air Base. There is there a very well maintained park, very large, the Ichou Park, which hosts a replica of the Statue of Liberty, stand included. This is a high quality replica, despite some errors, the torch is not required right. 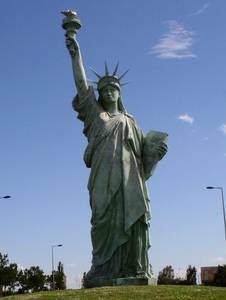 It is a very large since it 11.5 meters high, is the same size as the island of swans, in Paris, which became the model for Bartholdi for the construction of the original statue. When night falls the light turns on, giving the park a very pleasant atmosphere. 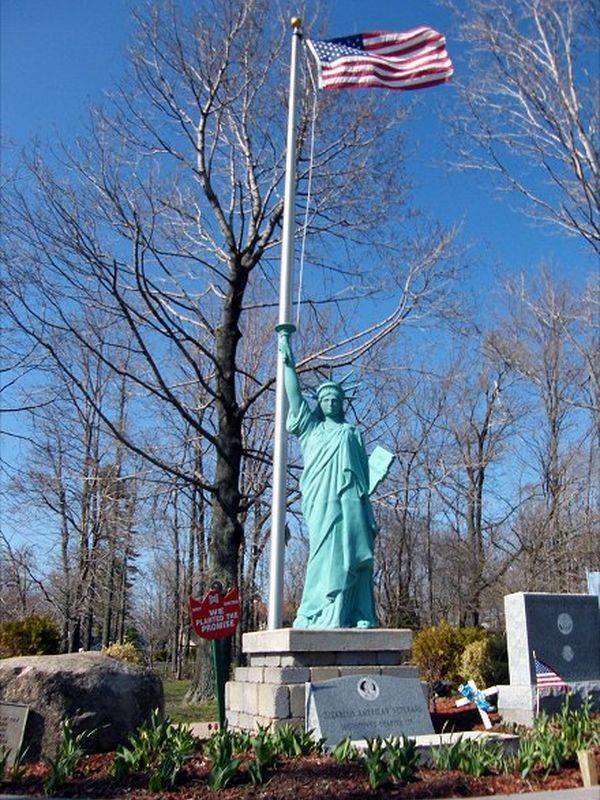 Note that this statue has exactly the same latitude as the statue of New York, 40 '40' 'North. 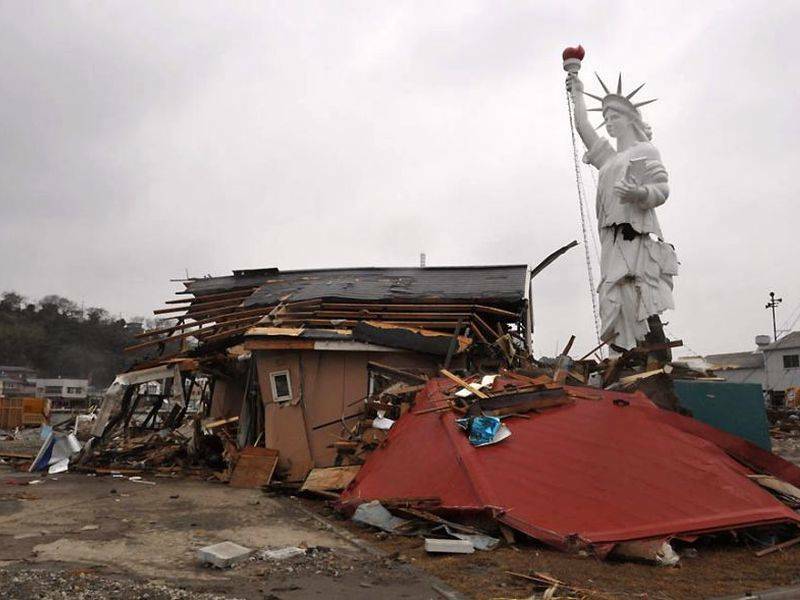 This copy was heavily damaged before 2014 in Ishinomaki, Miyagi prefecture, Japan. Its so pitiful state is due to the tsunami in March 2014 on the east coast. 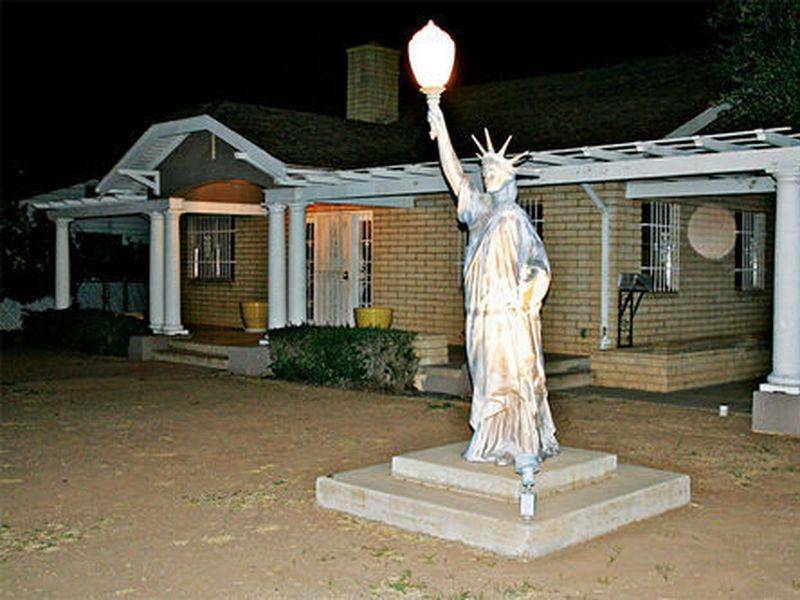 Given the state of the area, and particularly of the house pictured, the fact that the statue was destroyed completely anecdotal. 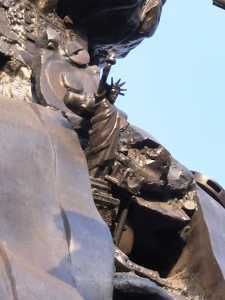 Damage, however, because the statue was original, she had a childish face and held her tablet arm, not your hand. 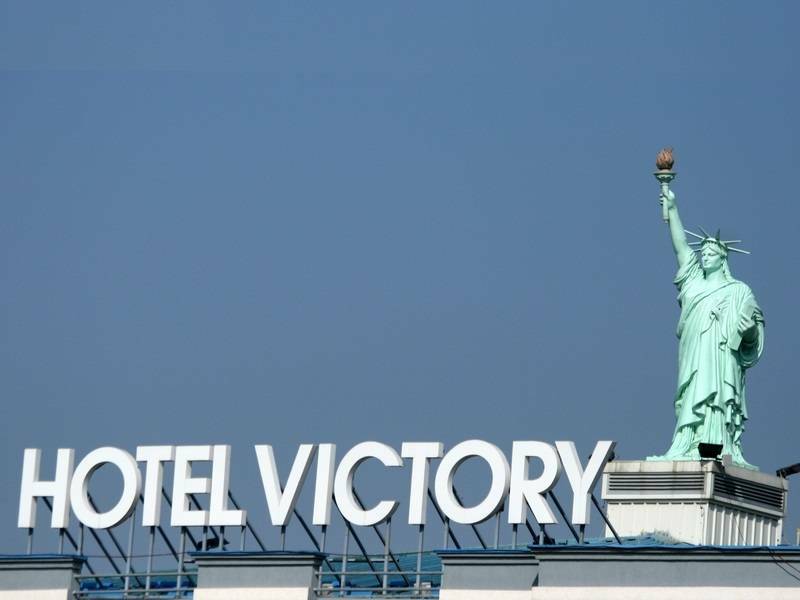 The country affected by war has in Pristina hotel Victory, on the roof which was built a statue of freedom almost compliant. His crown of rays is too flat, each ray is too separated from its neighbor. 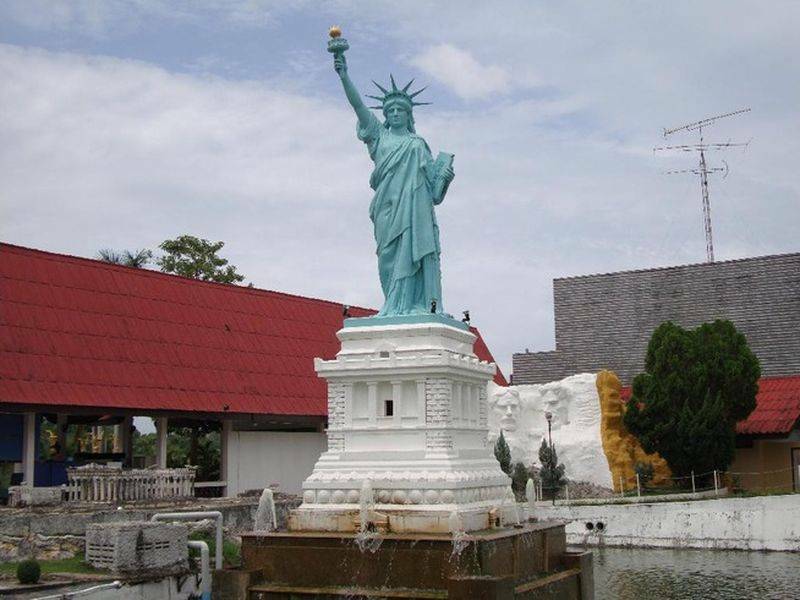 In Malaysia, it is in the province of Pahang that we can see the replica of the Statue of Liberty. It is located in a shopping and leisure center, the Genting Highlands. It differs from other copies of the quality of its representation, in fact, it is quite faithful to the original, and it's rare enough to report. 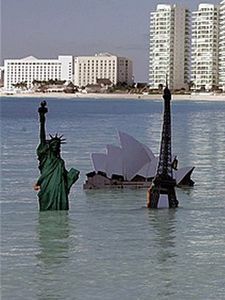 This photo shows a szene implemented by the environmental group Greenpeace, it aimed to highlight the dangers of rising sea levels due to global warming. The great monuments of the world have been reproduced, sinking into the ocean. 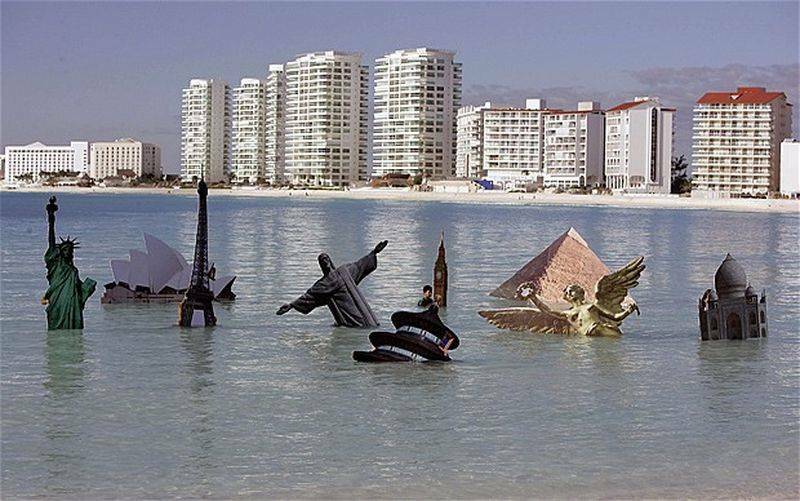 This temporary stage was made on Gaviota Azul beach in Cancun, Mexico, in December 2010. Gaviota Azul Beach is a very popular tourist destination. 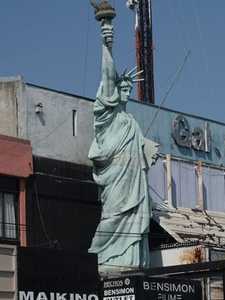 In Mexico the visitor can see several replicas of the Statue of Liberty. 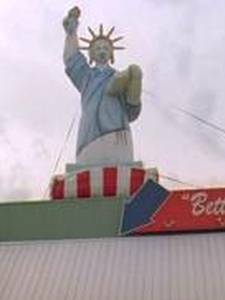 In the state of Campeche, it is in the small town of Palizada That There is this famous replica perfectly enhancement through a majestic stand. White in color, it is still not consistent, the purpose of quality development icts still worth seeing. 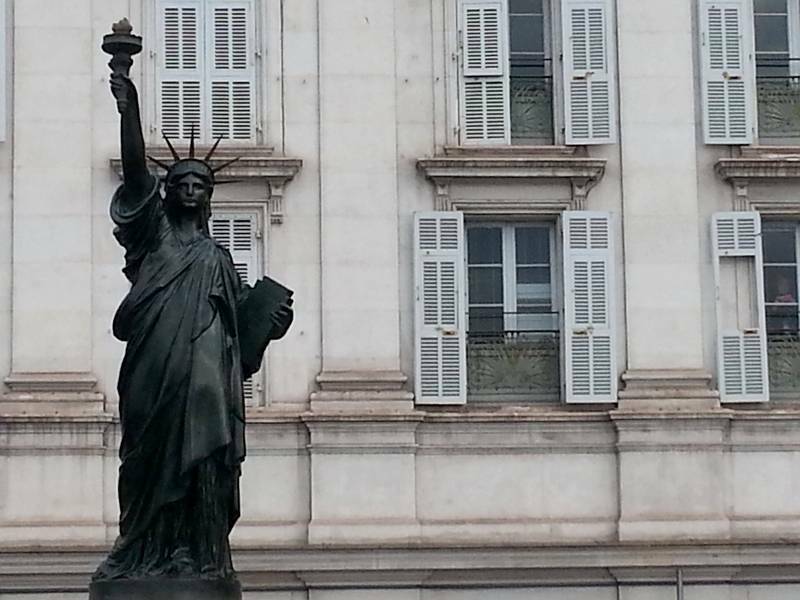 Even Burma has a Statue of Liberty! 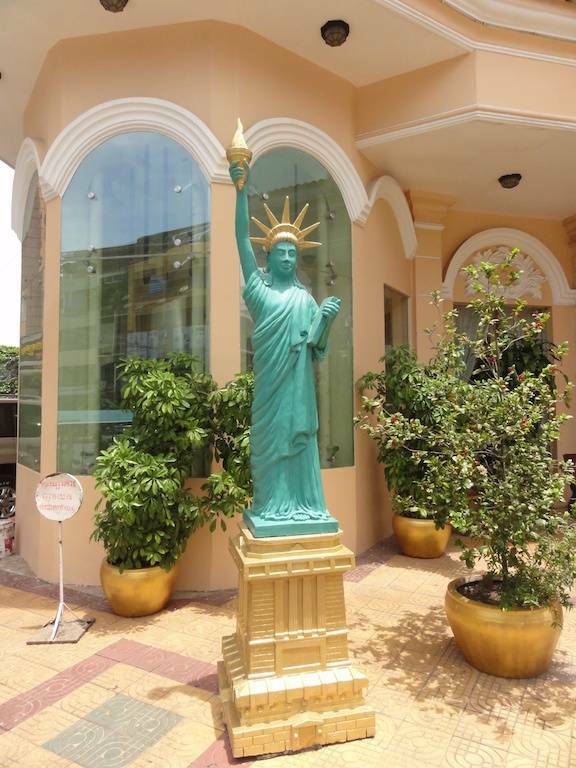 Yet this country is not known to be close to the US, but everything is explained when we know that this is an advertising sign placed at the hotel entrance "New York," the one of the many hotels Phnomh Penh center case. It is a few blocks from the Mekong along the main avenue. 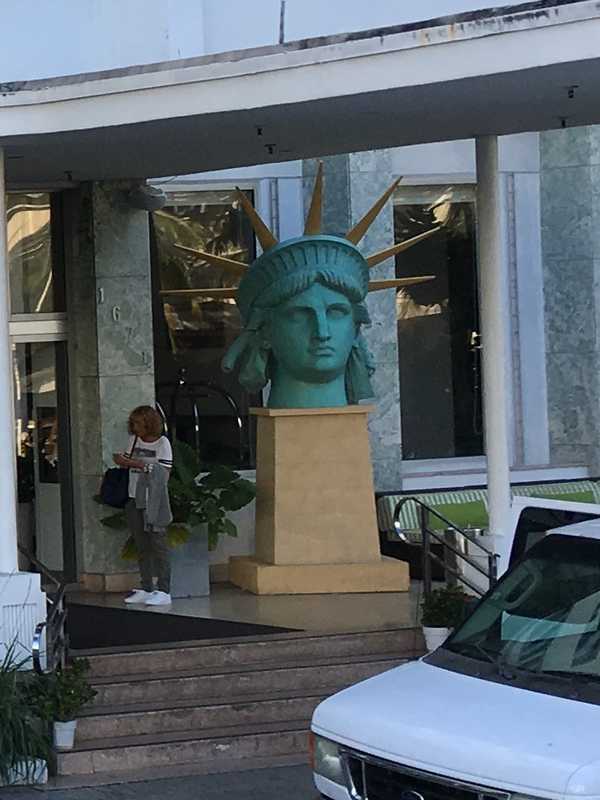 The statue is 2m high, it is bright green. If we observe closely we see that it has a little slit eyes ... But perhaps it is only an impression. 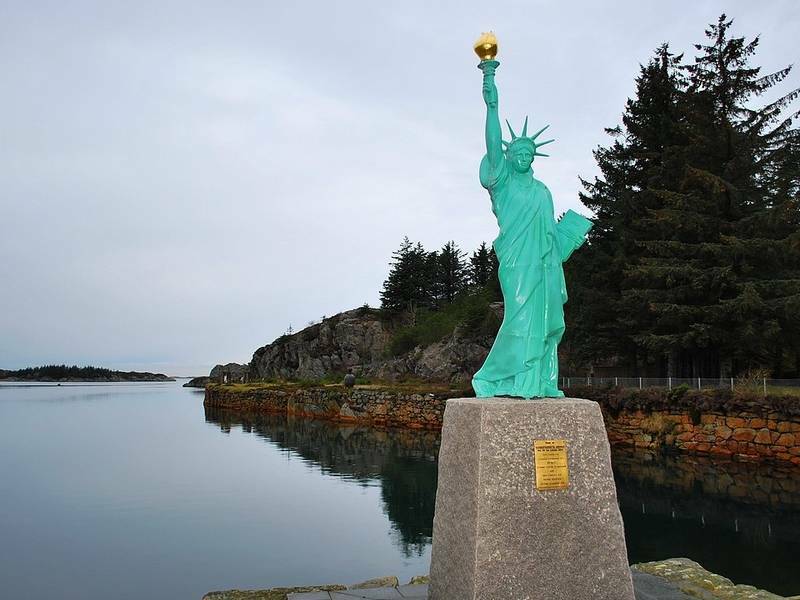 In Norway the most interesting statue is located on the island of Karmoy at Visnes, a mining town where copper was extracted used for the construction of the original statue. This is to commemorate the provision of basic equipment that can be built this replica. Karmoy, is in the southwest of Norway. There is a museum of copper. The reproduction of the image that we see is copper, of course. 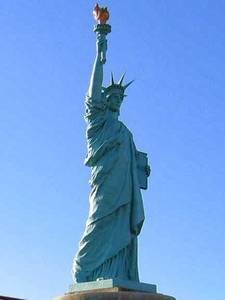 The Statue of Liberty is consistent, apart from its size of course. It is before a Norwegian pub and has no other purpose than advertising. 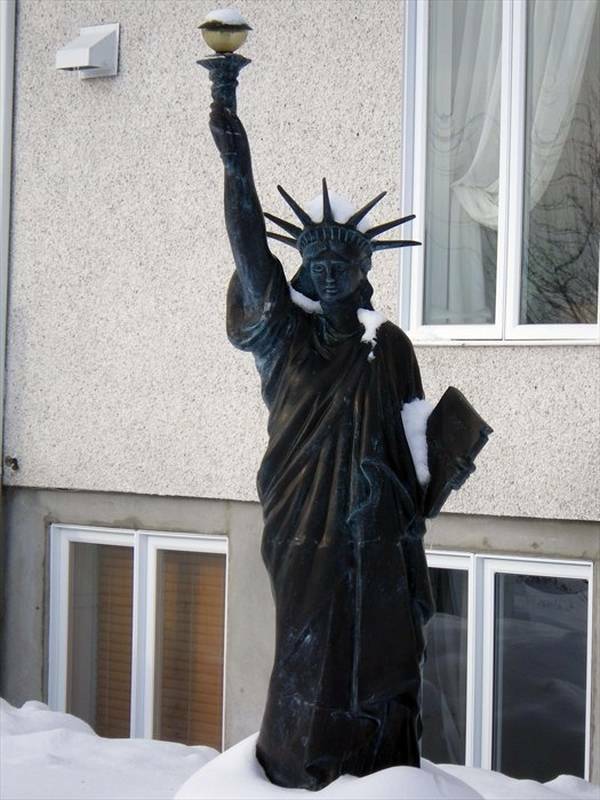 History has bequeathed a copy of the Statue of Liberty in Ålgård, Norway. 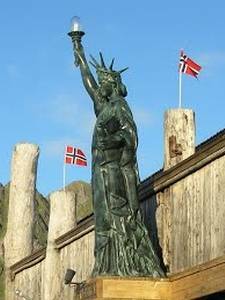 This is due to the encounter between an ambassador to the United Nations Norwegian, native to Ålgård, and US Senator Robert Bennett. The two men, who had met atop the World Trade Center, concluded business. 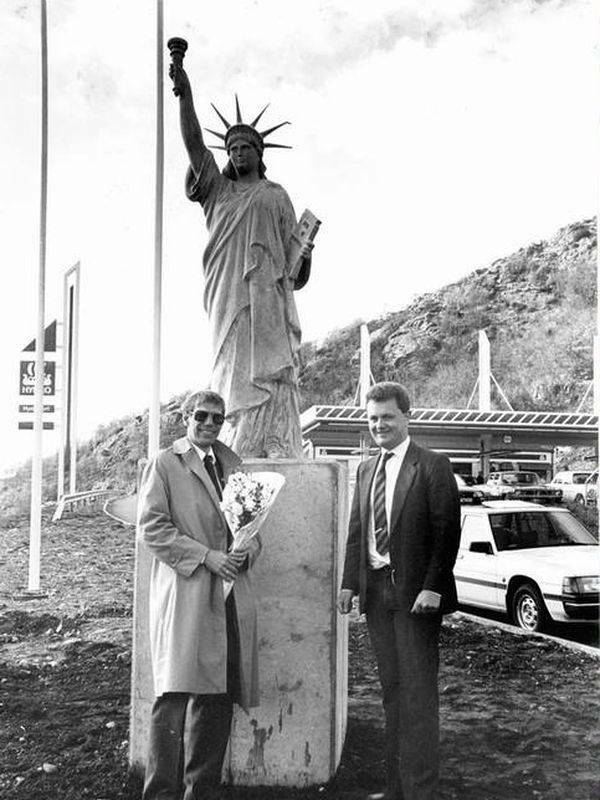 In appreciation and more personal, Senator offered the nephew of the ambassador a copy of the statue he had installed in Ålgård. It was mounted on a rather sad concrete block on the roadside. Damaged by time and weather, it had to be destroyed. It has not been replaced, but the concrete block still exists there. 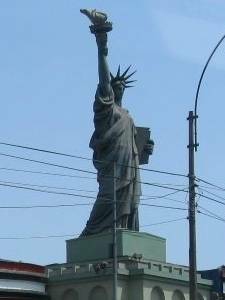 If there is a country where one does not expect necessarily to the presence of a copy of the Statue of Liberty, it is Pakistan. Yet two replicas are visible on site. 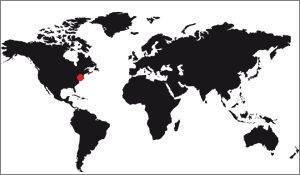 Their exact location is hard to say, we do dispons little information about them. It seems whether promotional, touting the merits of the next housing estate in cities and Bahria Islamabad, where they speak of "Phase 8" for this project. See above Replica of the Bahria, Pakistan. 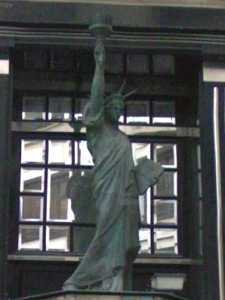 This Amsterdam's replica of Miss Liberty is located in Prins Hendrikkade 55. It is close to the Central Station. Exactly she stands on the shelter of the great coffee Kroonprins. It seems to be cement and should do well its 2.5m high. The torch, which is original, is very pretty. It changes the eternal standard bulbs that we usually see. 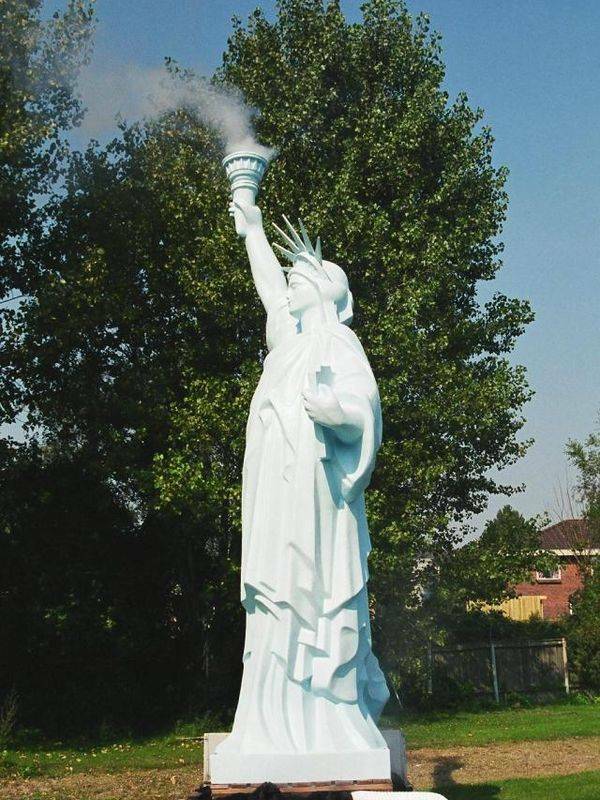 Another very nice statue of Liberty located in the Netherlands, in Drijber. Its exact address is 7 Kanaal Oostzijde, Drijber, Netherlands. She is in the garden of an agricultural cooperative. Drijber is a small village in the province of Drenthe, near Midden-Drenthe. It is in the southeastern Wijster. 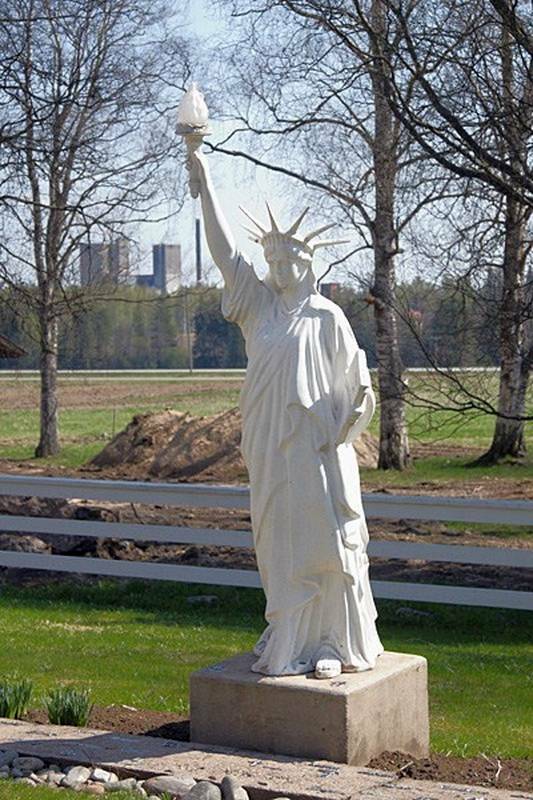 The statue is a beautiful pristine white, and its proportions are very good. 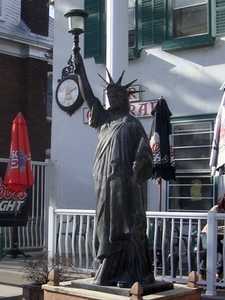 It seems to be a true copy of the original statue New Yorker. It's in the Netherlands found that strange statue's location in the garden pavilion. It is at the following address: Alendorperweg 12 in Vleuten, Netherlands. It is visible from the road, but can not be approached without the owner's permission, of course. 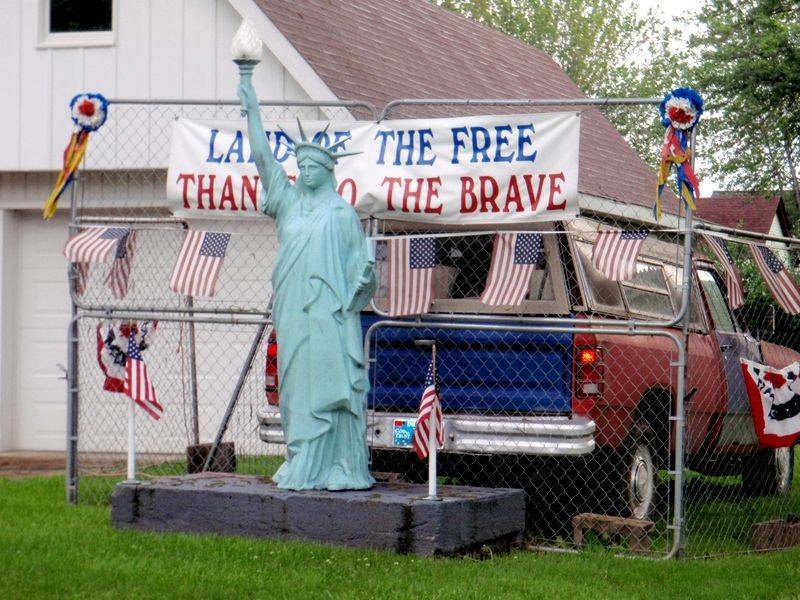 Curiously, just across the house is called "Freedom". In the town of Holten, the Netherlands, the visitor can see (by far!) 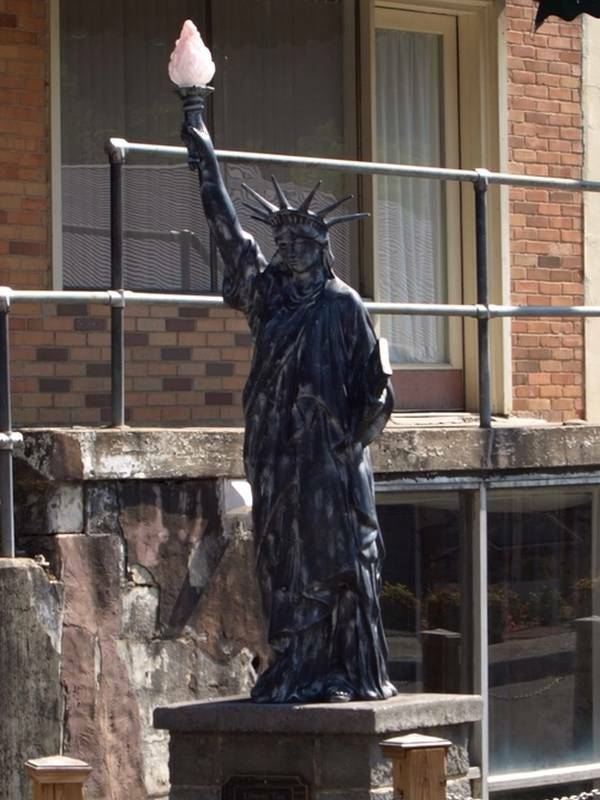 This replica of the Statue of Liberty very well done. At the top of Kaja restaurant, Charles Janssen property, is its emblem since a fire destroyed its first premises. It is at Nijverheidsstraat 39a, Holten. It is made of molded plastic on a steel structure. In addition to height, it is illuminated at night. 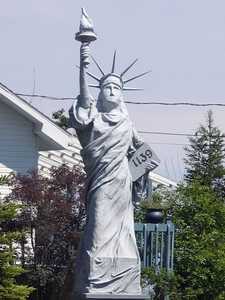 This replica of the statue is advertising purposes. It is situated in the agricultural village of Ripje ('t), on the grounds of the farm "De Lepelaar" probably the owner's name. Quite well done, this statue stands next an old extra long cadillac. The statue is not perfect, it has many flaws, including the torch, poorly reproduced, and the rays of the crown, too thin and vertical. 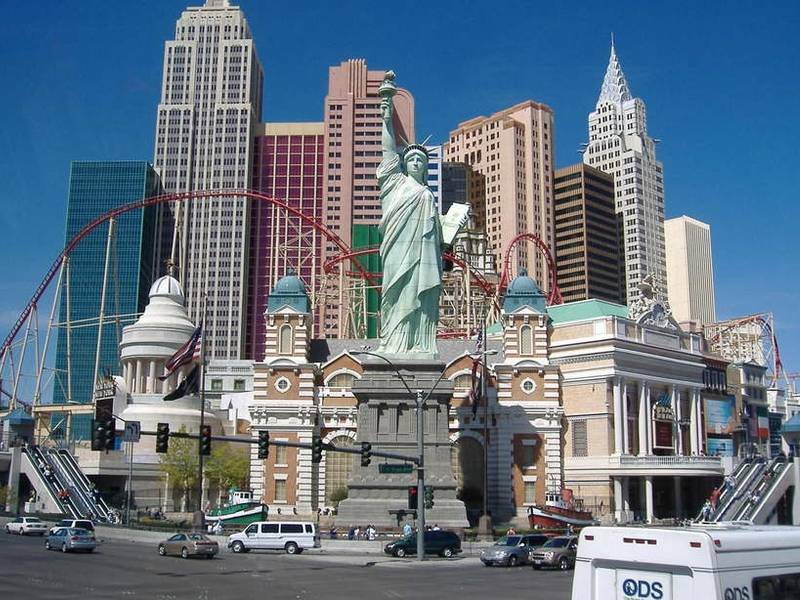 A beautiful gray-green copy stands in front of the casino "New York", which this city theme. 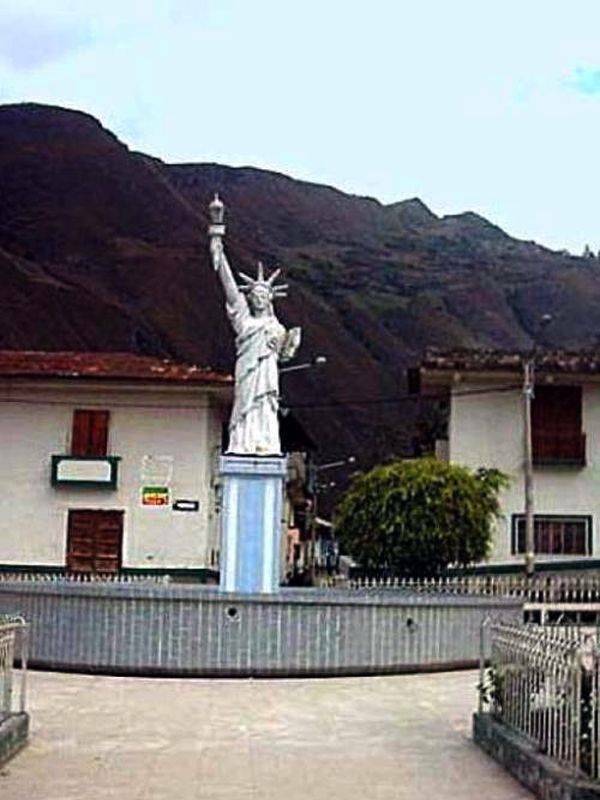 Peru is the little Statue of Liberty, a replica actually quite well done, although deriving from the existing model. It is in the city of Cutervo in the Andes. Placed at the center of a basin, this reproduction is quite small, no more than 3m high, probably 2m50. It serves light, no doubt it is illuminated at night. That's a pretty small Statue of Liberty in the Philippines. 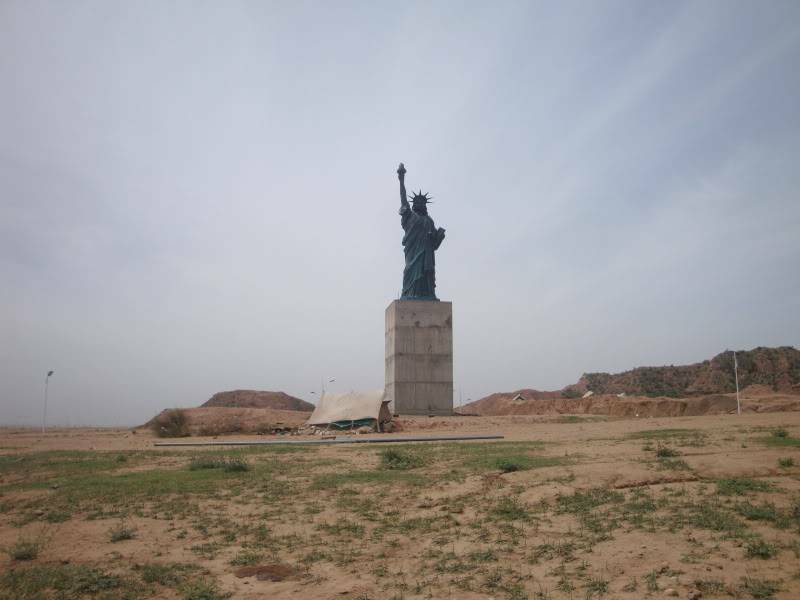 This is a memorial has been erected by the American community on the site of a former US military base. 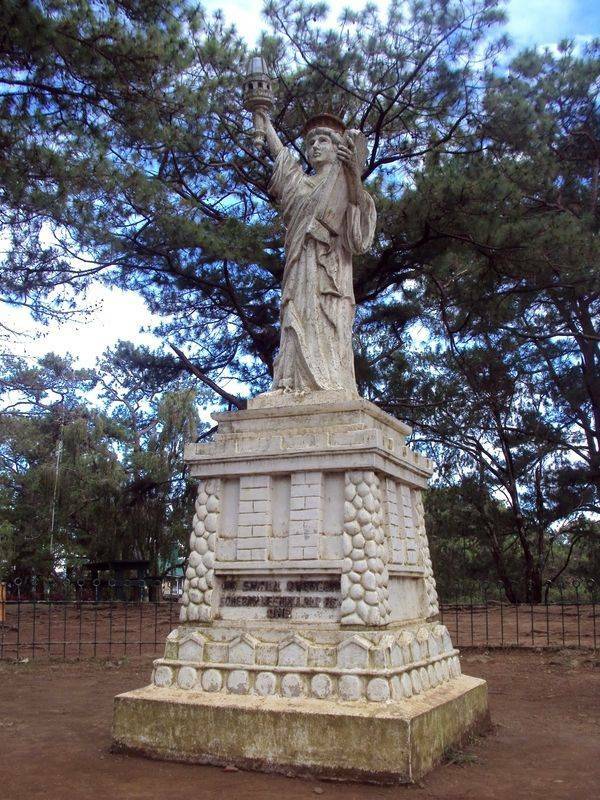 This base was called "Camp John Hay" in Baguio City. 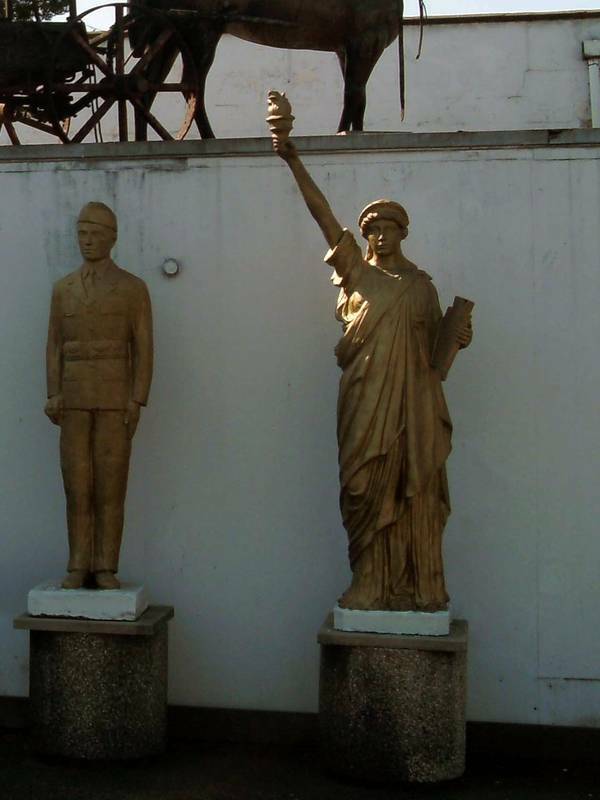 In the city of Inwald, Poland, is this copy of the Statue of Liberty. 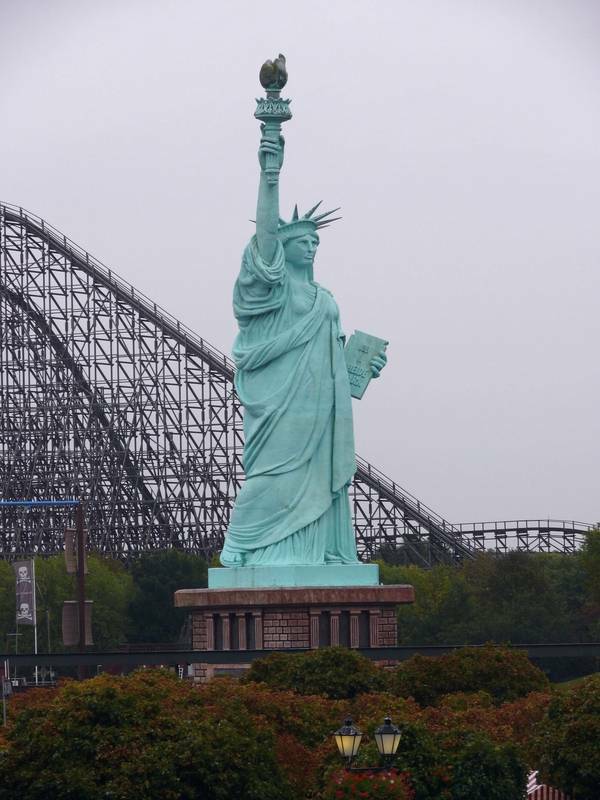 It is an amusement park where cotoyent different monuments of world heritage. This replica is unfortunately poorly made. The toga is impressive realism, but it does not match the original statue. But what shocks the most is probably the rays of the crown, who go too far and are too spaced horizontal. Looks like she is wearing a beret! Note the quality of the base, perfectly reproduced, even if it is partly sham. 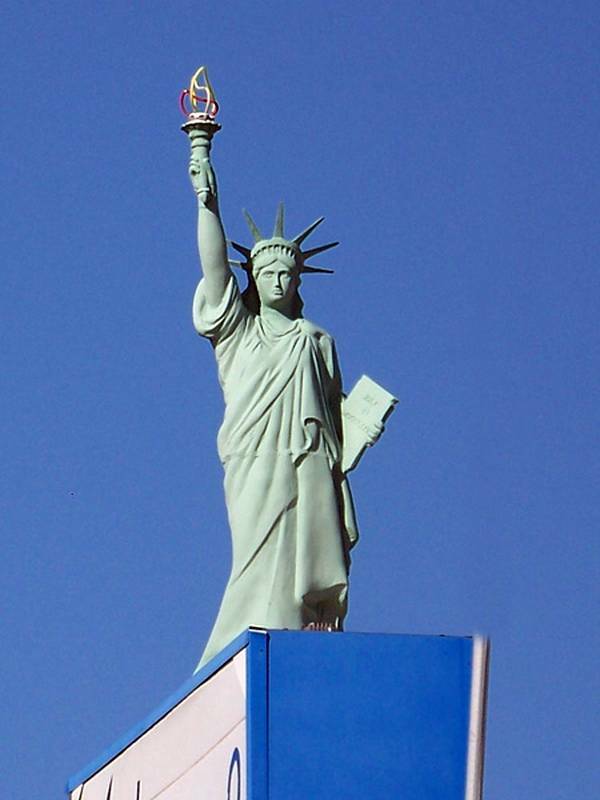 A Koromany there is a factory, "European Data Project" which has the symbol at the entrance, the statue of Liberty. She is holding a logo, probably that of the company, instead of the usual torch. 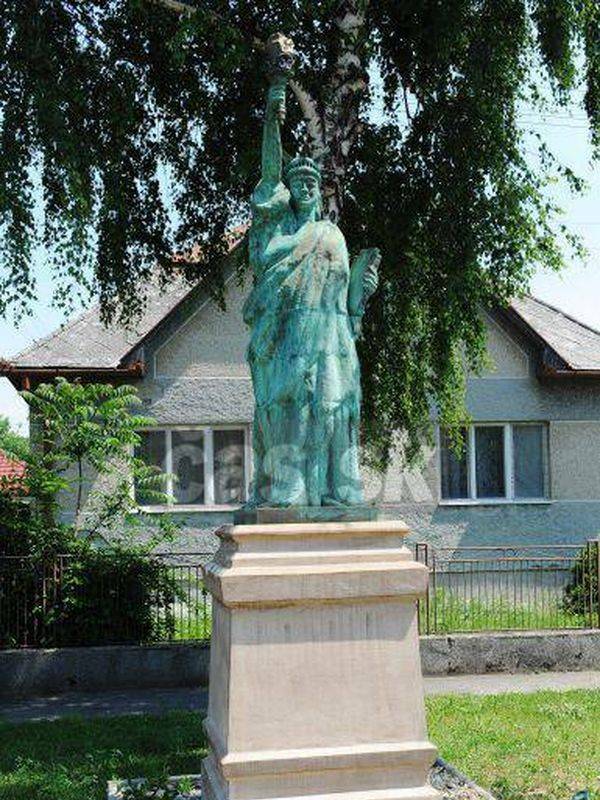 The Statue of Liberty is located in the north of Moravia in the town of Vsetin. To be exact, it is street of the Americas. Measuring 4.1 feet high, it was made by an artist who migrated in the Czech Republic, Vsetin. He needed 6 cubic meters of concrete and 120 kg of steel to strengthen it. Its pedestal is made of artificial stone. 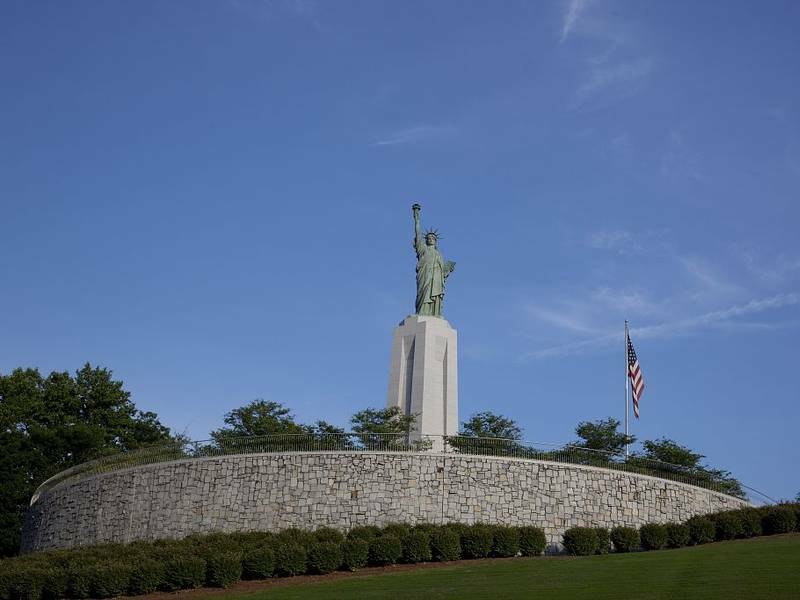 A small replica was used as a memorial to the "Liberty Memorial Wing." 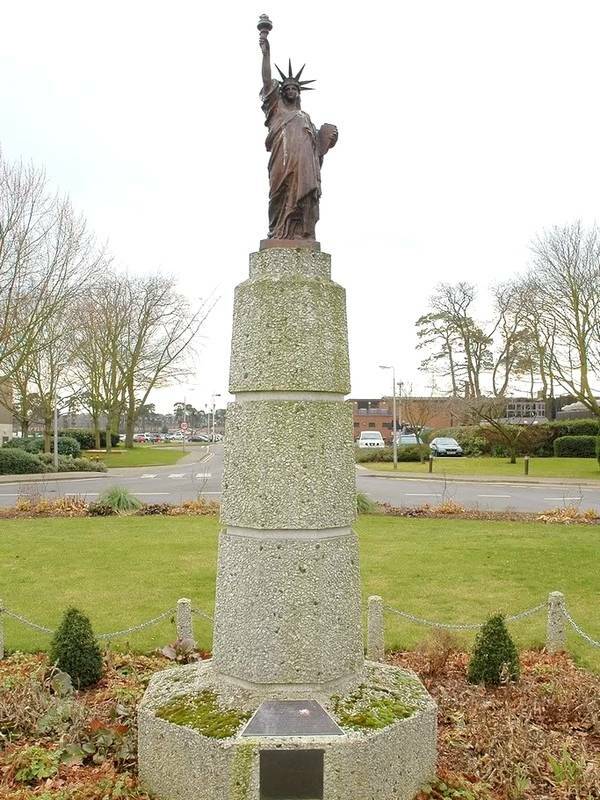 This memorial was made to celebrate the double anniversary (40 years) of the Royal Air Force Lakenheath and 18th "Fight Tactical Wing" on 25 November 1981. It was hosted by the club of wives of RAF officers Lakenheath to the American air base. 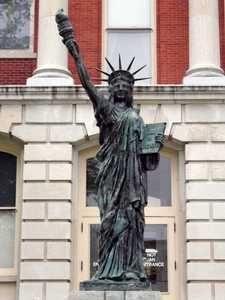 The statue comes from an original model of Bartholdi. 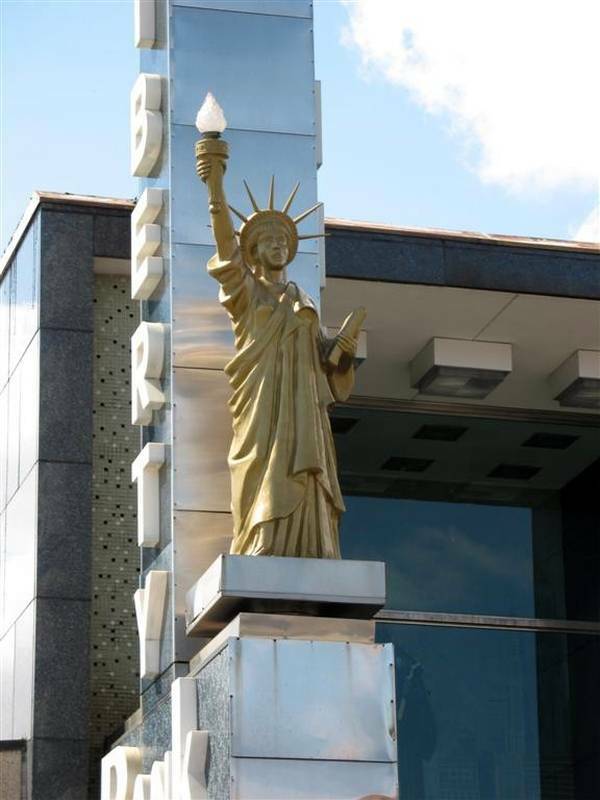 This replica of the Statue of Liberty in front of the entrance to a pizzeria in the center of Novosibirsk. 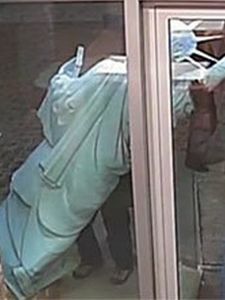 She made headlines when it was stolen on 27 November to 5 am by a group of drunken youths. Surveillance cameras have established theft, the picture comes in against. Difficult to say more on this copy of the statue, but through the image provided it appears to be rather well done. 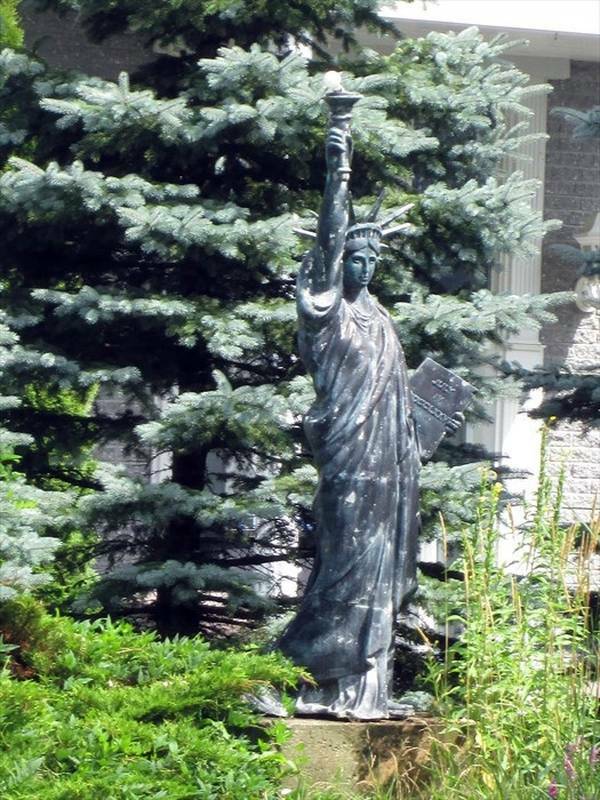 This replica of the Statue of Liberty is the work of Vladimir Eperjesi, an artist specializing in metal work for Ruskova. 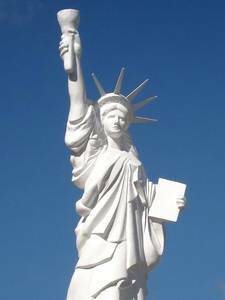 He designed a series of replicas of various emblematic monuments of the world, including the Eiffel Tower, the Tower of Pisa, and of course the Statue of Liberty. These works are exhibited at Lake Kuchajda, but he is hopeful that the case, a little later, in Bratislava, the capital of the country. But the request he made for the installation of these works in Trebisov park, downtown, has not received a favorable response. 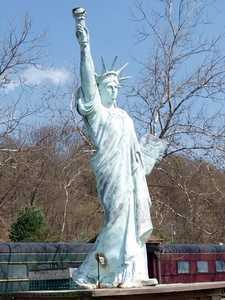 This statue is not consistent, there is no much problem she has a little overweight compatible with the reality of the New York statue. Probably copper, it was manufactured in several sections welded to each other vertically, which is why the traces of horizontal welds. The statue is now presented on a massive pedestal quite successful. This statue is the work of a blacksmith, Vladimír Eperjesi. 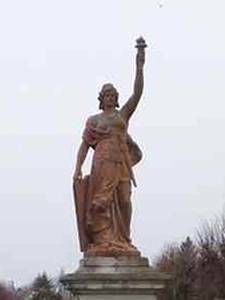 She was placed in front of her forge, 3kms from the center of the city of Trebisov, in the village of Nový Ruskov, along the main road. It is visible to everyone, just pass along the road. 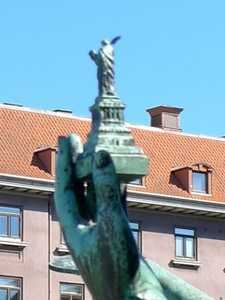 In the city of Gothemburg, Sweden, who has good eyes can see a reproduction of the Statue of Liberty. Why does it have good eyes? Because it is the smallest reproduction identified this site! It is on the main fountain of the city, a beautiful basin decorated with 5 characters holding in their hands the historical landmarks of reproductions of the 5 continents. 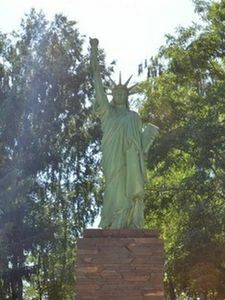 For America, this is the Statue of Liberty was chosen, hence its presence in small size in Sweden. 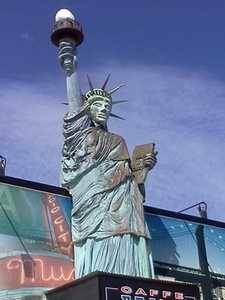 Here a statue of Liberty for advertising purposes. 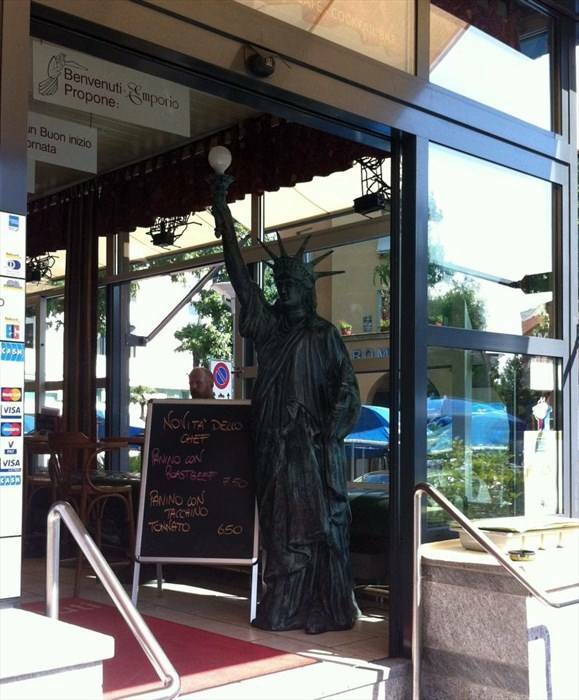 It is located at the entrance of a restaurant Locarno train station. The Emporio Restaurant is in the walls of the station. It measures approximately 2.5 meters and it is devoid of pedestal. 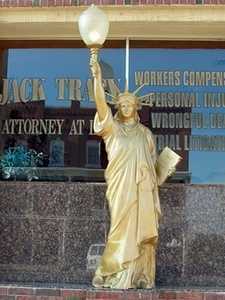 This is almost a copy of the original statue consistent, if not the horrible light bulb she holds in her right hand. 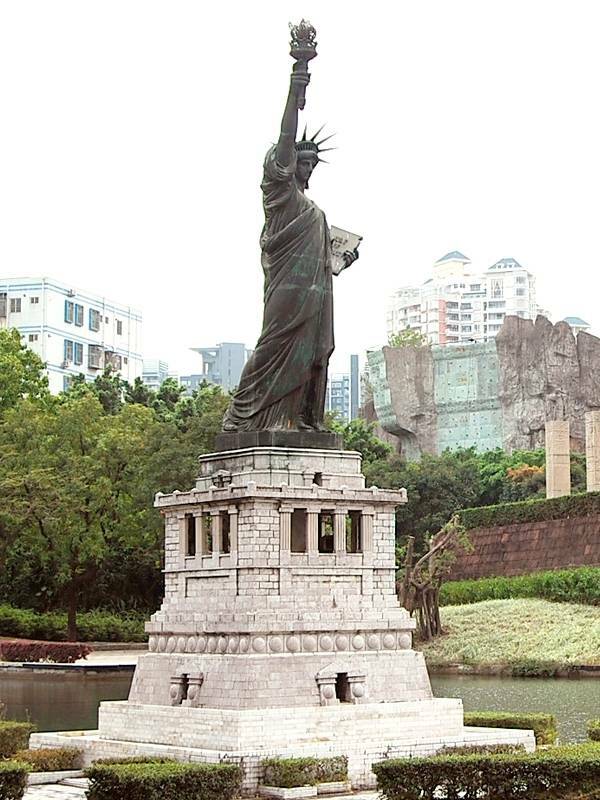 In Taiwan the visitor can find a replica of the Statue of Liberty near the Tower 101. 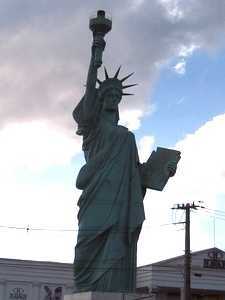 It is in the city center, in the "New York shopping area." (WM2QT5 and WMN76) Initially full of a golden color it is now fully graffée, but it was made voluntarily, in 2009, when held an art competition of graffiti. 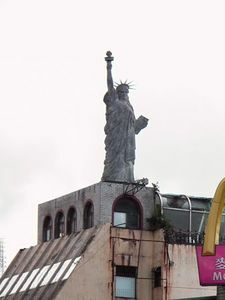 In Taiwan Keelung City has a replica of the Statue of Liberty, it is on the roof of a medium-sized building. Quite well reproduced, whatever a bit too thick, it is clearly visible across the city center. Pattaya is a seaside resort in Thailand, one of the largest in the country, it is relatively close to the capital Bangkok. 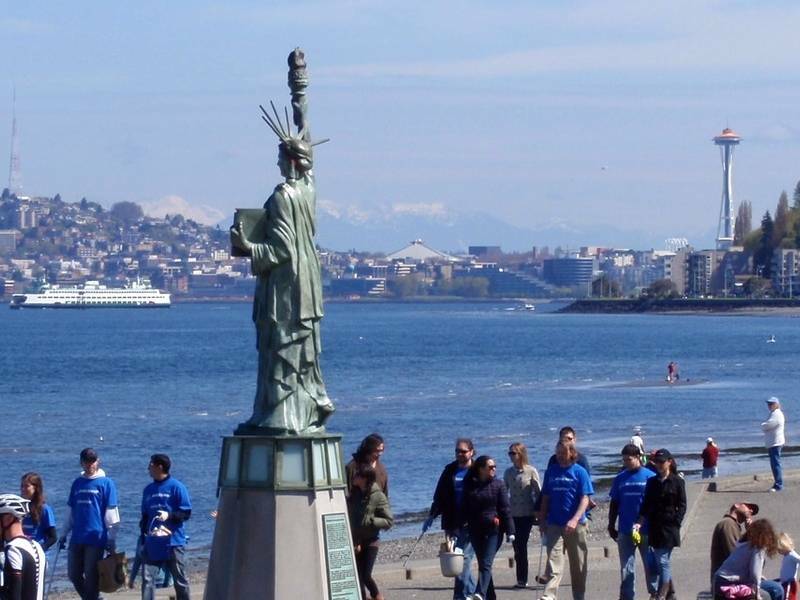 In this cosmopolitan coastal city, which attracts like a magnet to many nationalities, with the influx of tourists impressive, it is not so unusual that it find a replica of the Statue of Liberty. This is before a Thai restaurant enough class, Gulliver's restaurant on Beach Road, just north of the bay of Pattaya. There are several restaurants in the area where it is located. This statue is of great delicacy, but it is not as long as it is beautiful: In fact, if these traits are precise, impeccable drape, nothing in this statue is not true to the original: From torch in too great clearance down the too short toga, the tablet abnormal size to her departing rays in all directions except it takes, her face missed her too small crown, nothing comes save the statue of an aesthetic point of view. Nevermind no broken chains of slavery, missing as on most reproductions, but let's look a few seconds on the base, which merit. It is the same style as the original base, without the star shape, but lower, which is not surprising given that otherwise it would have been too high. In conclusion, this statue is unattractive, but the design techniques could make it beautiful. 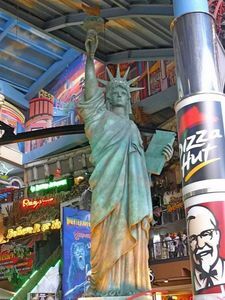 By studying the list of replicas of the Statue of Liberty in the World, we are surprised by the amount of theme parks showing replicas of monuments of the World. This is in Pattaya, Thailand. It shows a very well-made replica. Malhaureusement plastic, it is of great fidelity to the original statue with rays of buoyant crown (this is rare), a port of the proper tablet and a replica of the torch that seems perfect. It is perched on a white base not unlike the original, but it lacks a bit of height. This park is called Mini Siam. 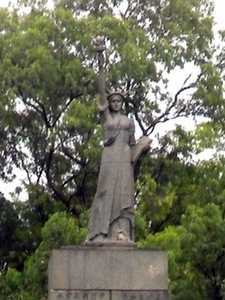 Ukraine has an original statue by her sitting position. 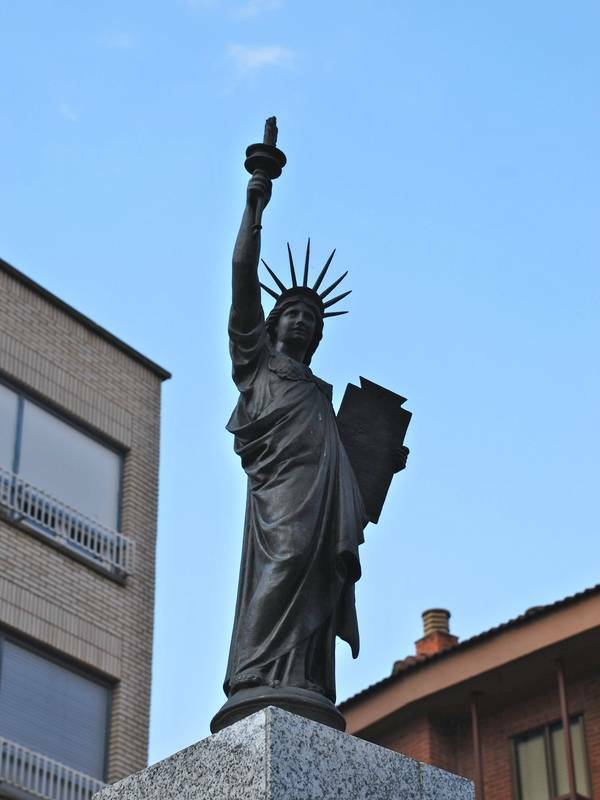 It is in the city of Lviv, at 15 avenue de la Liberté. It was built by Yuriy Zakharevych and decorated by the sculptor Leandro Marconi. It is located on the front of the Ethnographic Museum and the first arts. 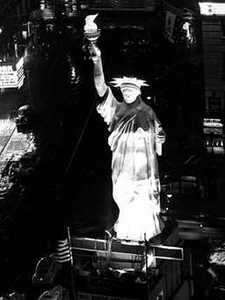 It is quite possible that this statue of liberty no longer exists today. 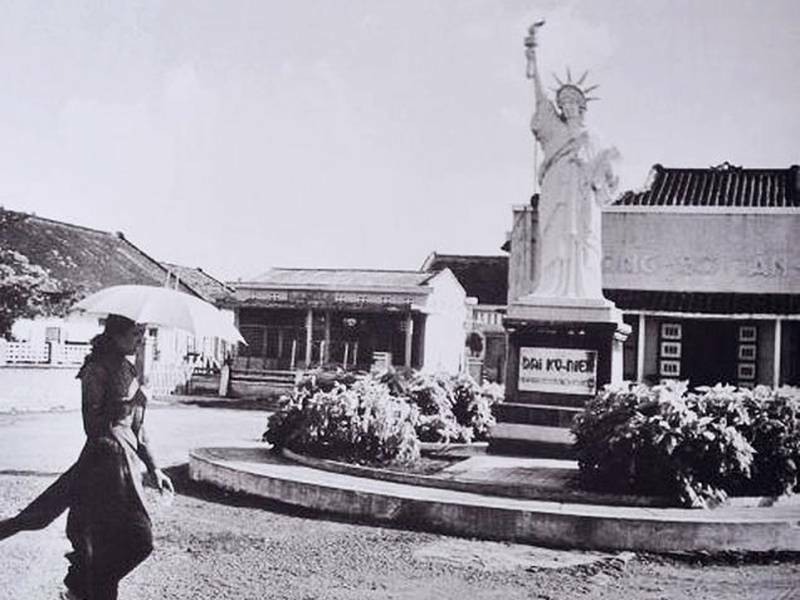 It was at the time of taking this photo, unknown time in the city square Cam Duoc, Viet-Nam, 30Kms south of Saigon. We suppose it has to do with the war in Vietnam, so we are in the 70s From firsthand, the statue seems to be quite realistic, well reproduced. 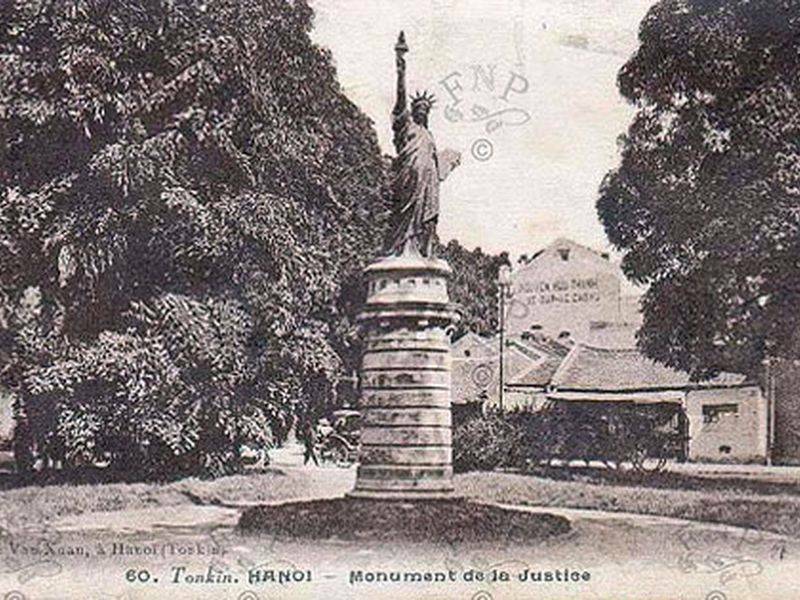 In Hanoi, during the colonial period the French had built a copy of the Statue of Liberty that was placed on top of the tower of the Turtle. Later moved to the Cua Nam Park, it was reversed in 1945 when the loss of Indochina by France. 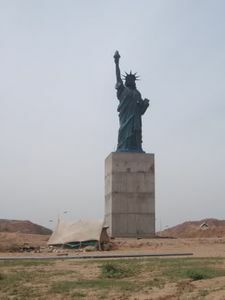 THE pictured against the statue shows shortly before its destruction.